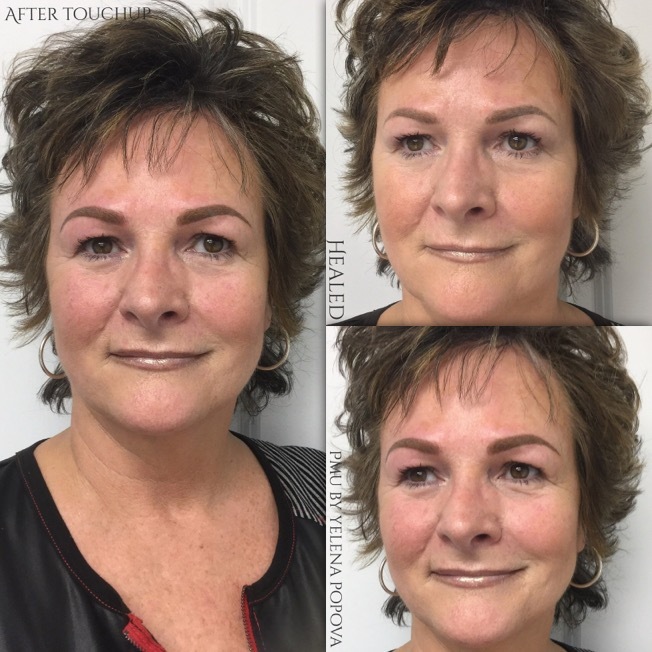 Nicely shaped and prominent eyebrows change the entire look of your face, giving a more youthful appearance that can simulate an eyelift! 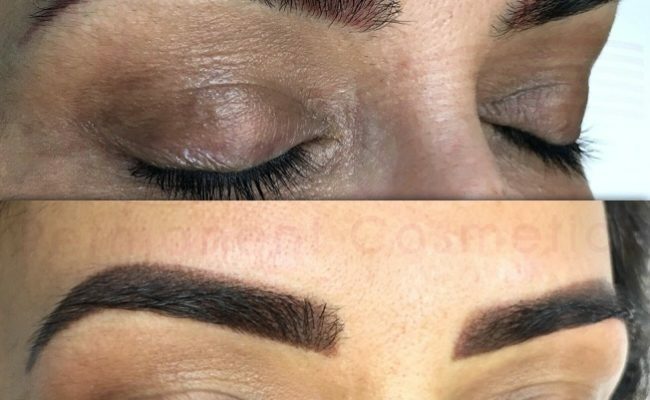 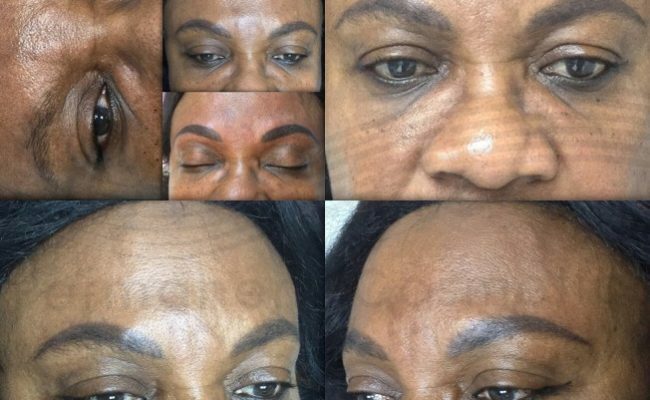 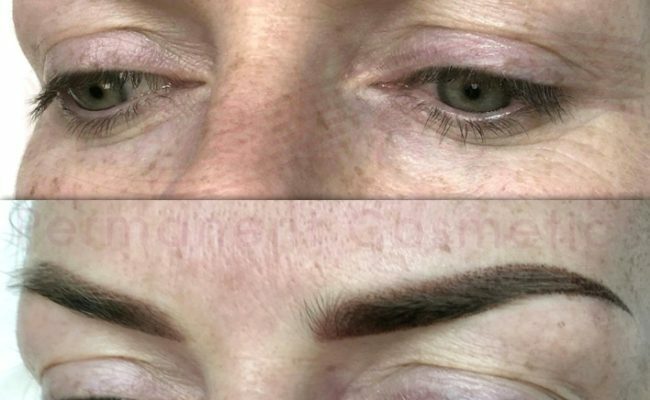 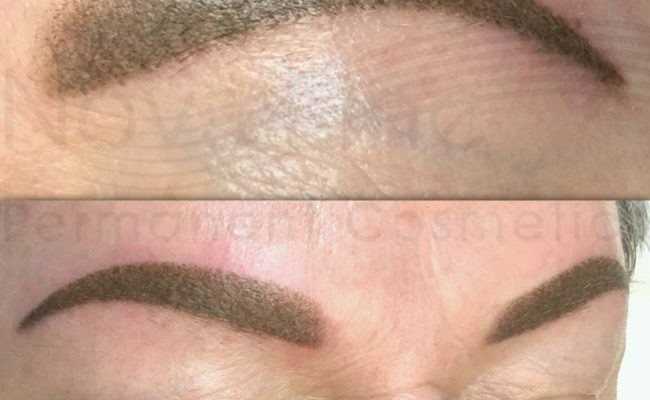 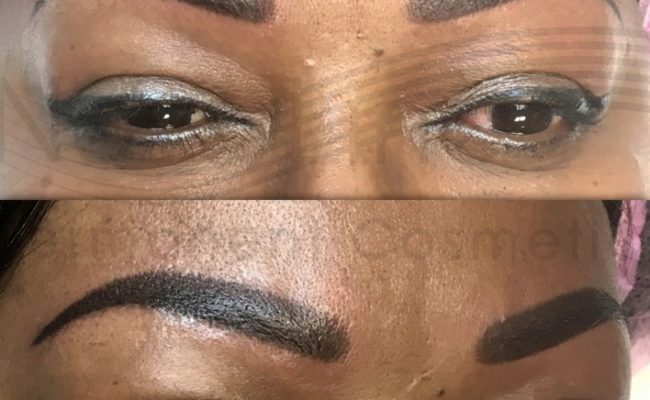 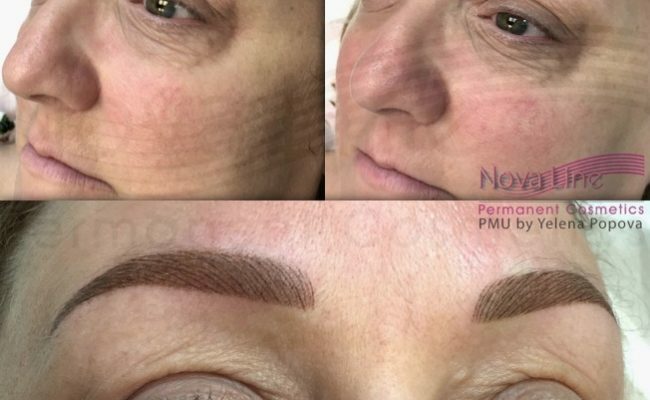 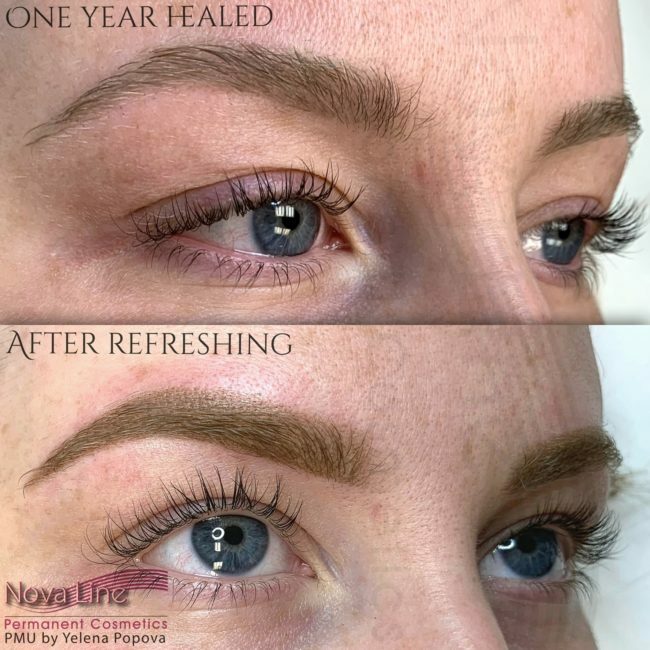 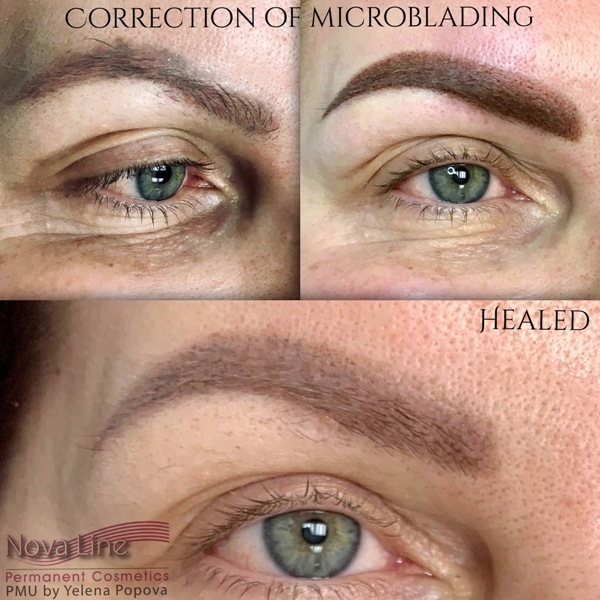 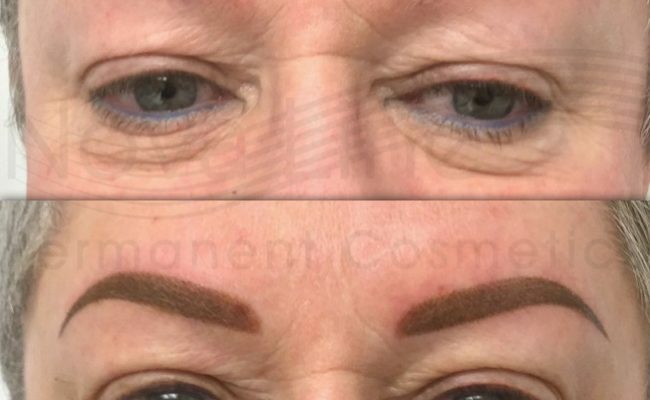 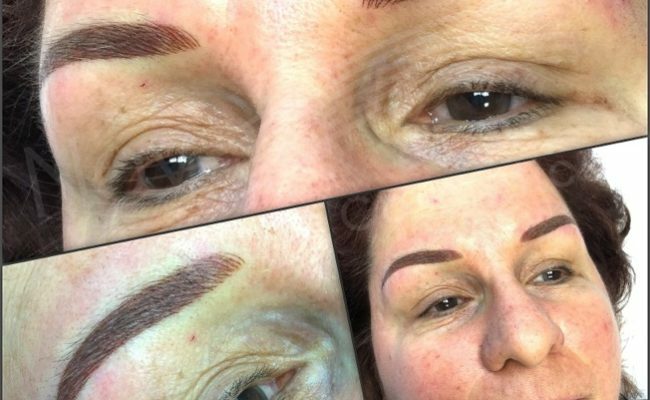 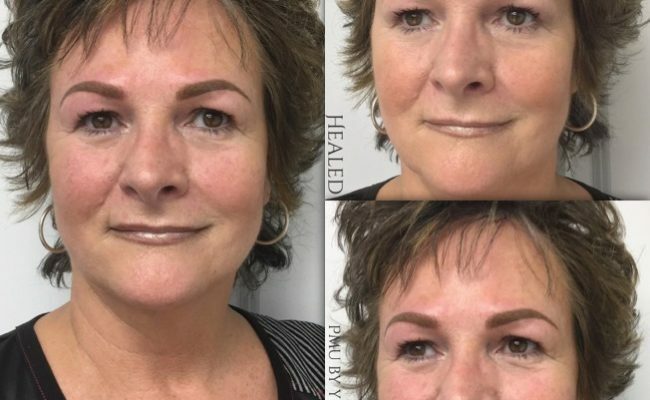 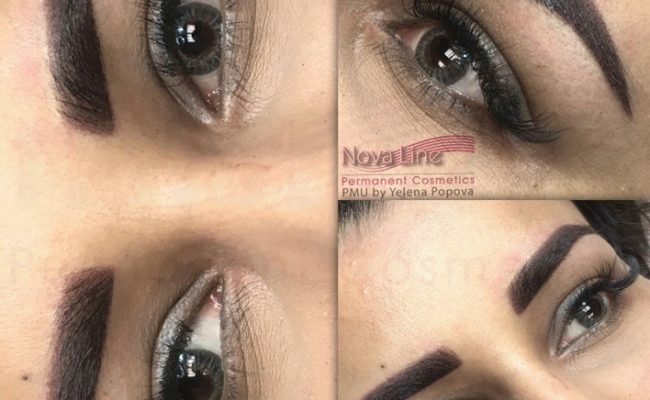 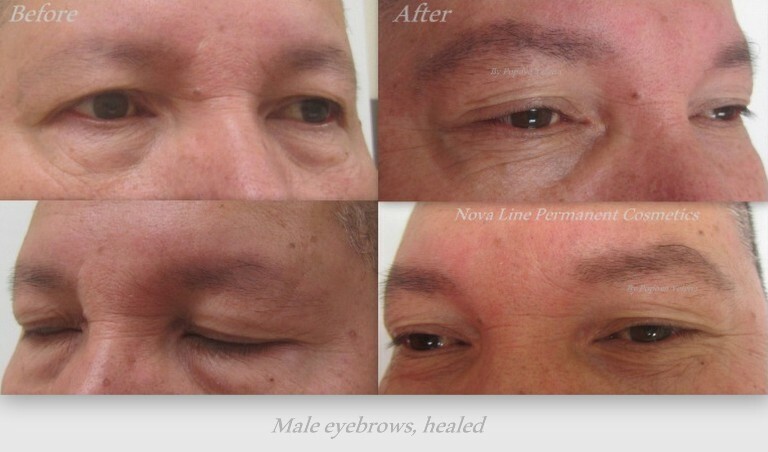 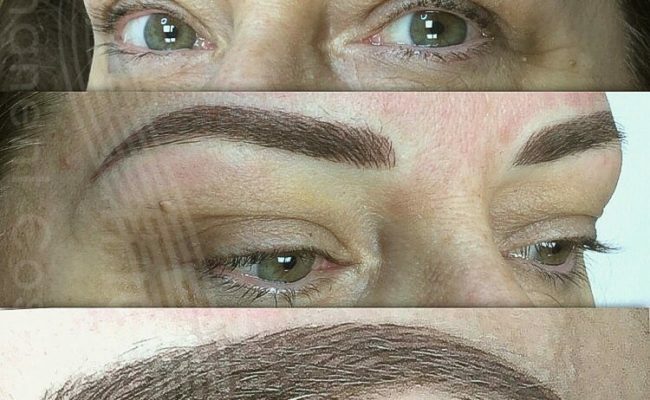 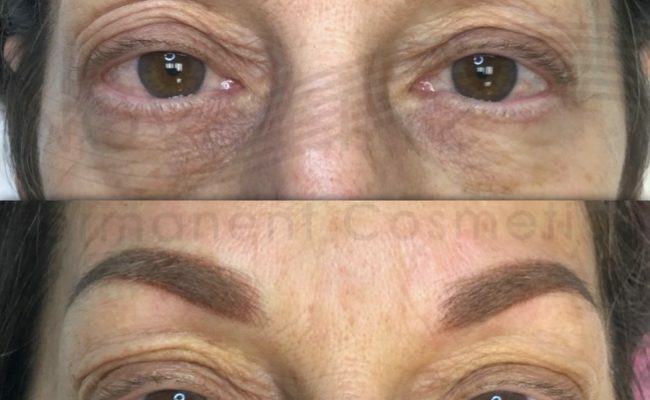 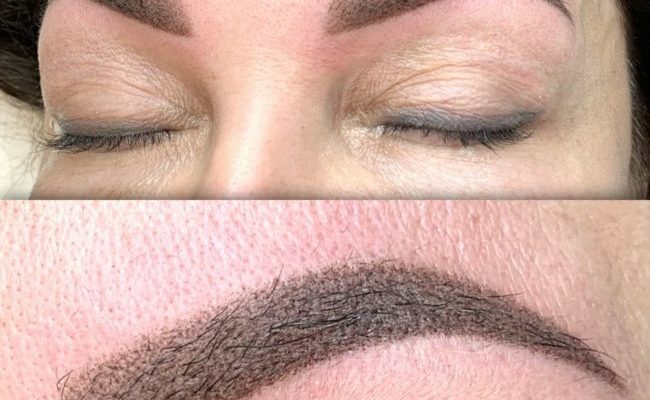 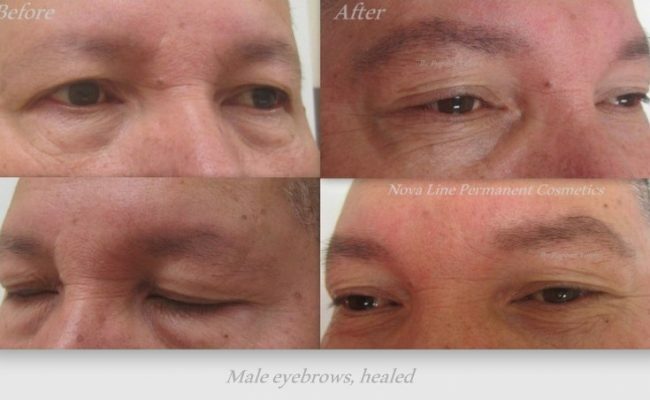 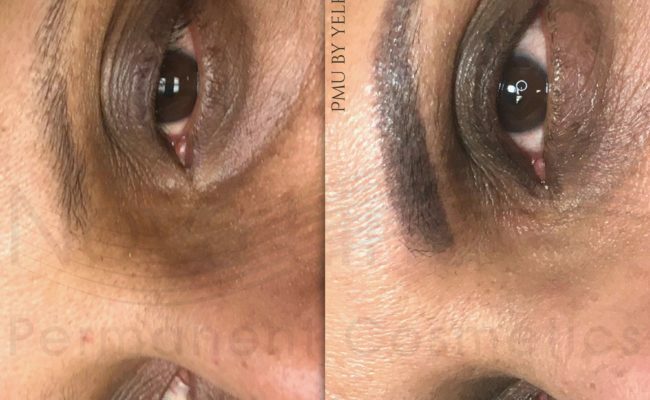 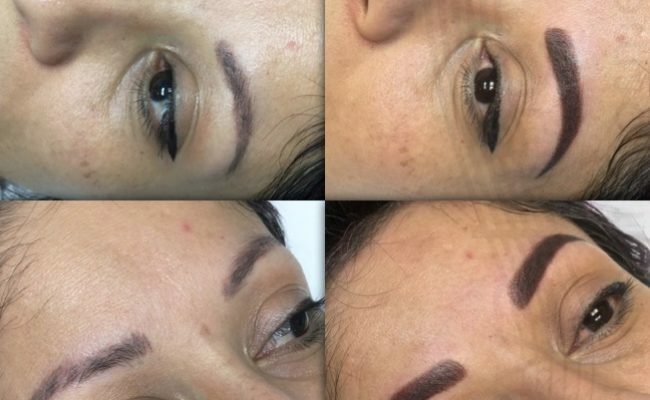 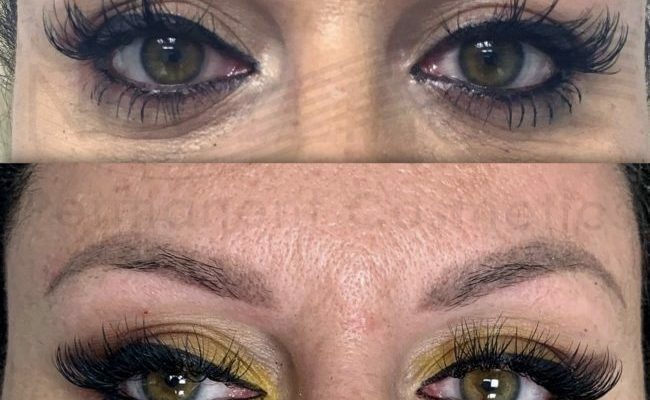 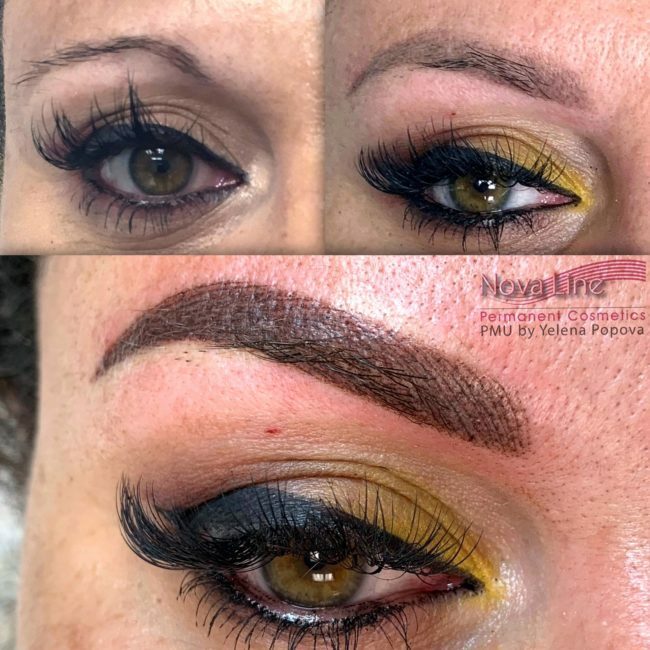 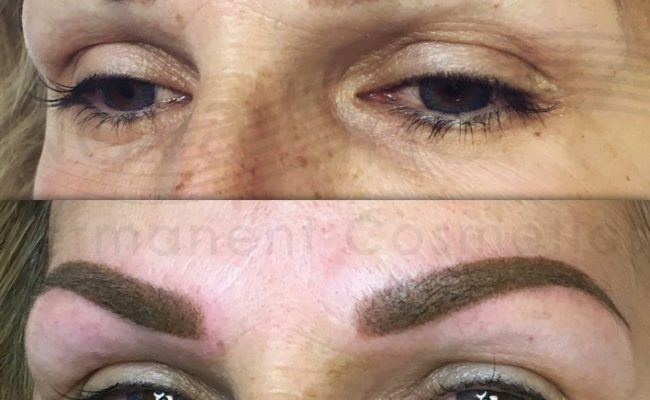 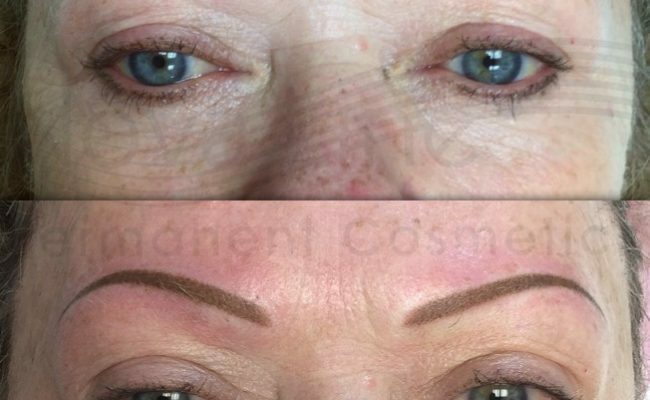 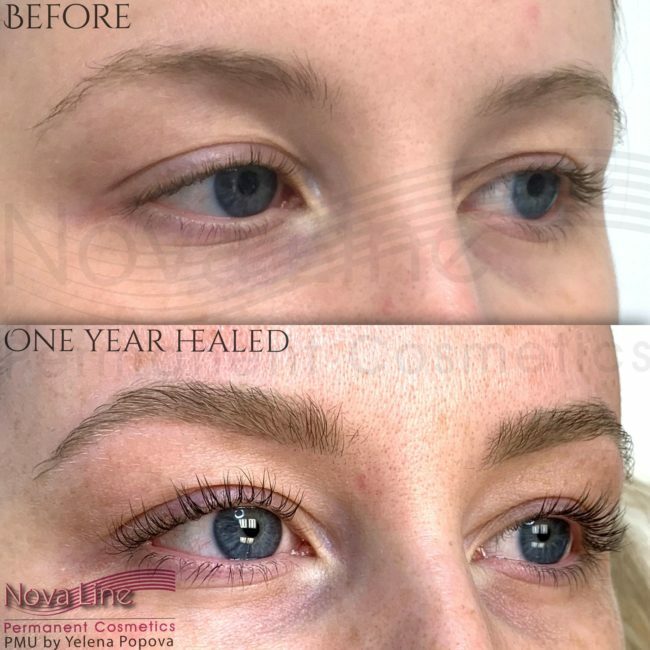 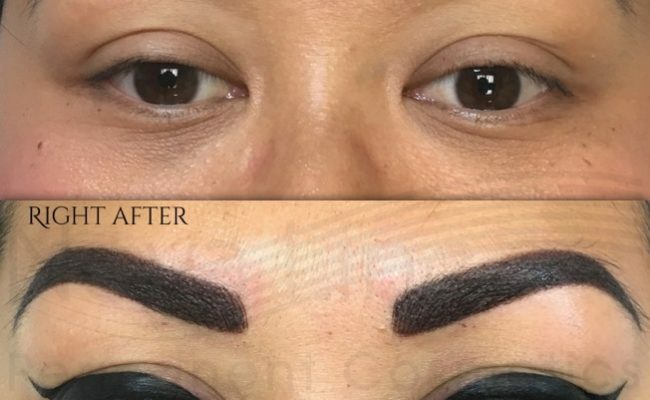 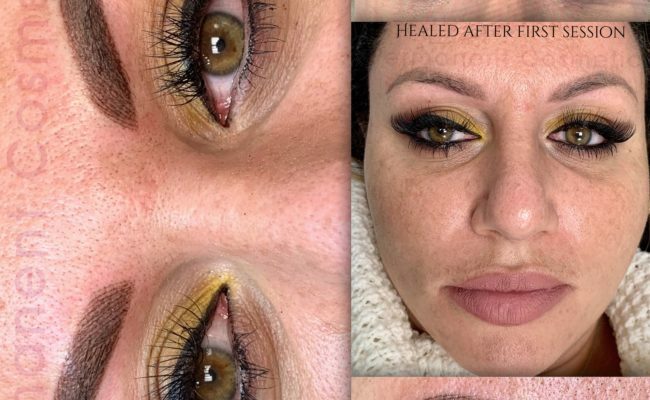 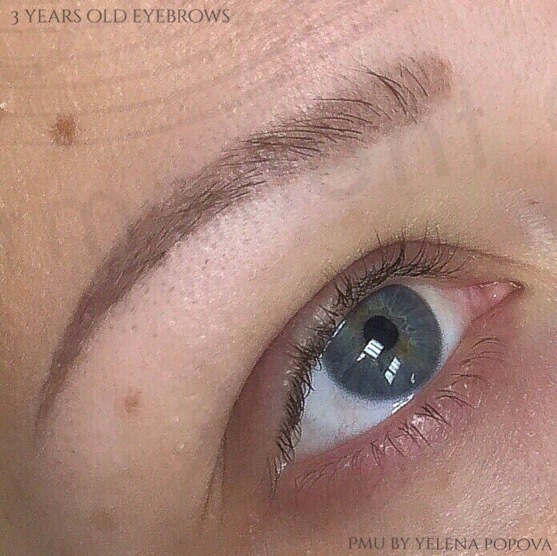 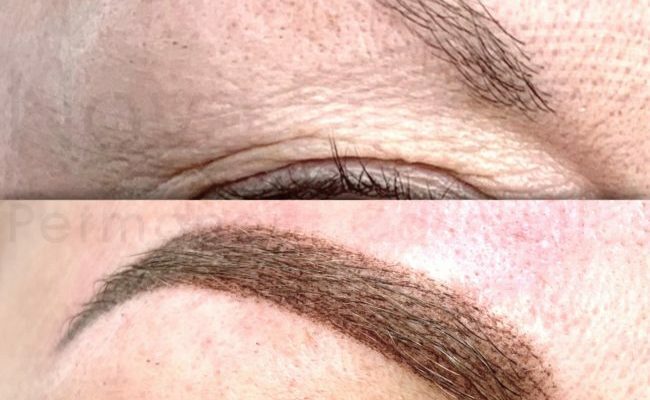 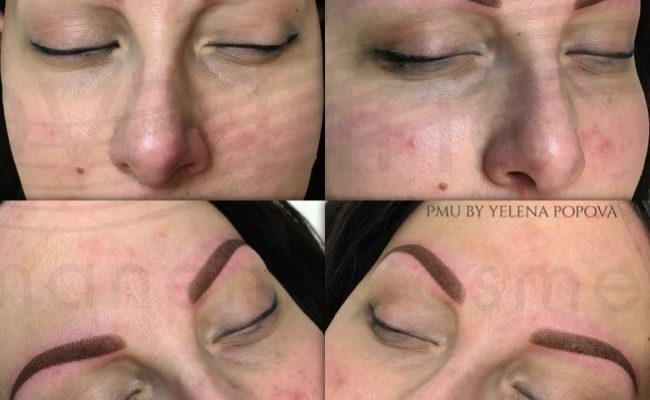 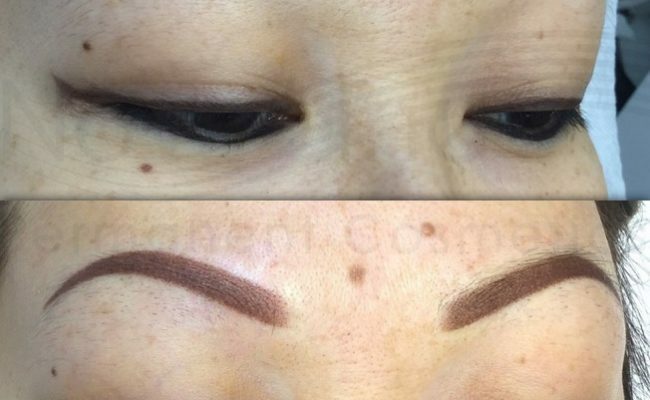 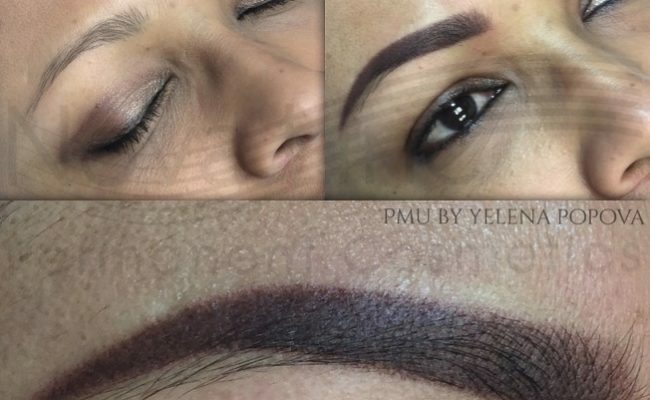 Permanent eyebrow tattoo started gaining in popularity, as well as credibility, when doctors in the 1980's began providing this service to those with facial hair loss, specifically from a condition called alopecia. 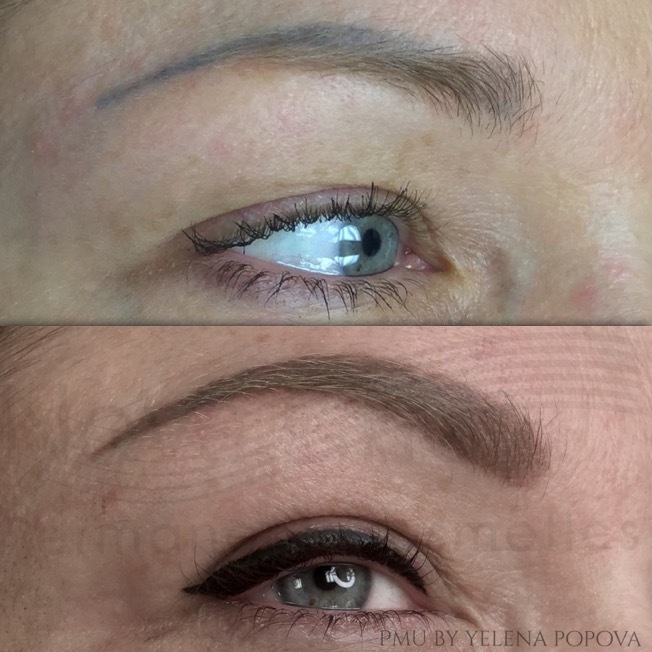 From the 1980's through the 2000's, permanent eyebrow tattoo was mostly applied in the same way a tattoo would be done and was not as precise and natural looking as it is today. 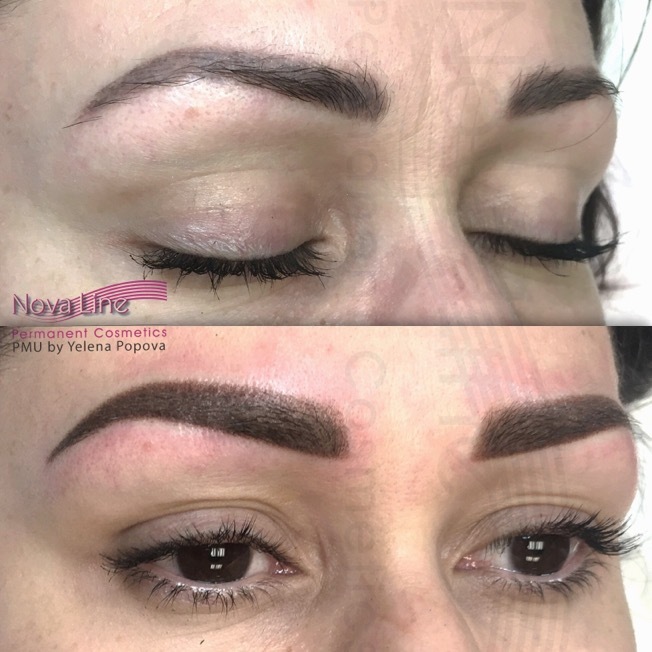 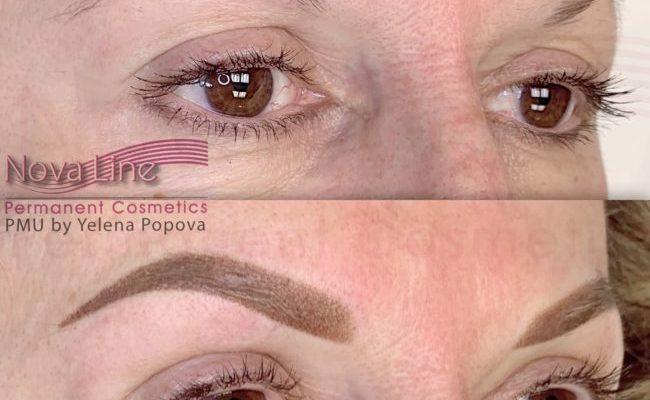 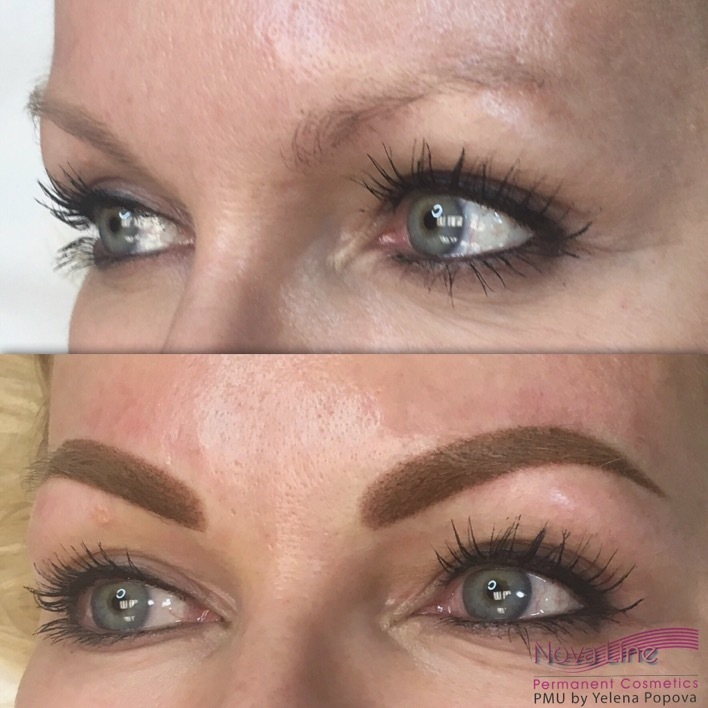 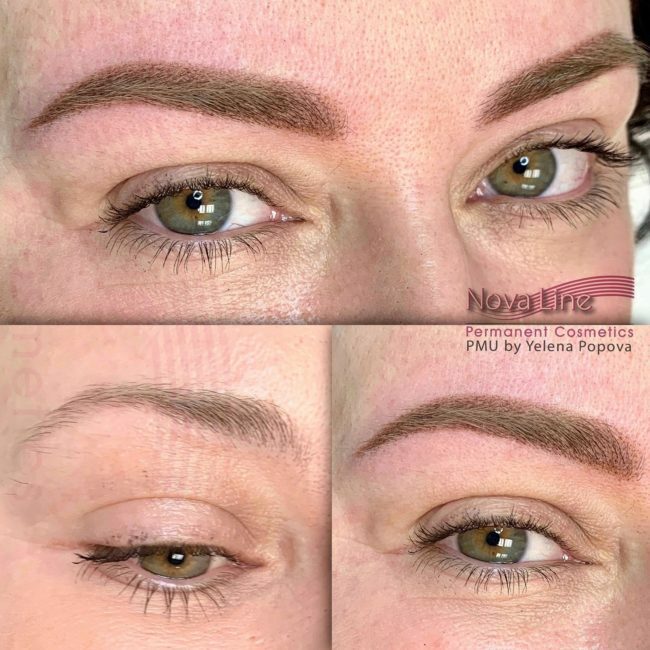 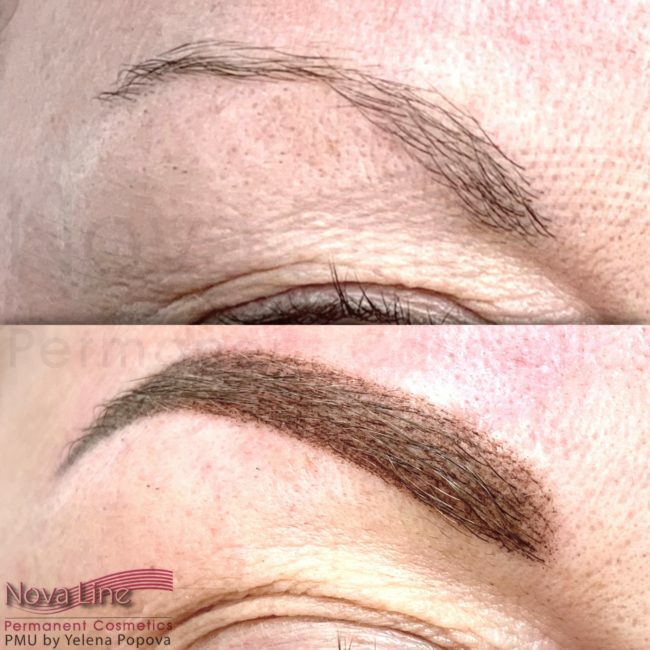 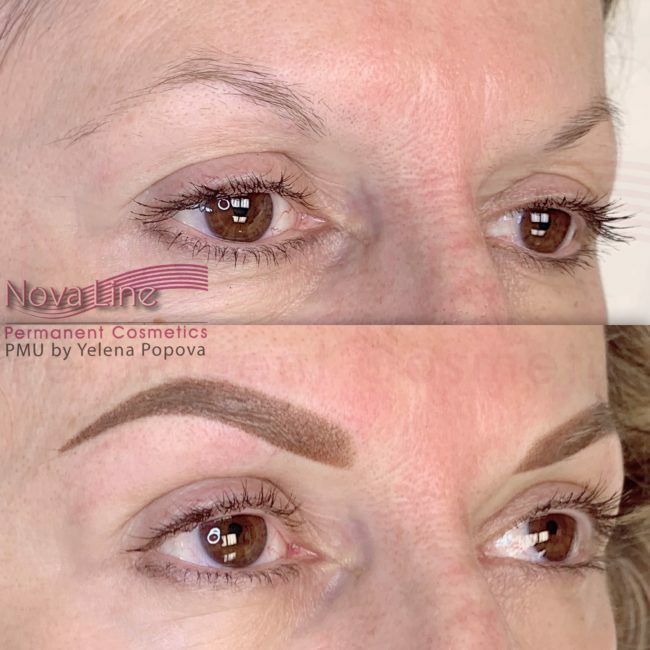 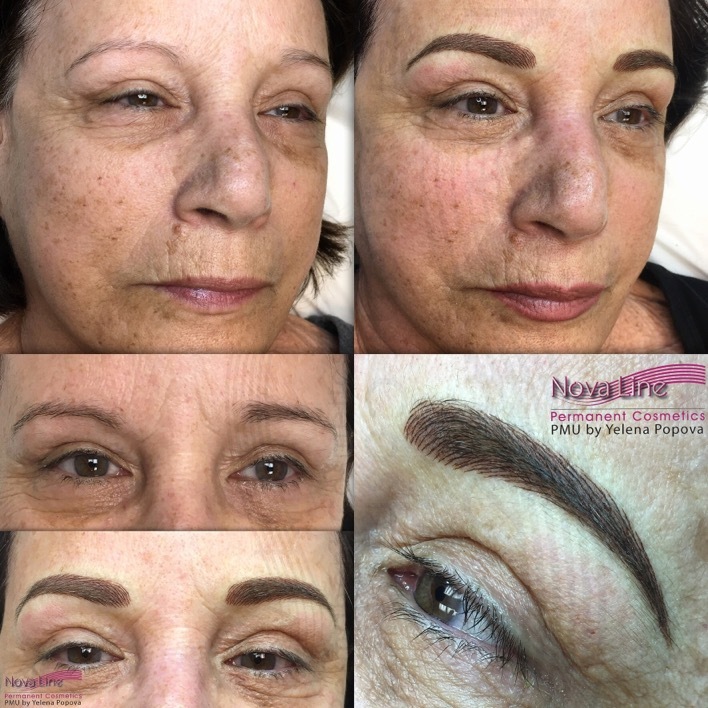 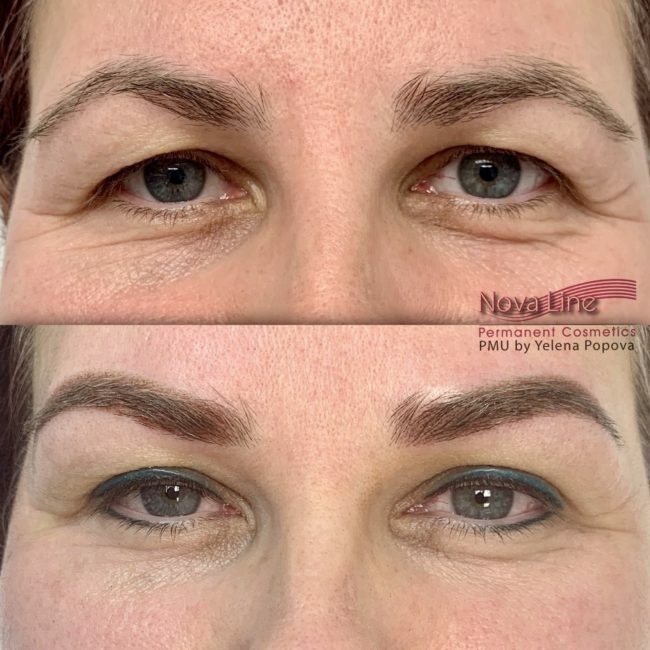 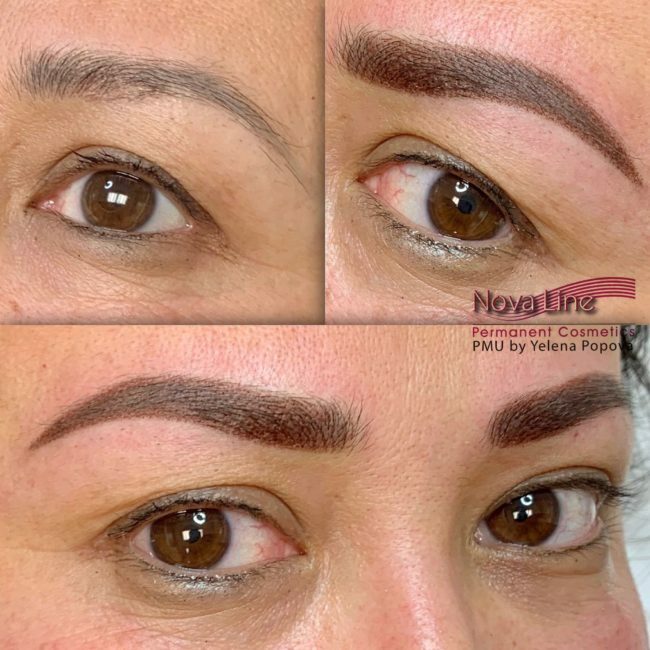 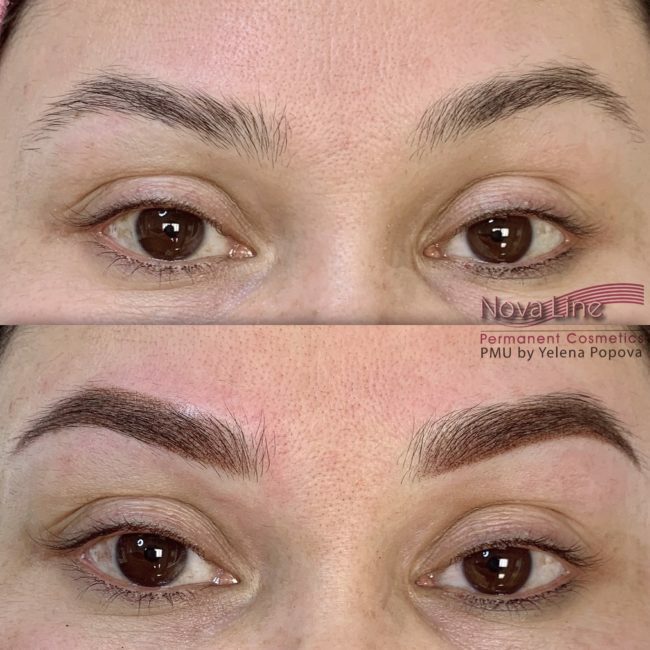 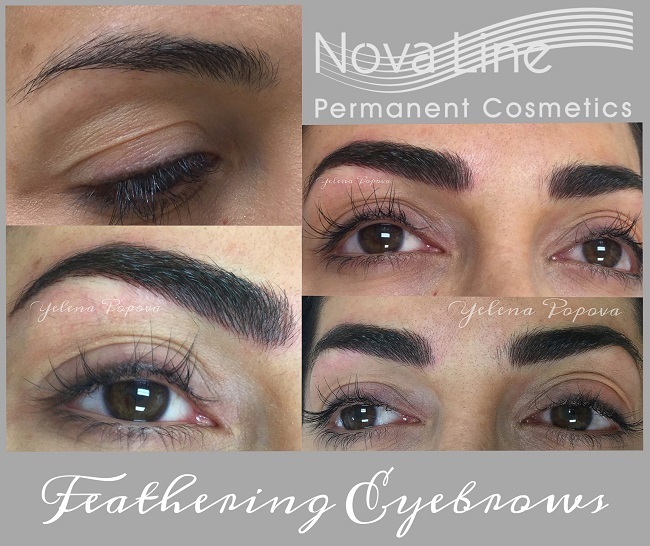 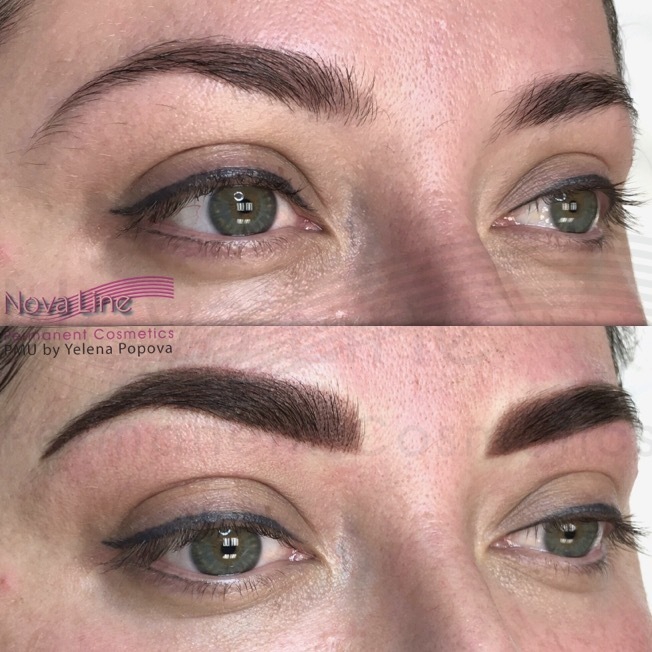 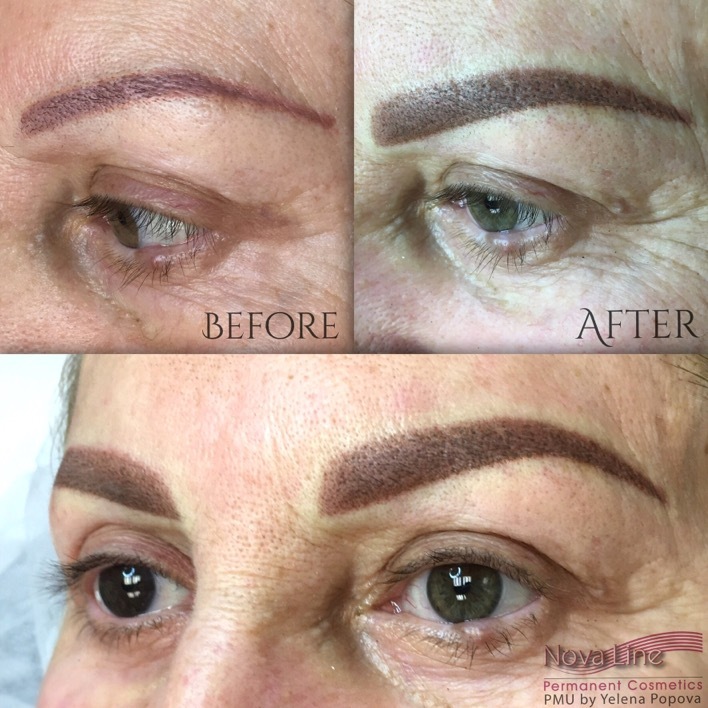 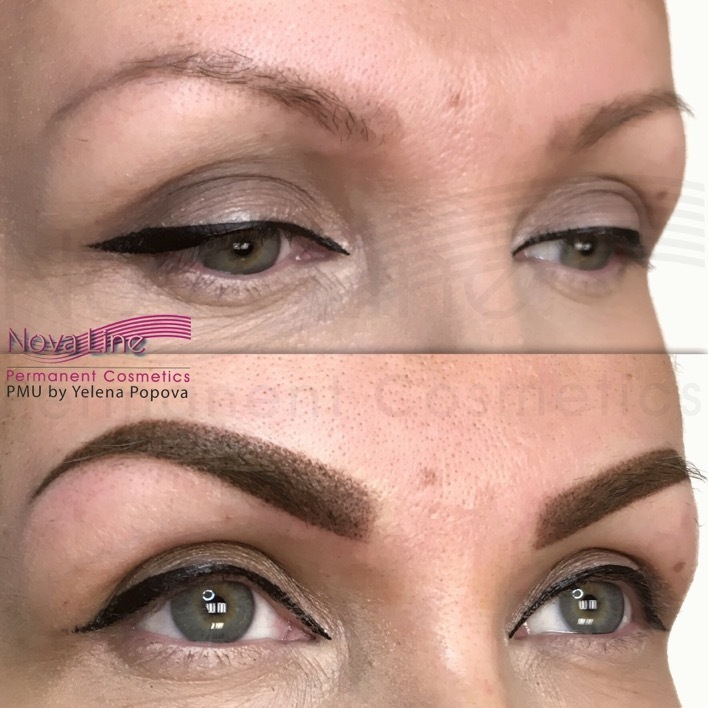 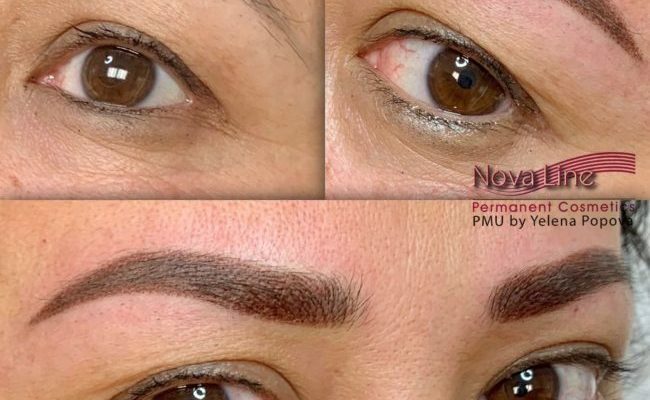 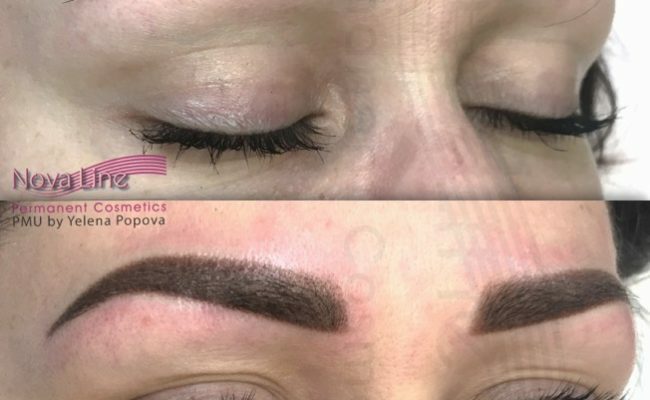 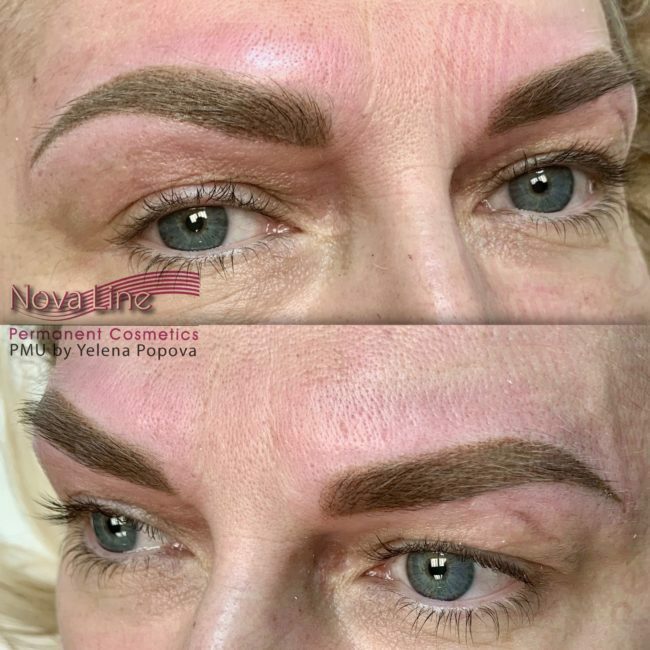 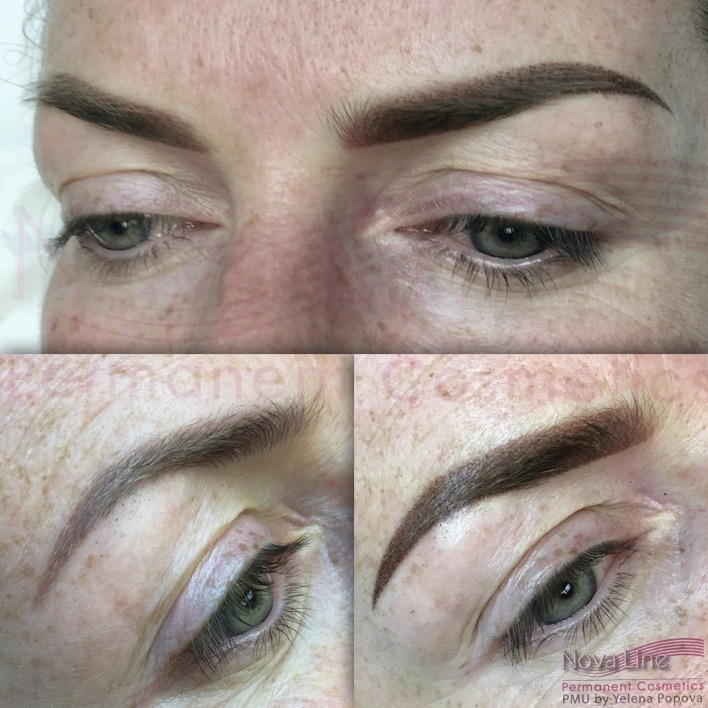 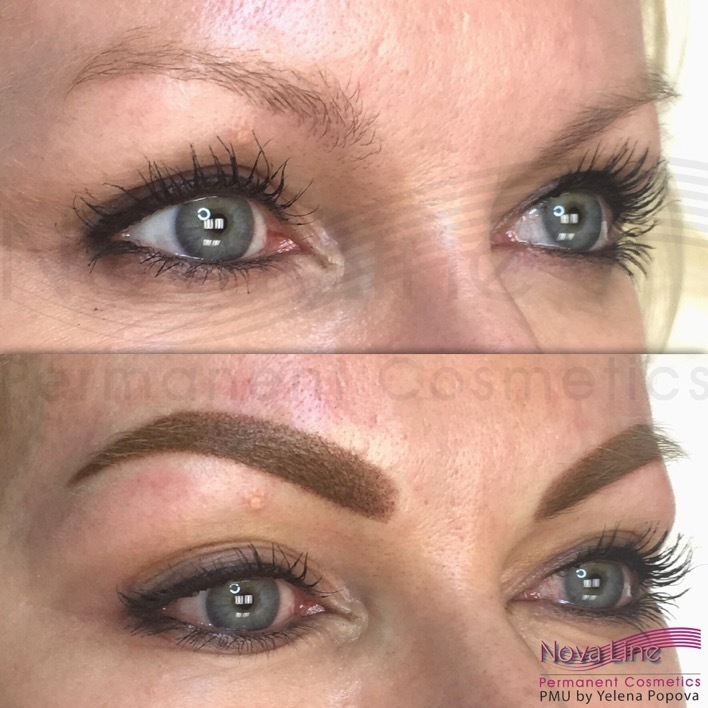 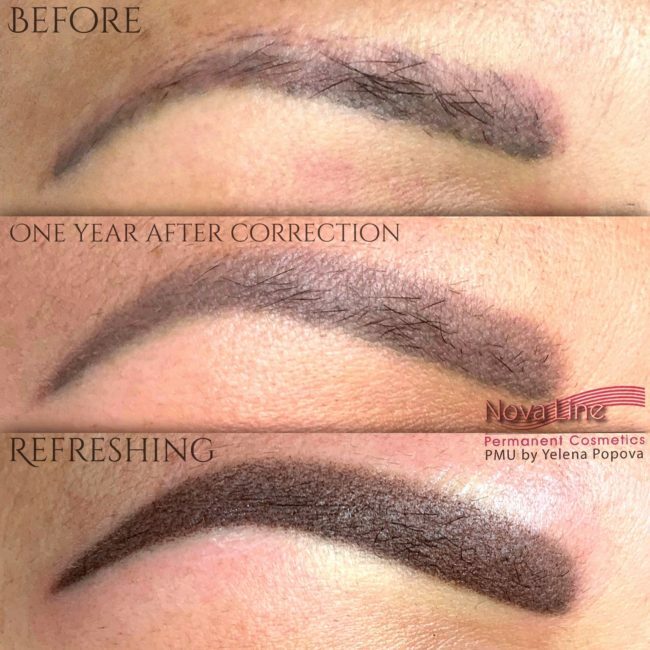 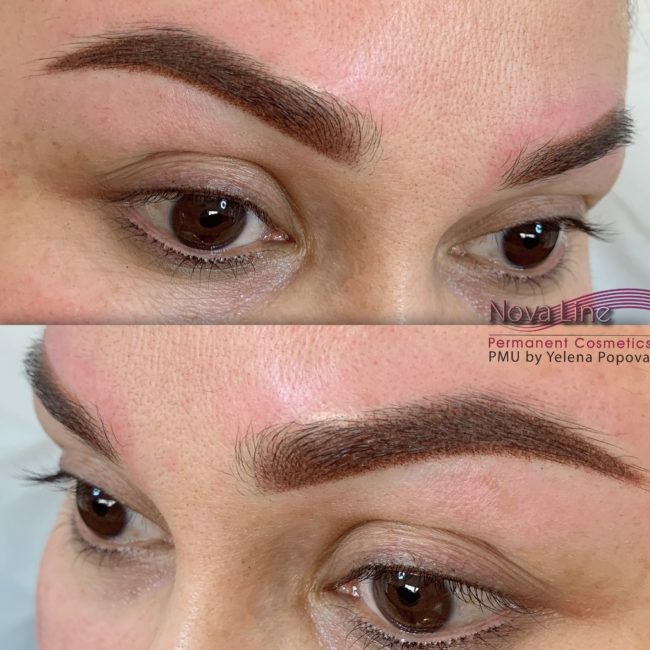 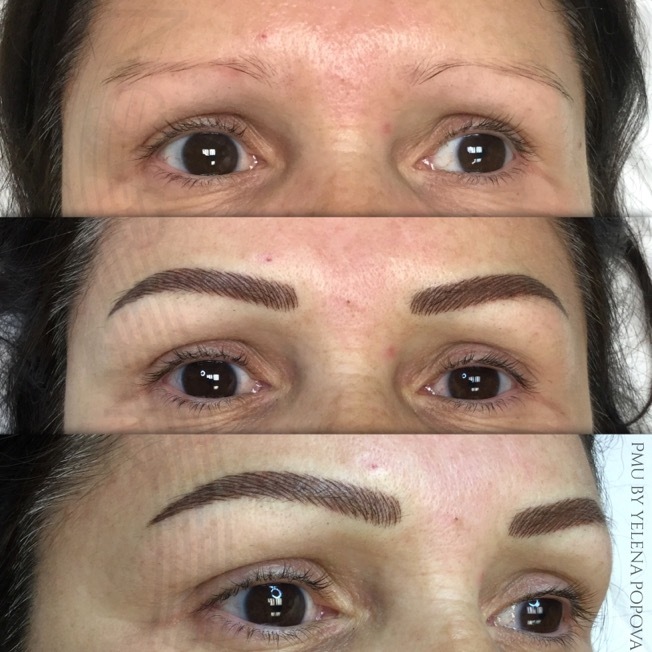 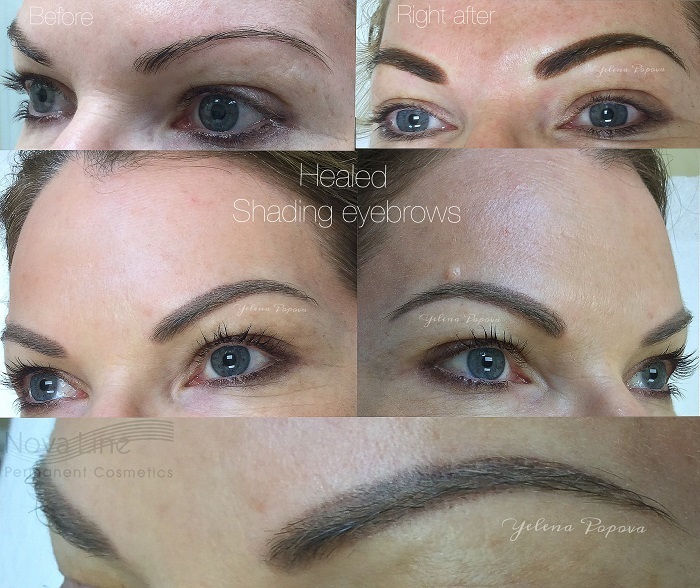 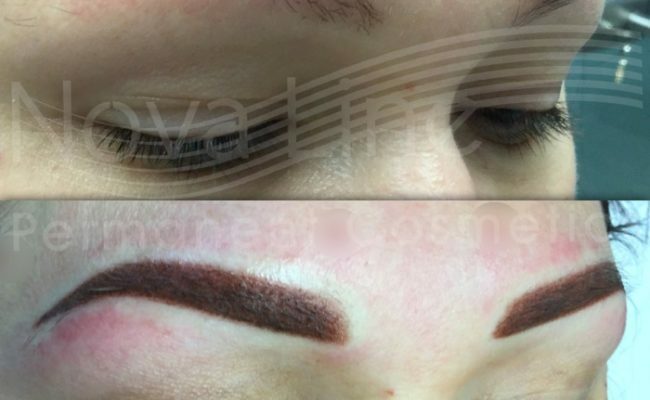 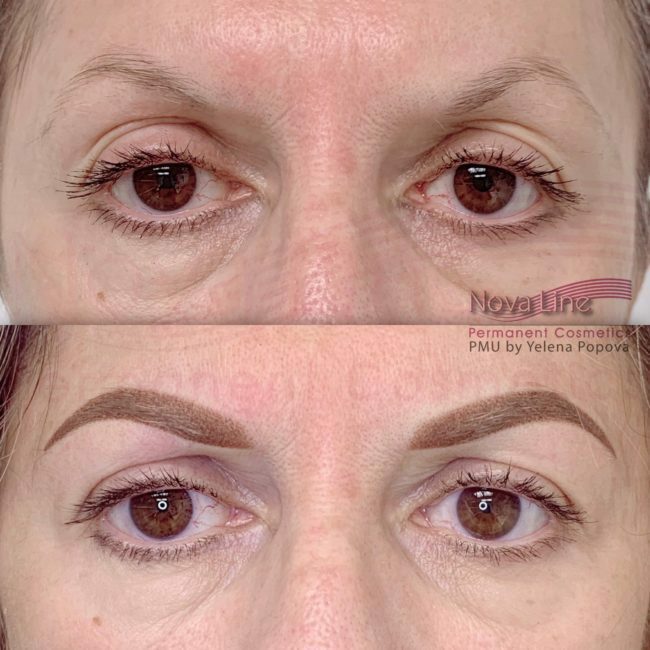 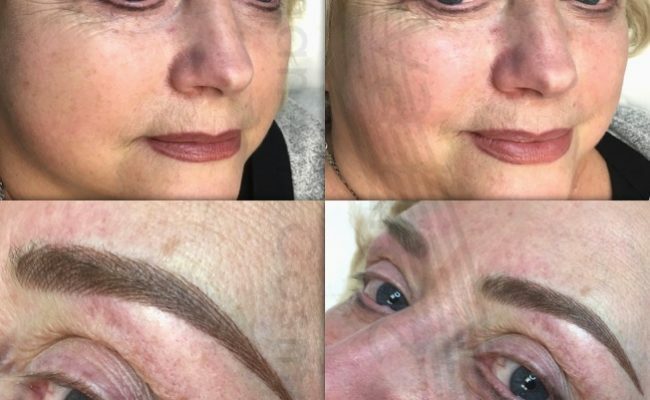 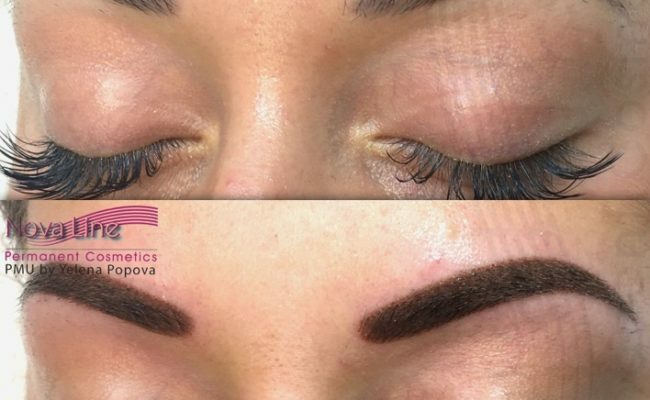 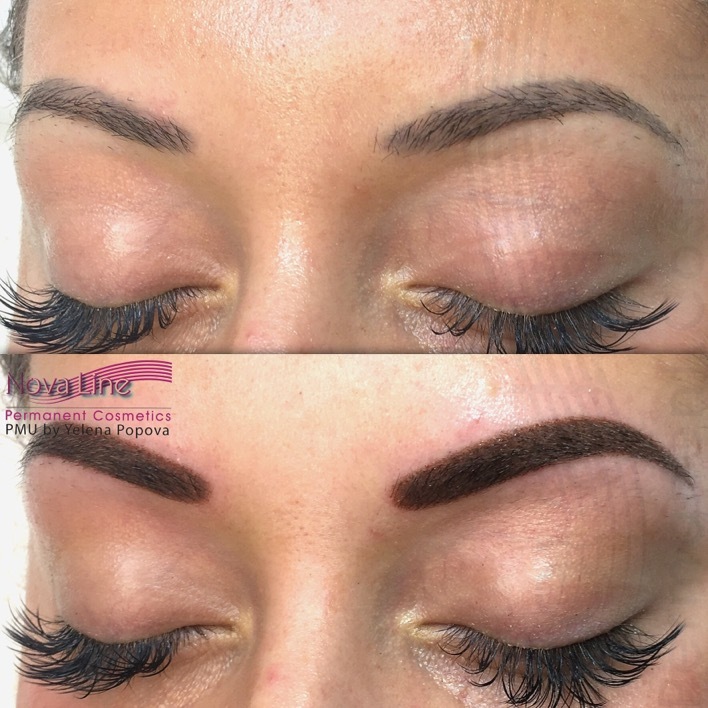 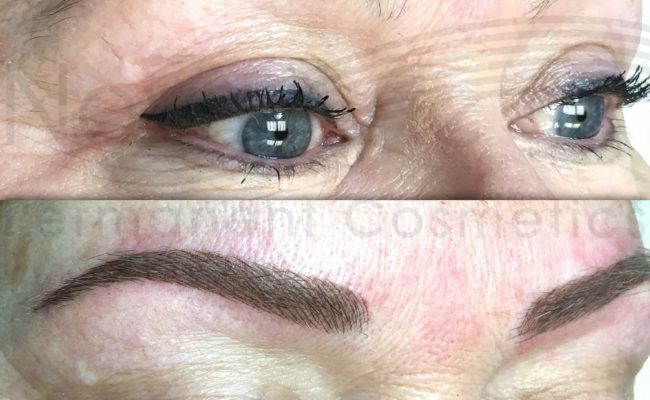 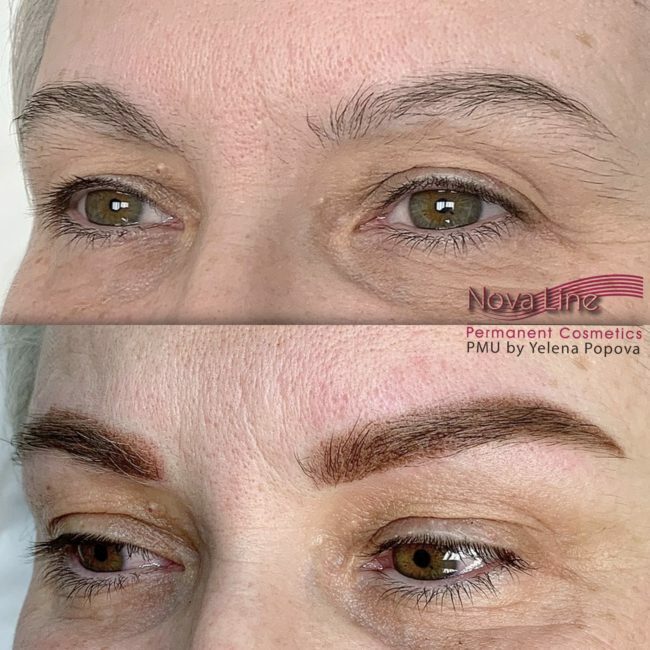 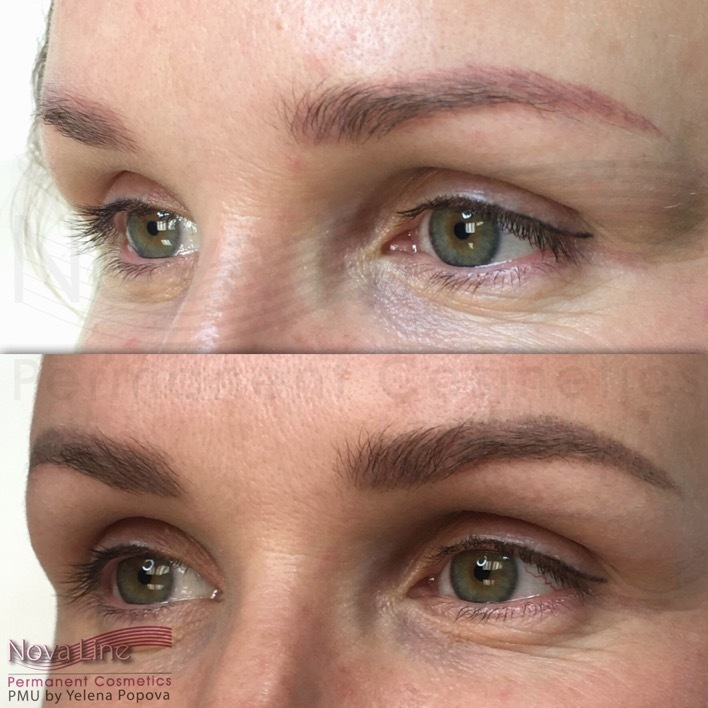 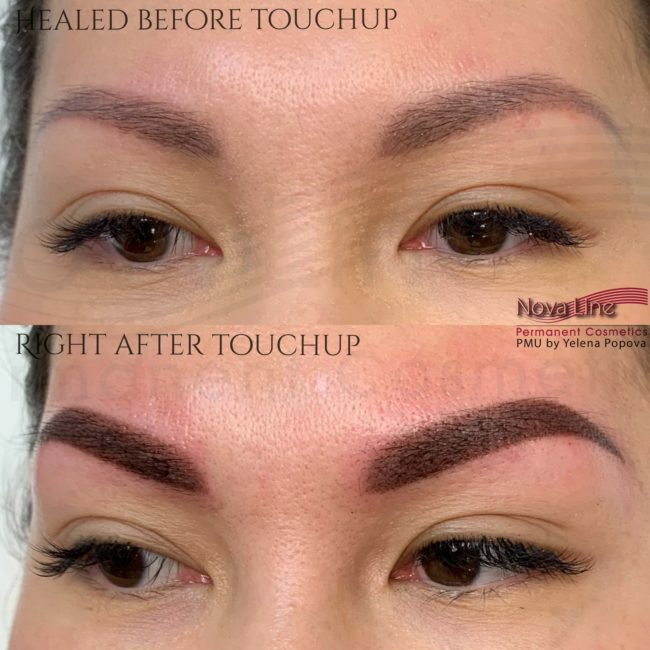 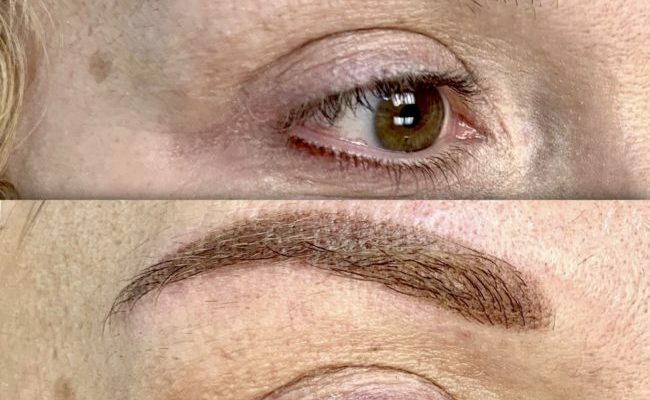 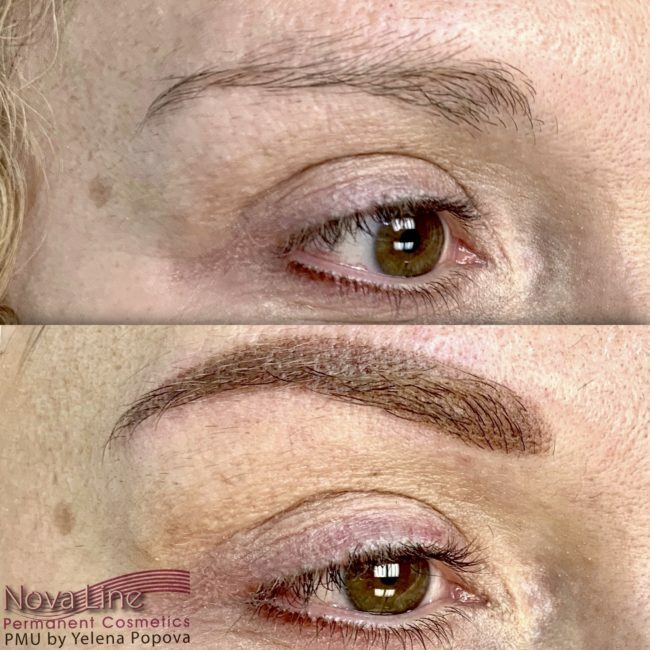 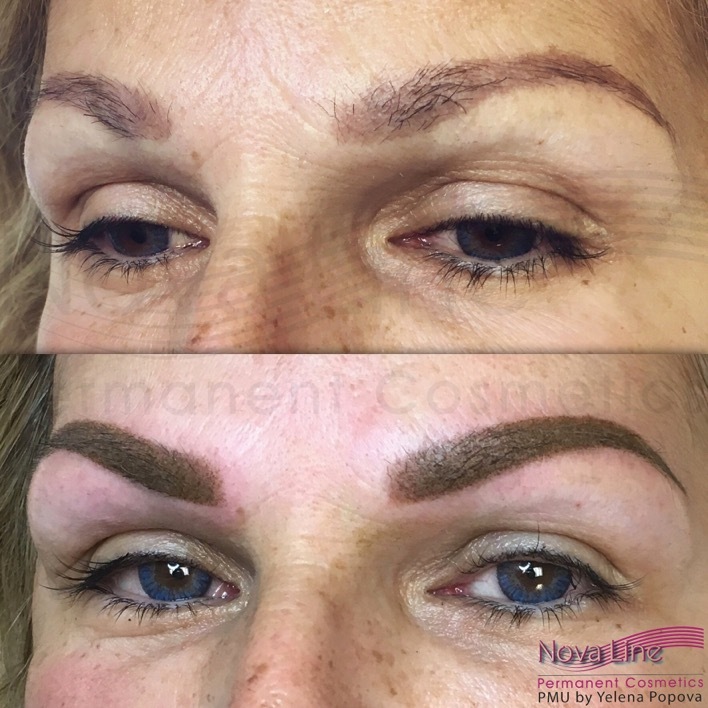 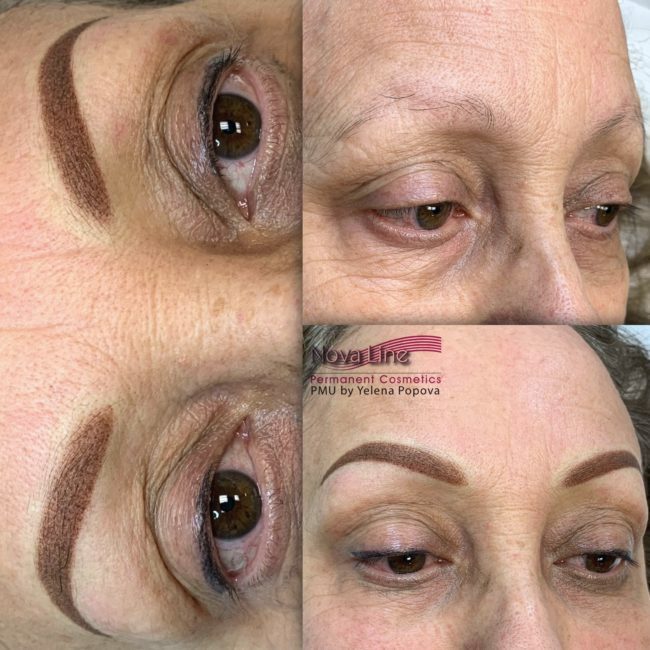 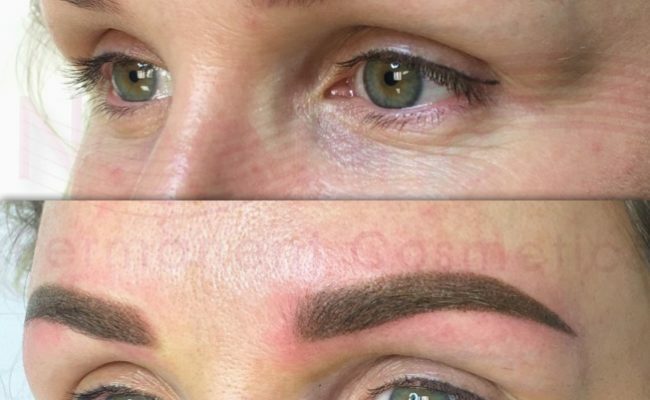 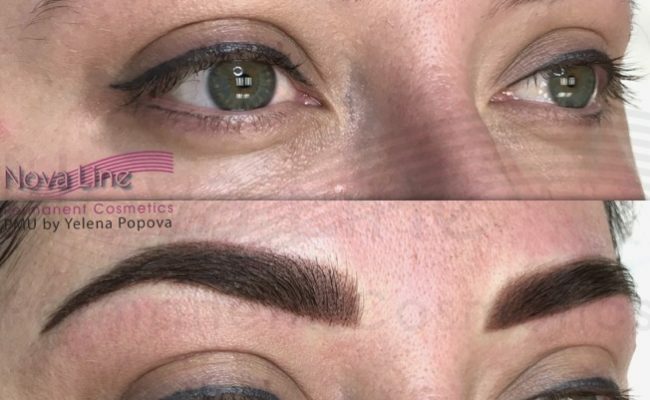 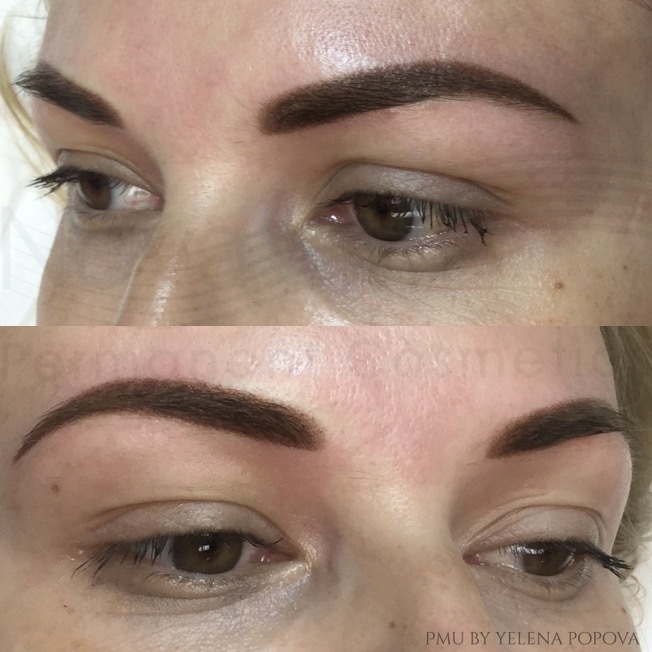 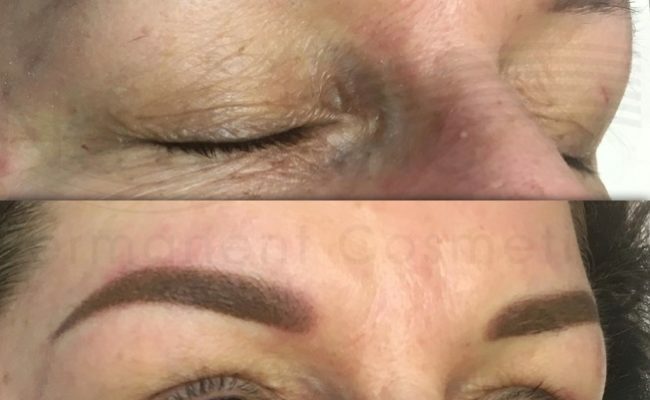 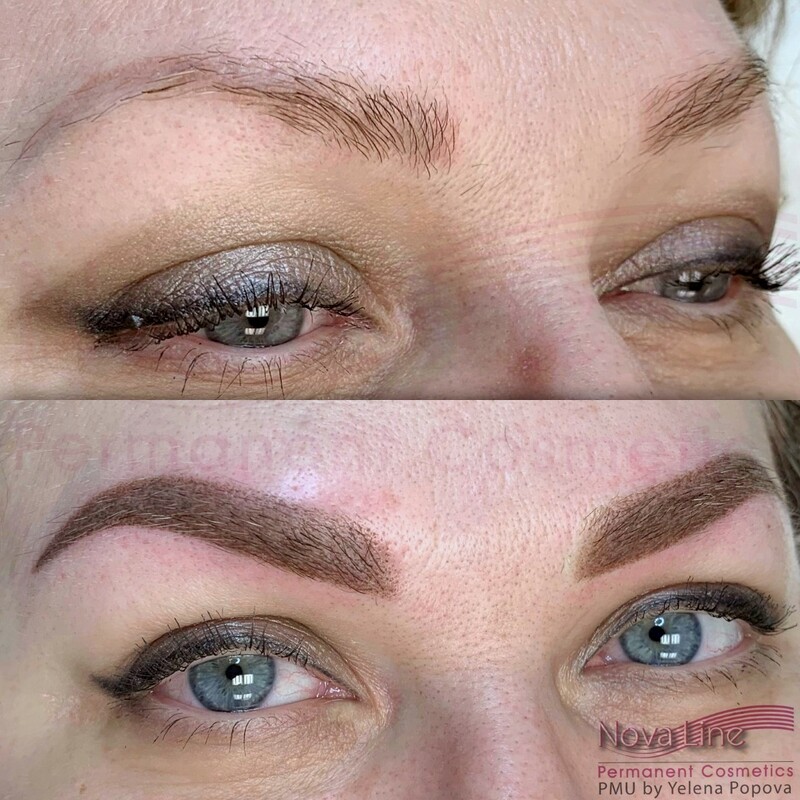 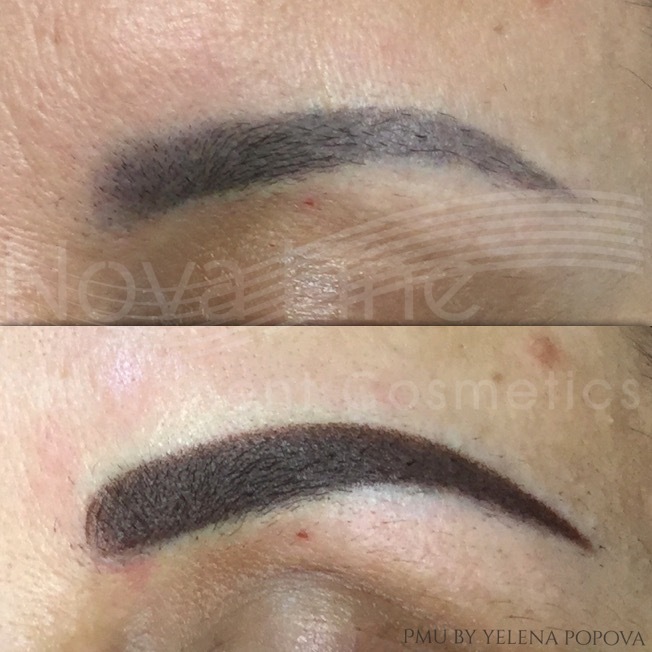 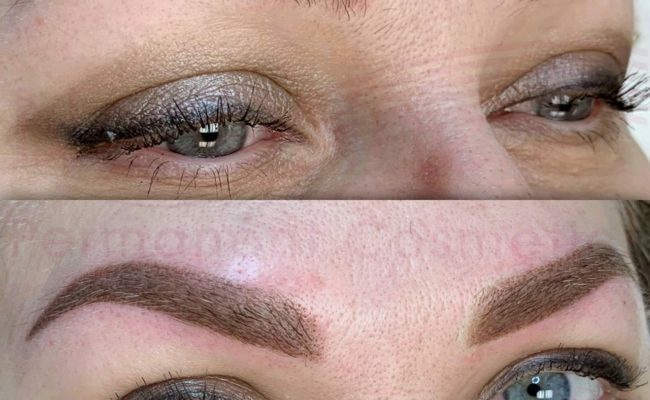 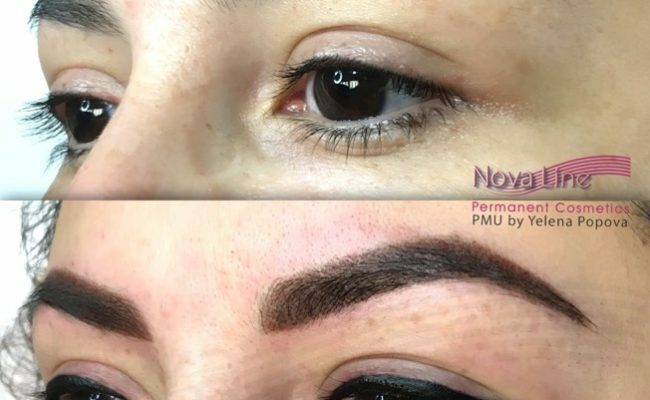 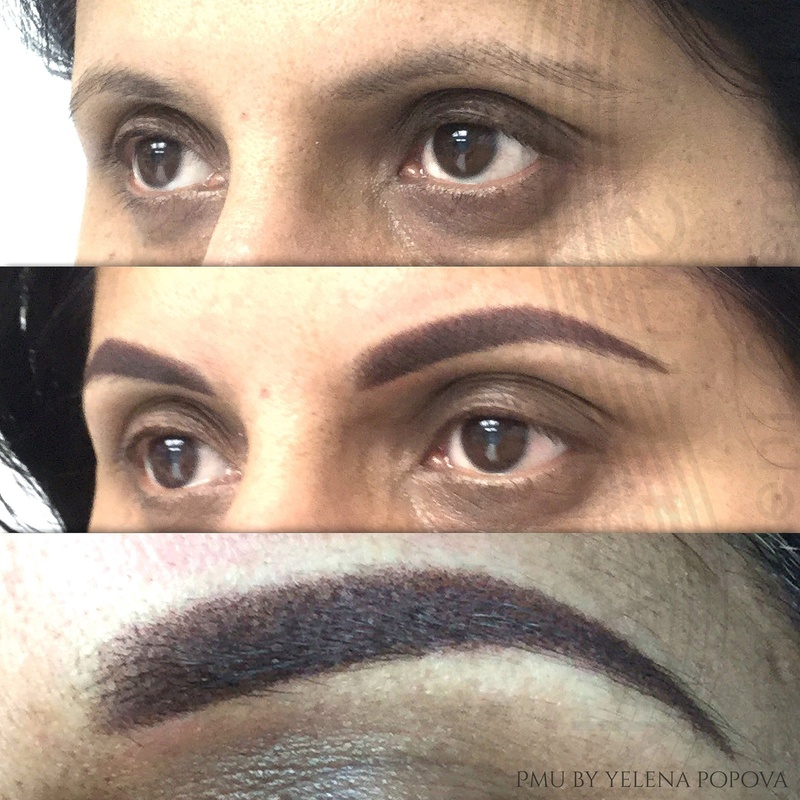 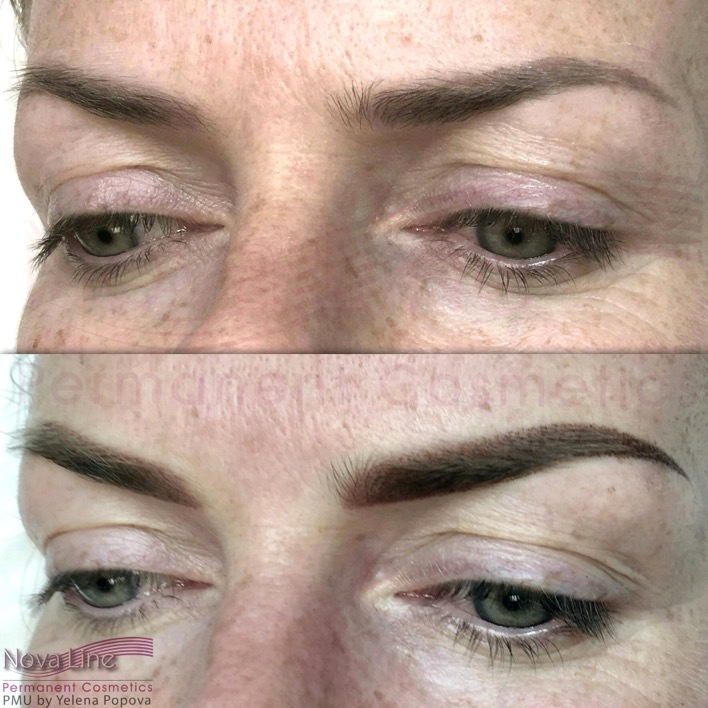 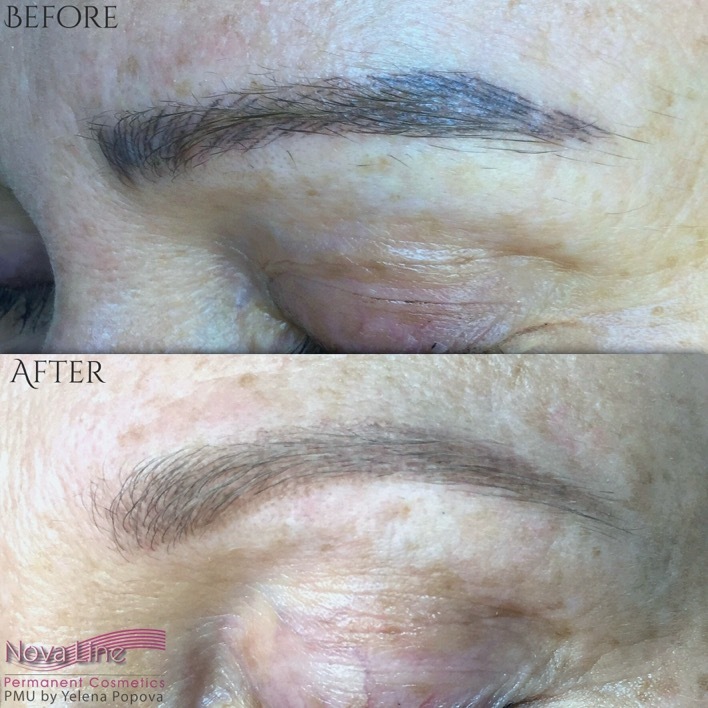 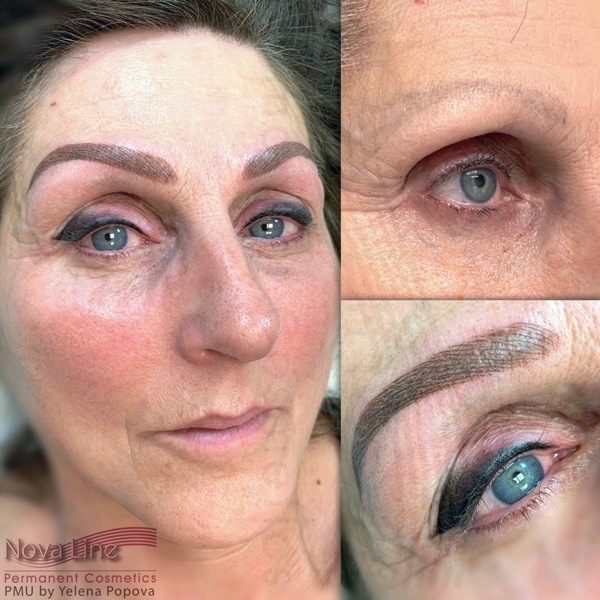 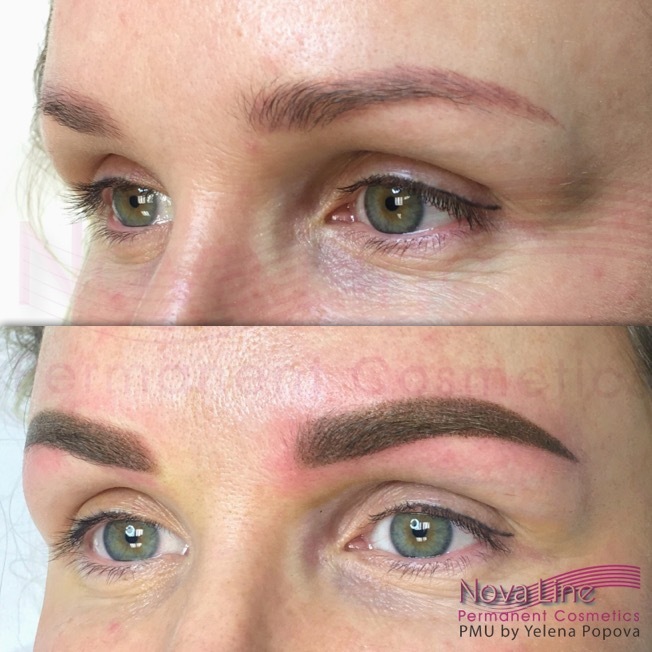 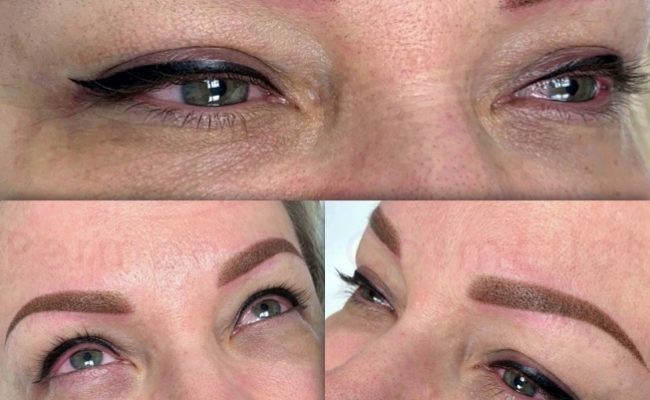 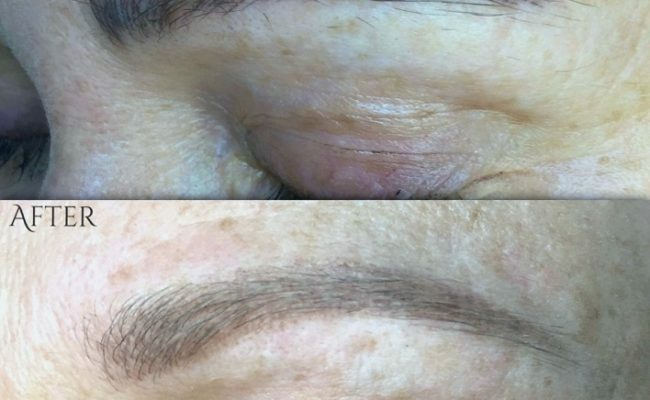 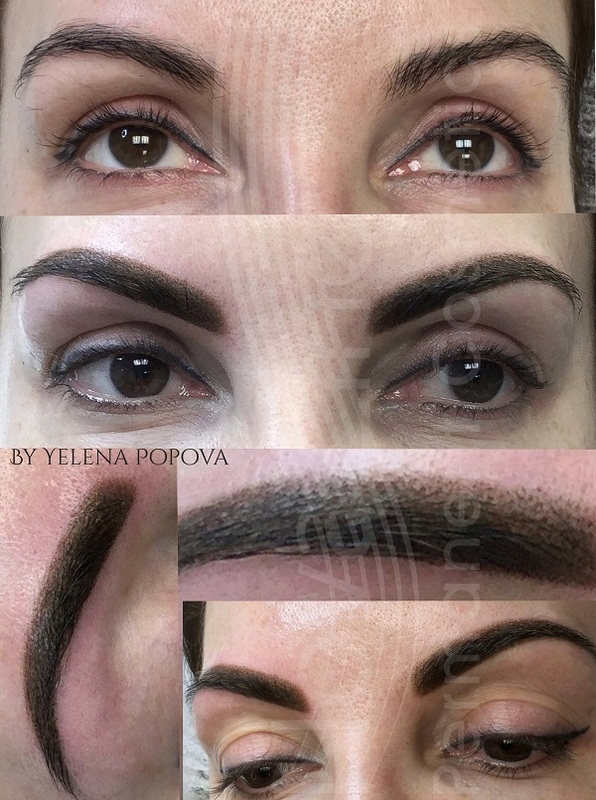 Through the years, the equipment and technical skills honed by professional artists have transformed this procedure into a true work of art, with delicate and meticulous strokes that can create the look of authentic eyebrows in a variety of colours and shades. 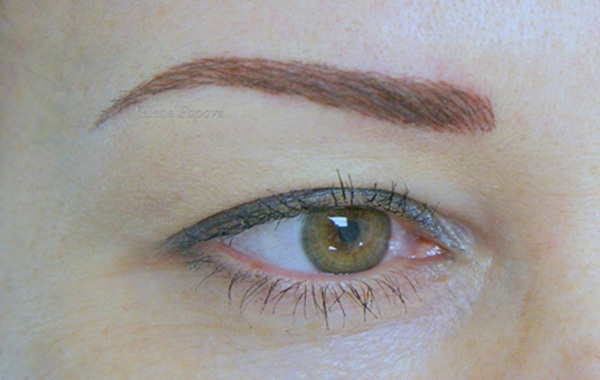 As a rule of thumb, it is generally recommended to choose a colour 1-2 shades lighter than your hair colour. 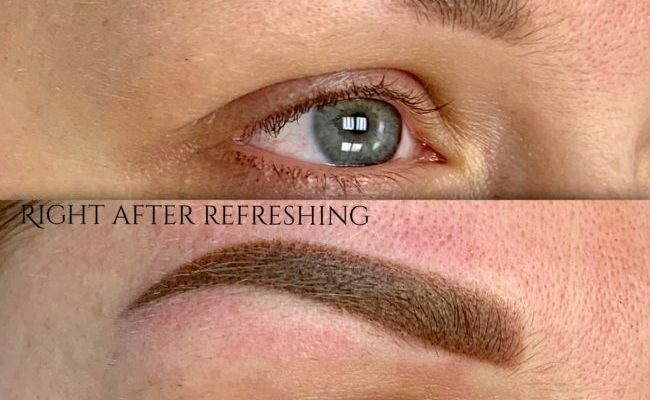 If you frequently change your hair colour, your artist can recommend the best blended colour. 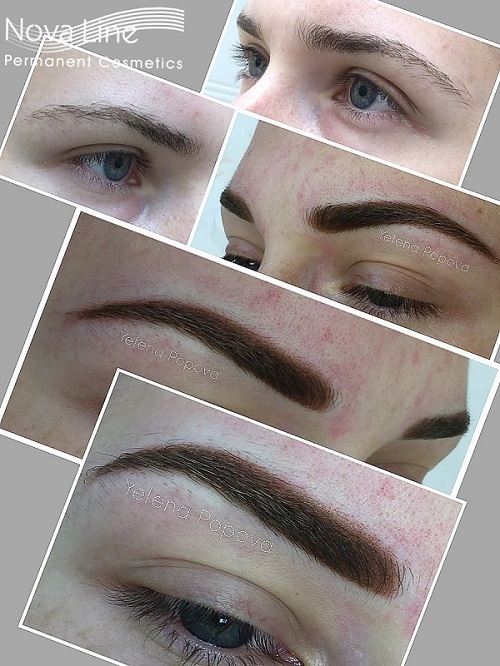 It may be advisable to just pencil your eyebrow colour over if your hair colour is likely to be temporary. 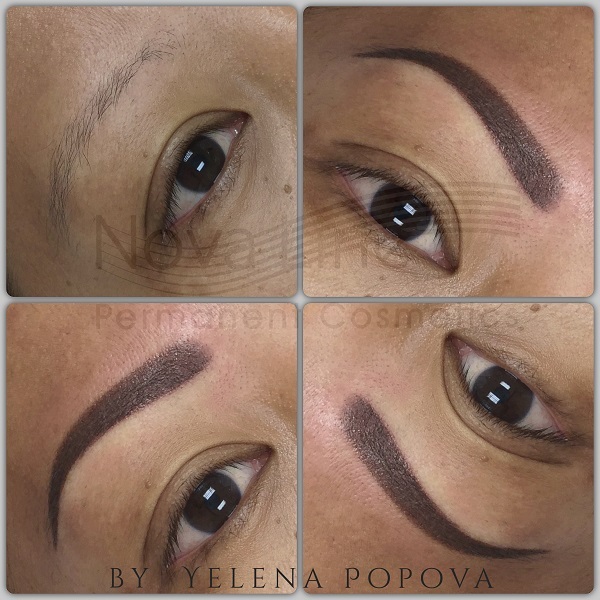 For those with very little eyebrows, an artist will generally utilize two shades to create a more natural hair look. 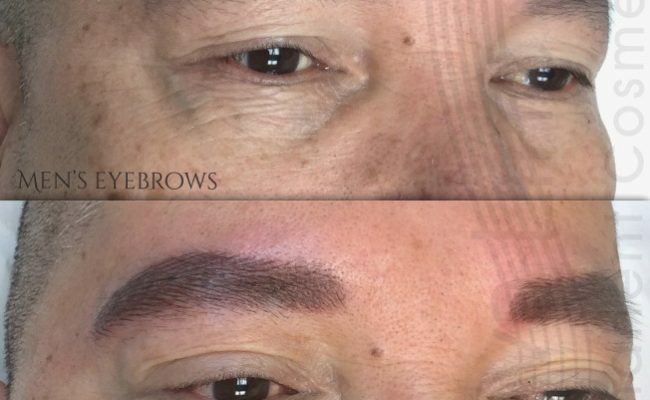 Eyebrows can drastically change the appearance of one's face, and play a part in how we express emotion. 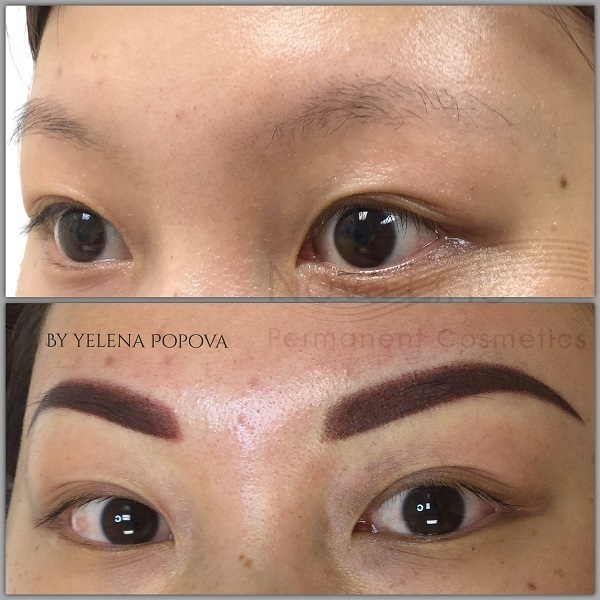 Therefore, it is crucial that the shape of your eyebrows suit your face and are scrupulously crafted. 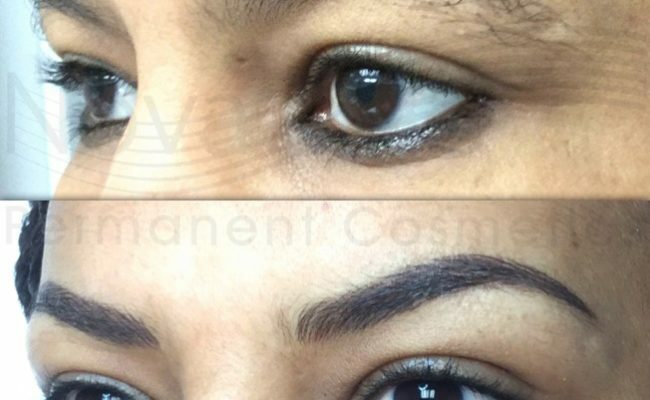 Generally, it is recommended for the eyebrow to begin above the inner corner of the eye, but this can be difficult if your face is not perfectly symmetrical (as most are not). 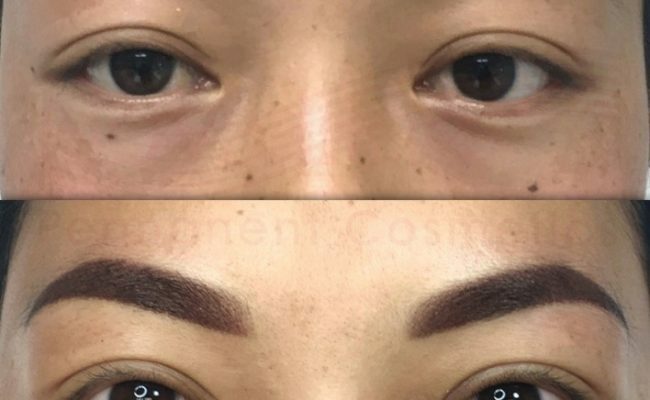 If this is the case, you can create symmetrical brows by placing a dot above the centre of the nose bridge and measuring from each side to ensure they are even. 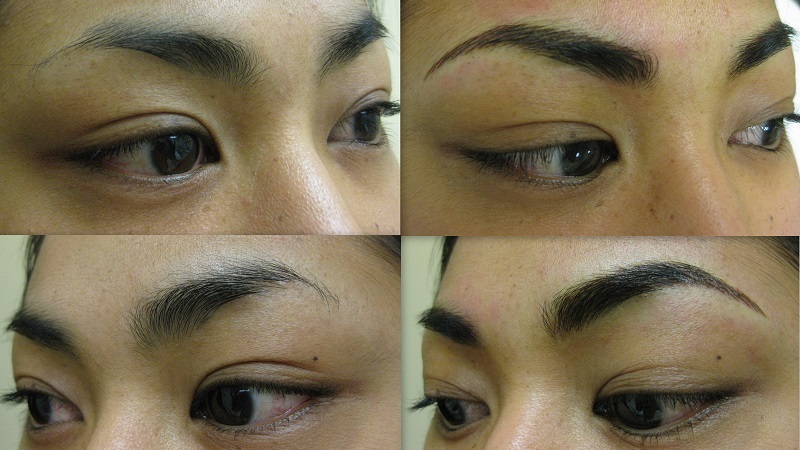 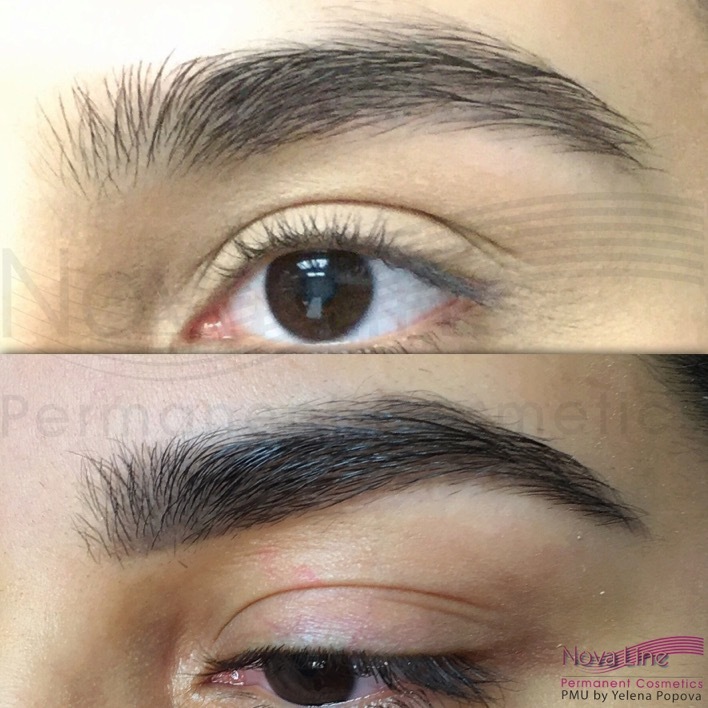 Eyebrows should be a bit thicker at the beginning and taper in slightly towards the arch, tapering more to the end. 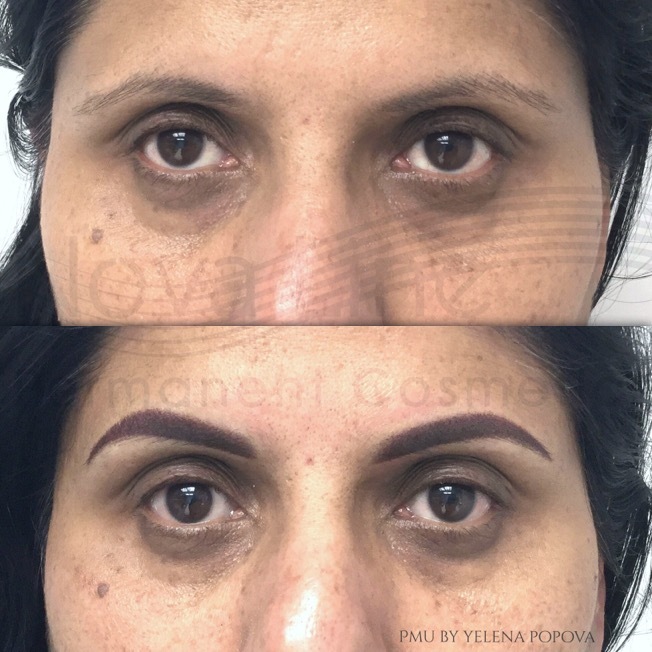 If someone raises their brow often, they should be drawn evenly in the relaxed position to ensure they are correctly placed. 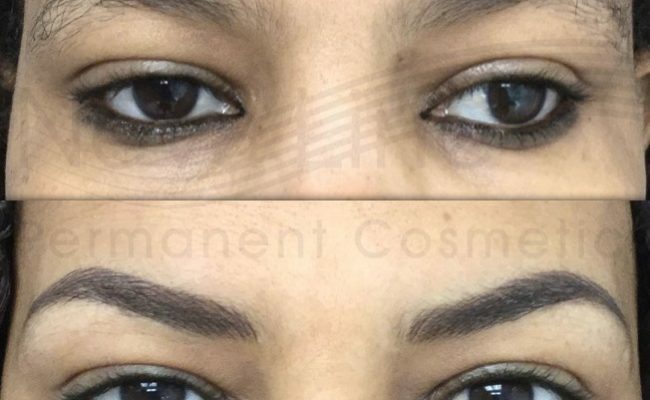 If a person keeps the same brow raised almost all of the time, that side can be drawn a bit lower and flatter. 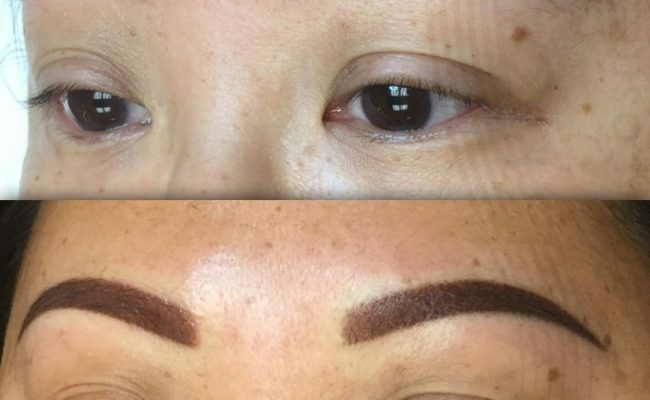 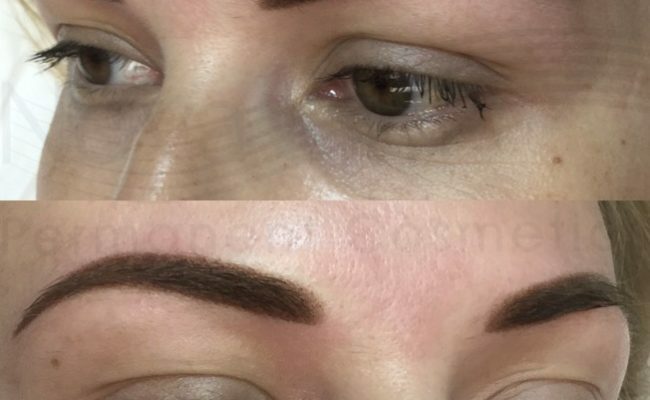 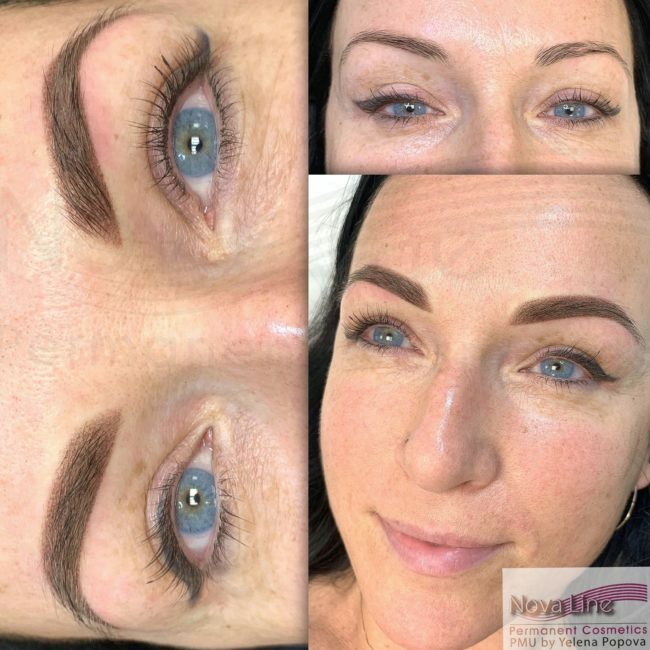 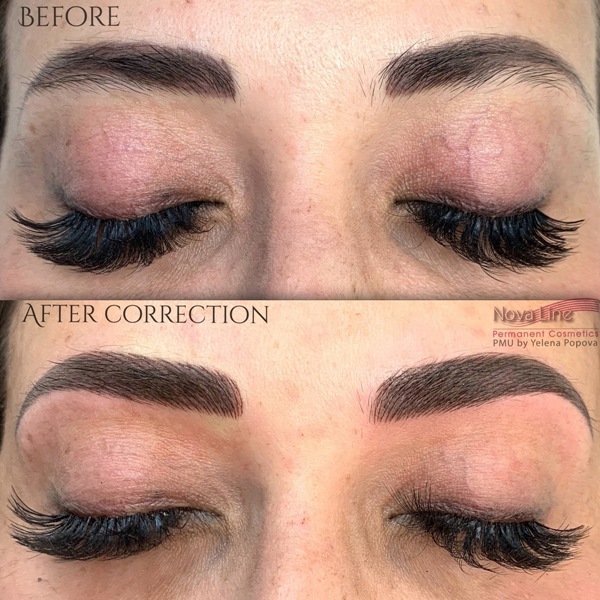 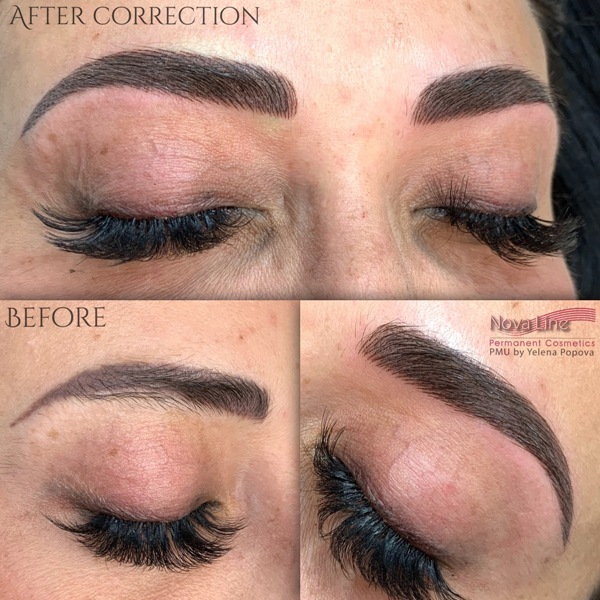 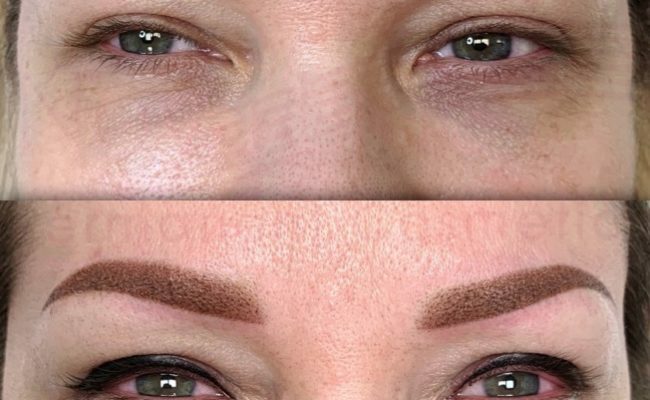 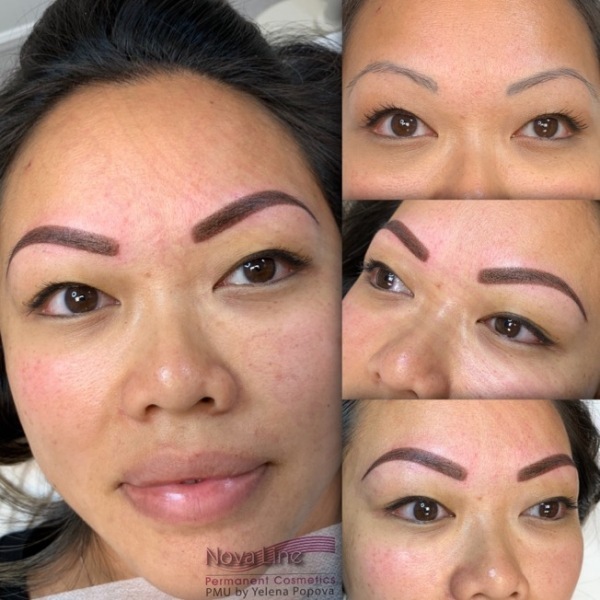 If you decide to draw your eyebrows yourself before your permanent makeup appointment, do so many hours before so you can check them prior to going in to make sure they are perfect. 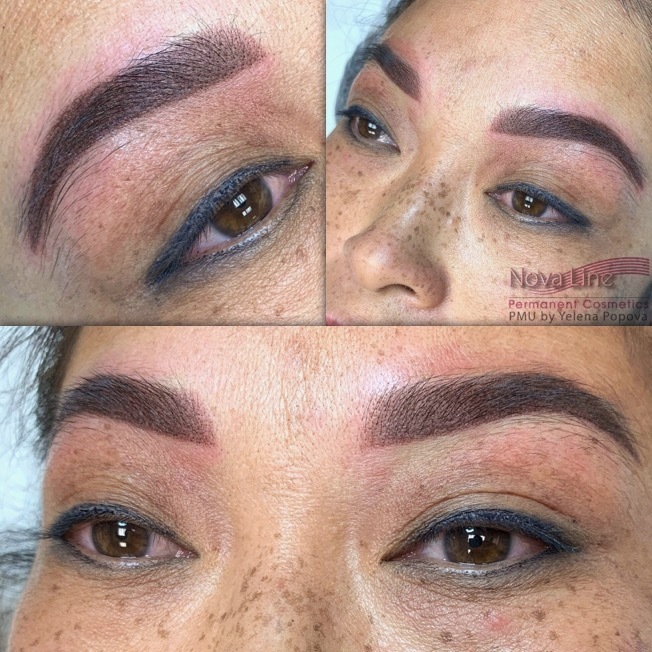 If you would prefer your artist draw them for you, generally they will instruct you to relax your forehead while looking at the floor, keeping your head straight. 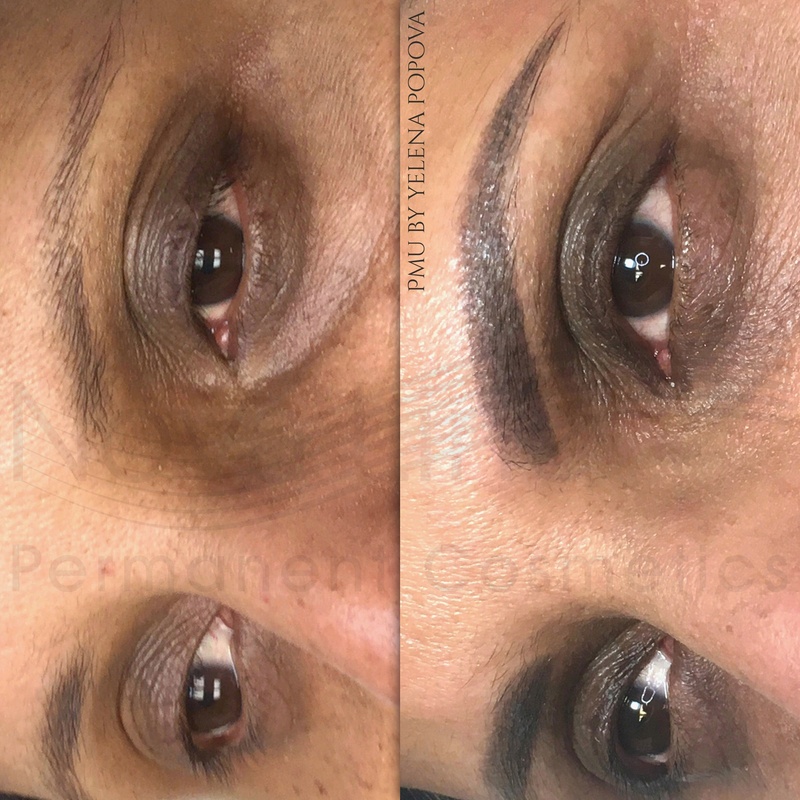 It's imperative that the muscles are completely relaxed, otherwise, your brows may look uneven when you make certain expressions. 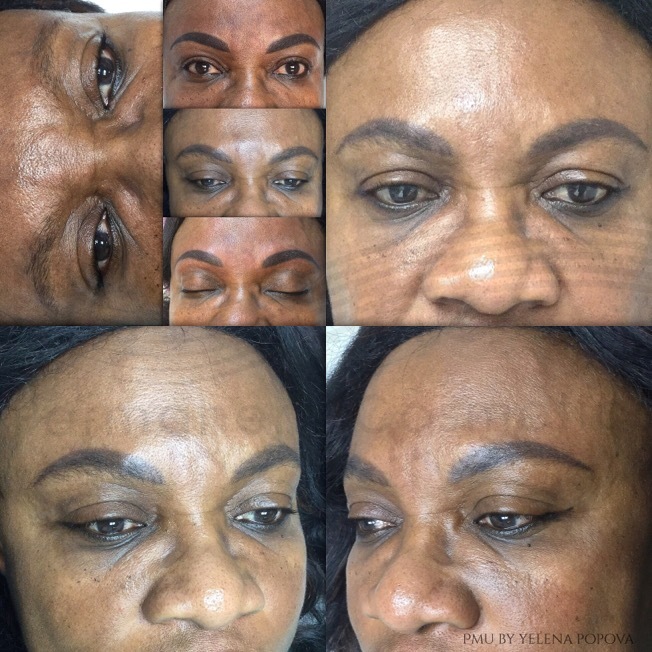 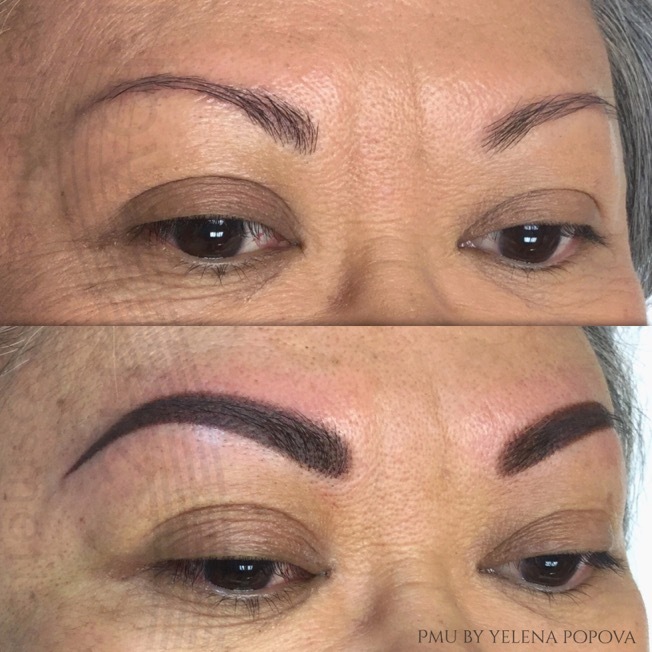 Skilled artists can use an array of techniques to create their client's desired look. 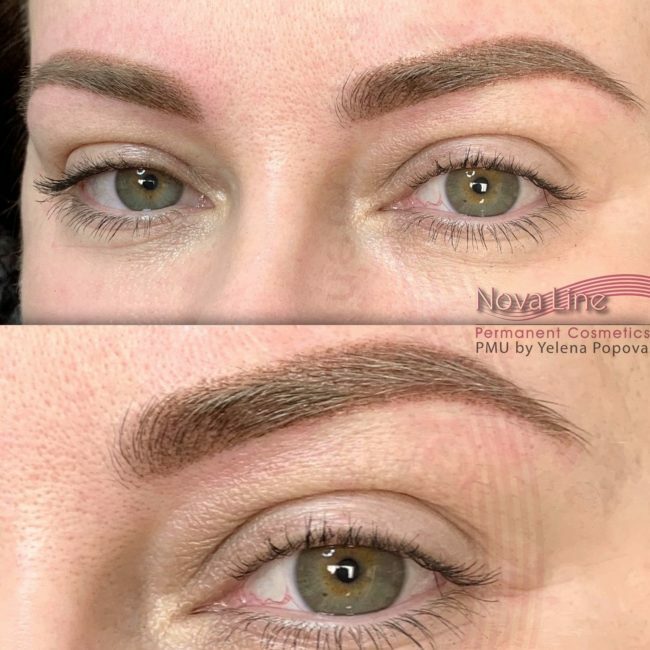 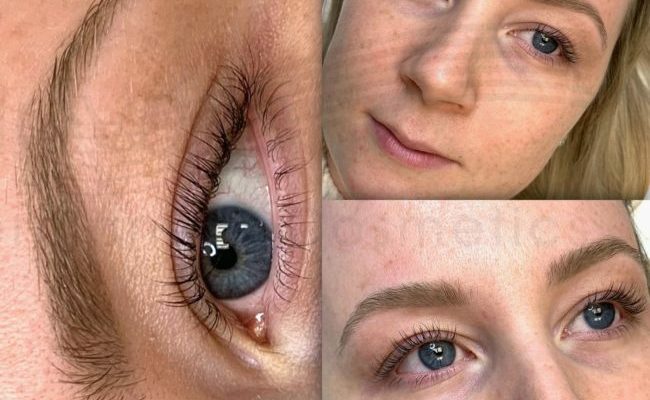 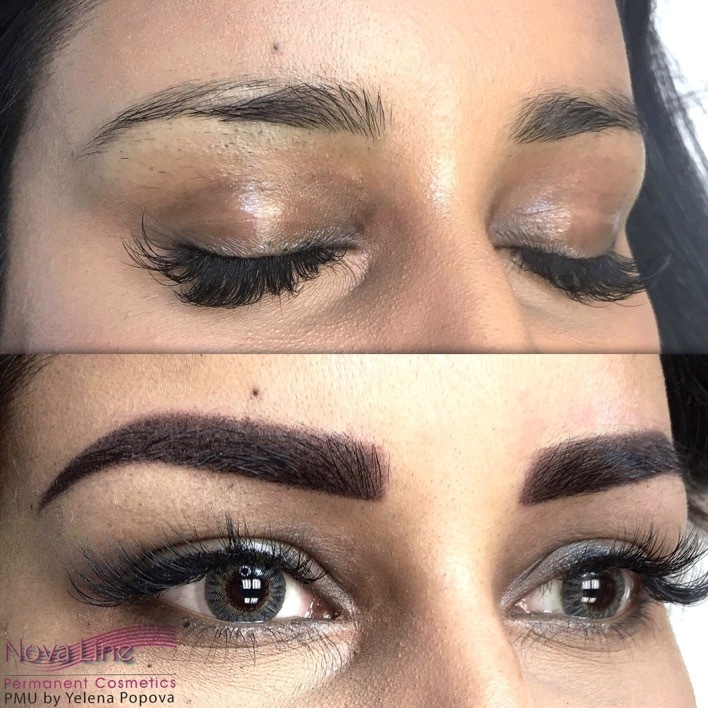 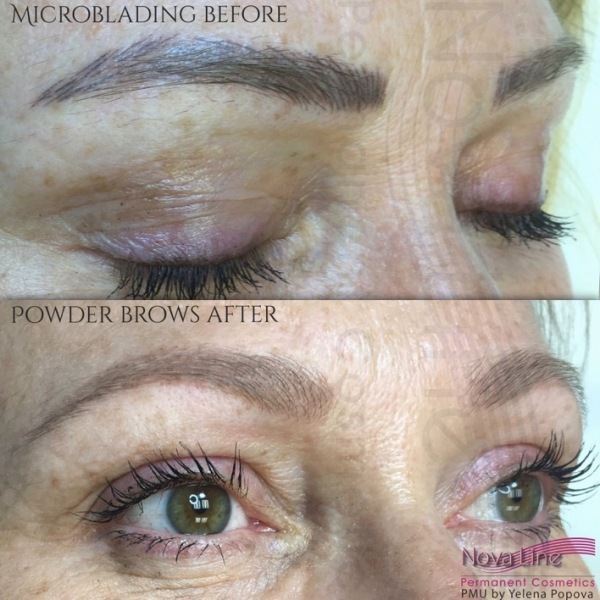 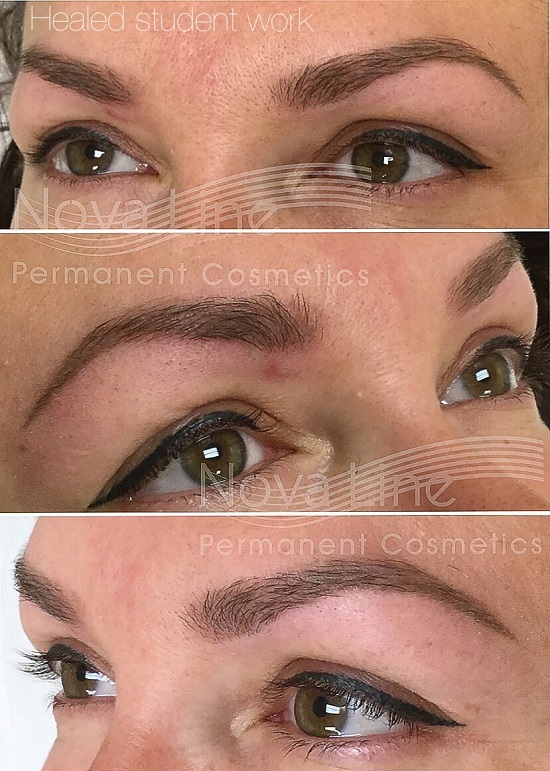 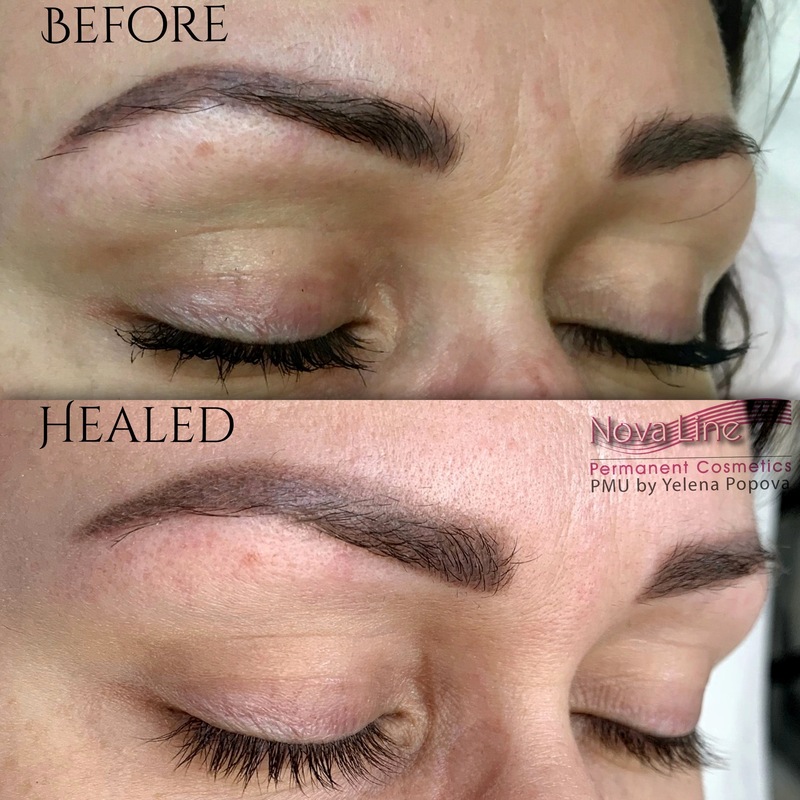 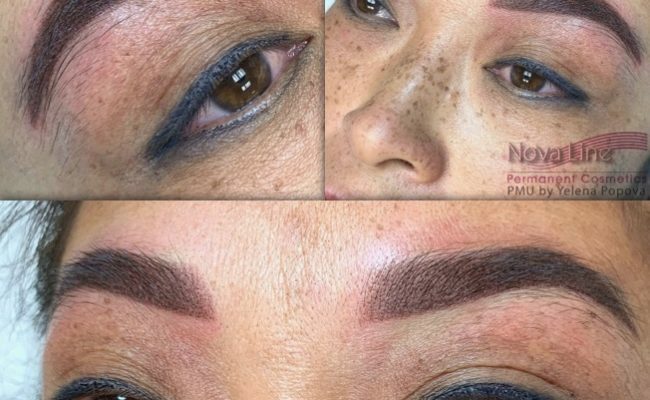 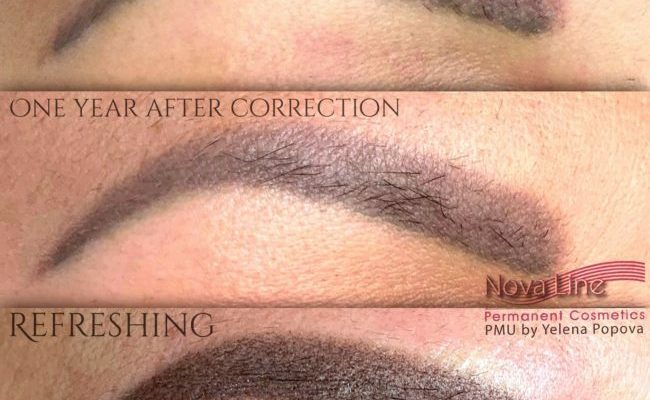 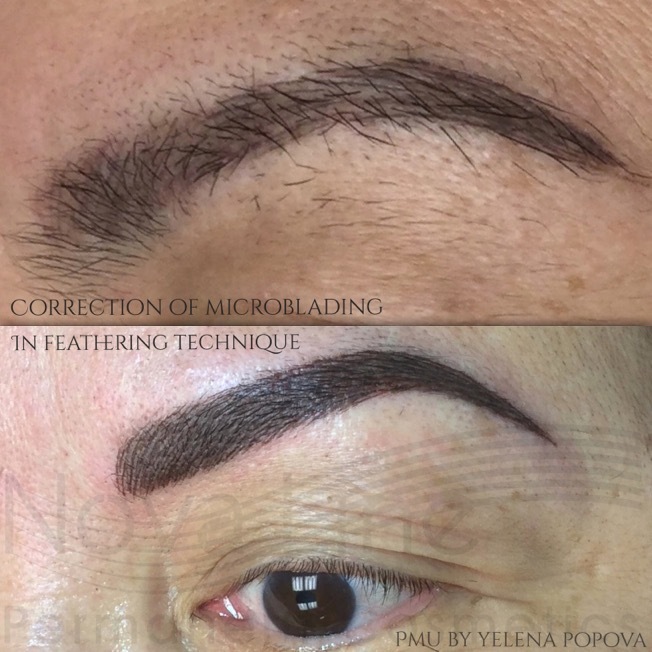 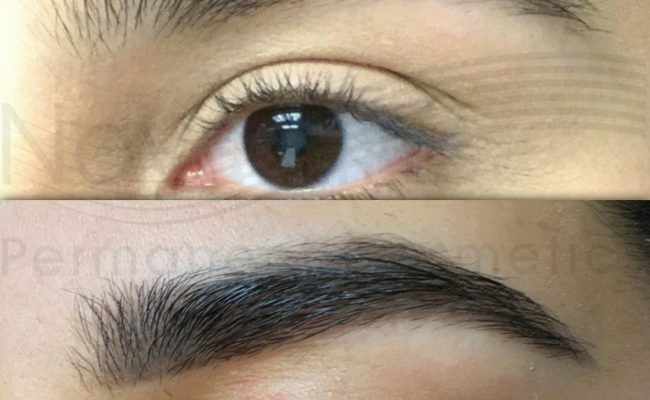 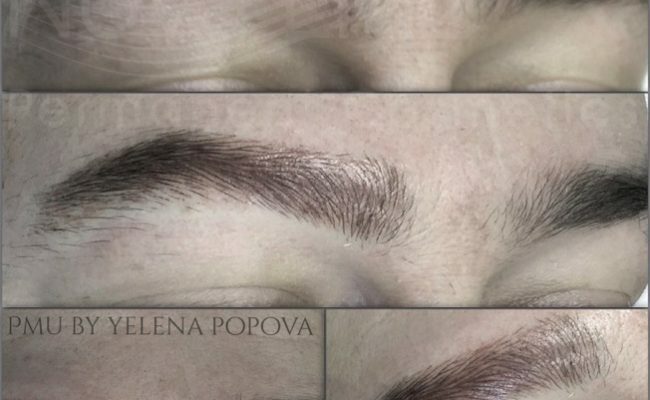 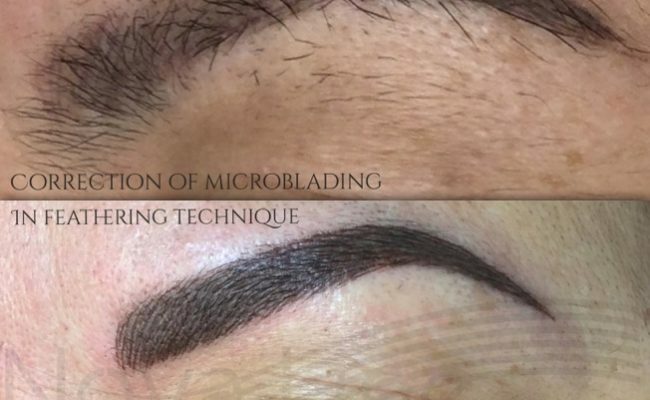 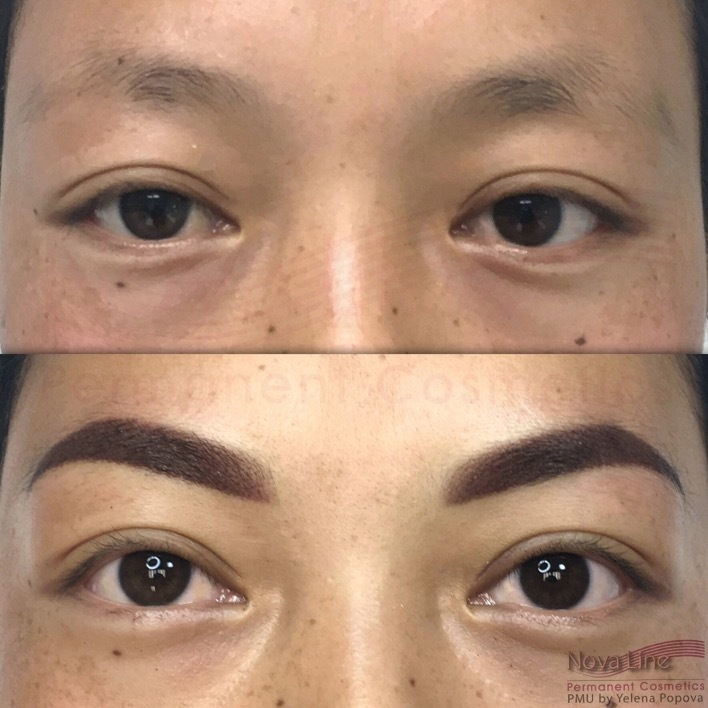 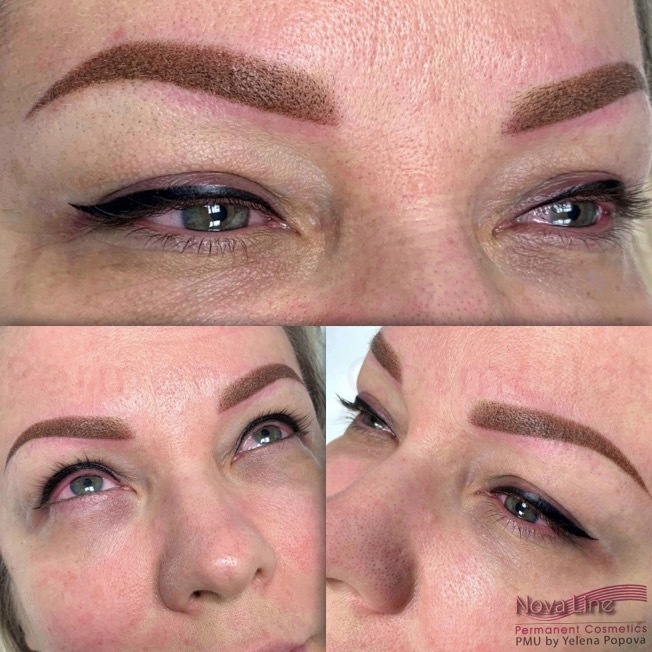 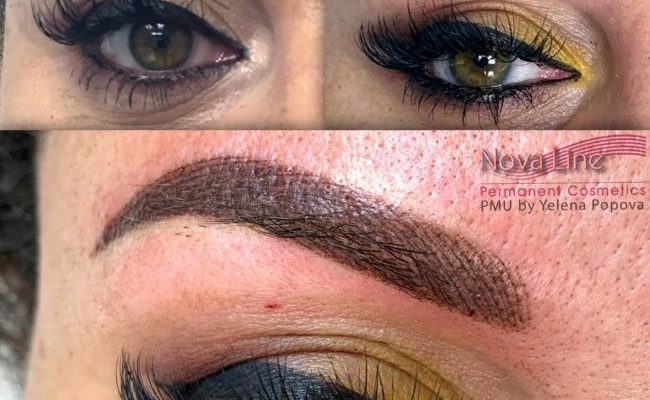 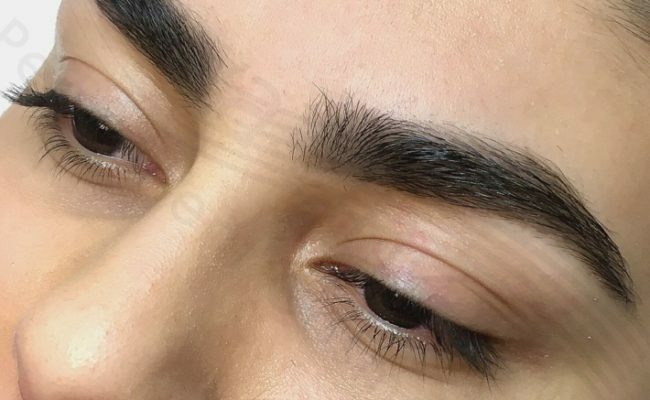 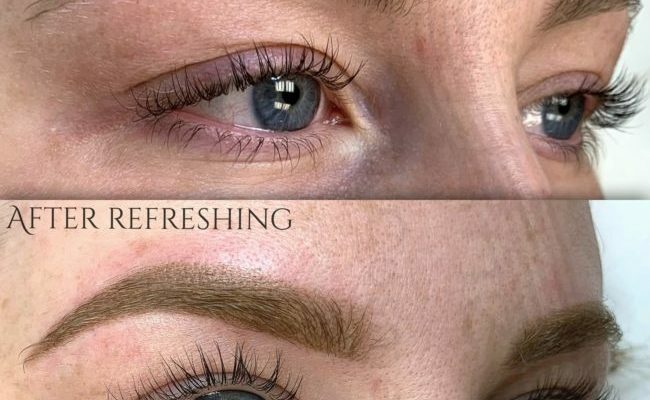 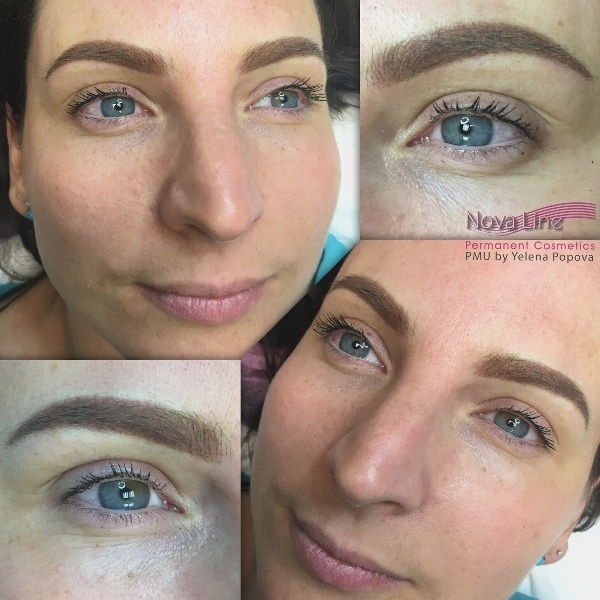 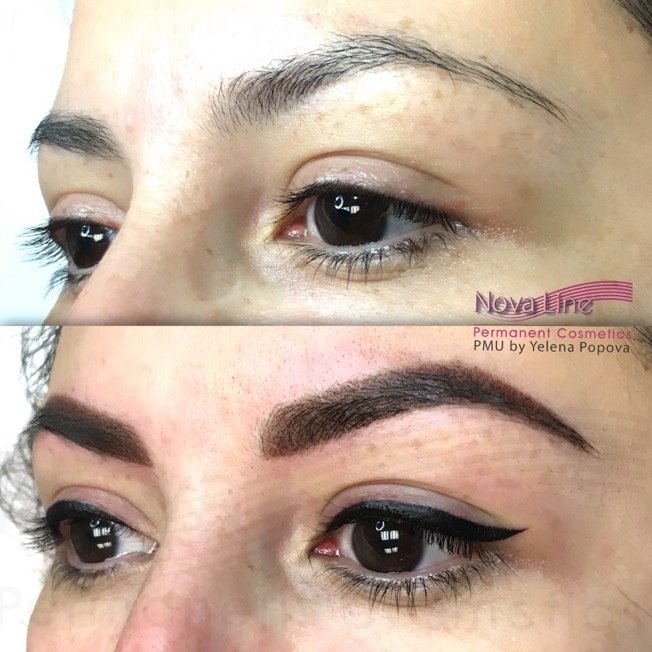 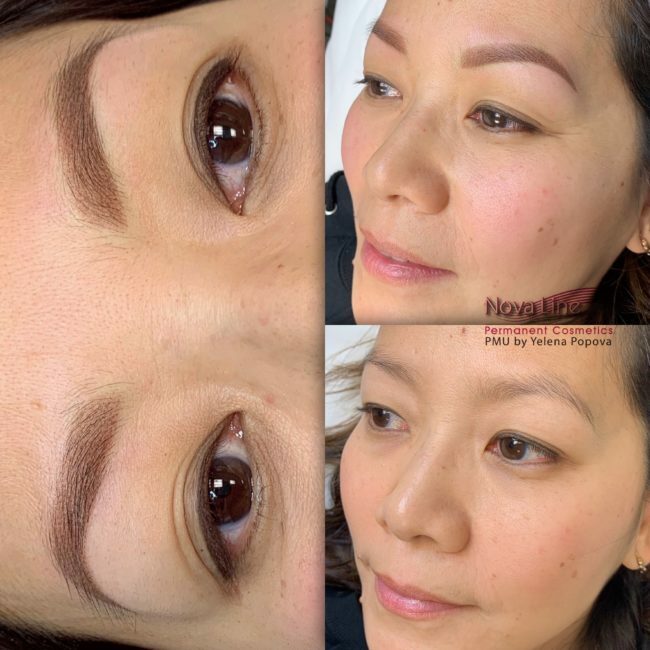 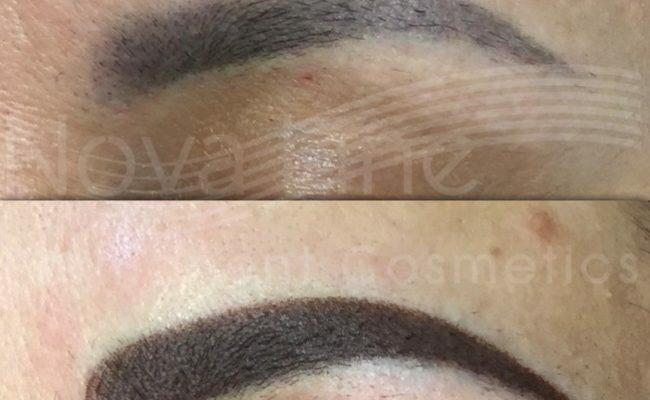 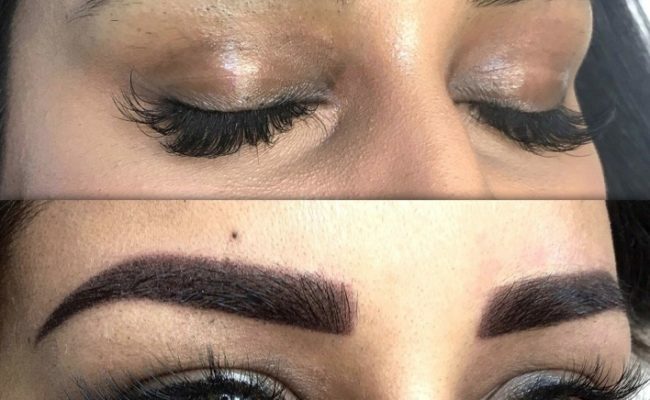 Feathering eyebrows or Nano brows: two names for one technique done with a nano aka macro needle to create the realistic look of hair. 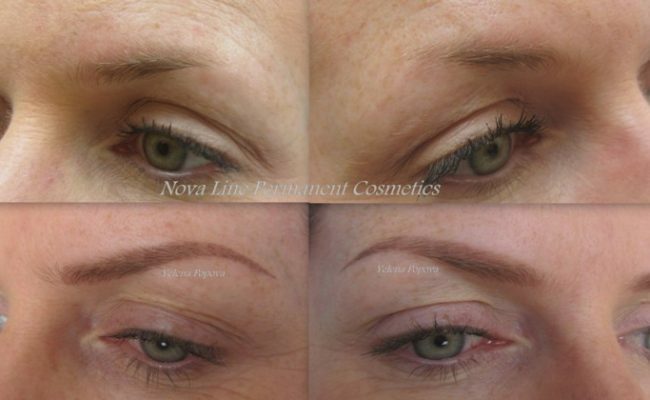 This process creates dimension, allowing for a natural look that truly simulates impeccably sculpted eyebrows. 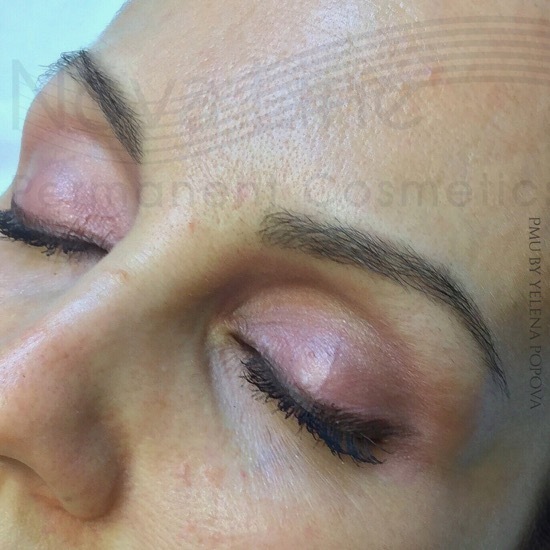 Powder or Ombré eyebrows are done using a soft shading technique with a nano or macro needle to create a soft veil of colour on the skin. 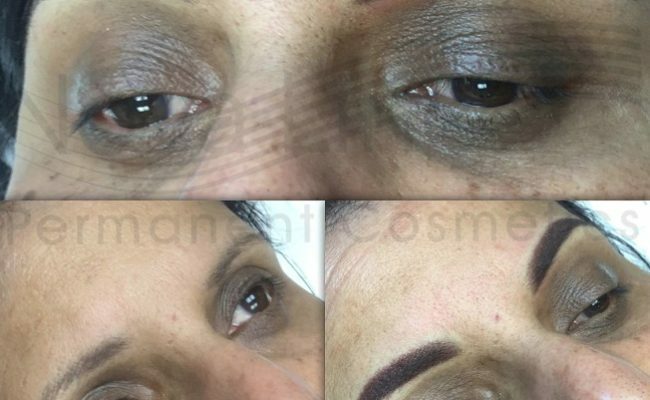 This procedure imitates the powdered makeup look. 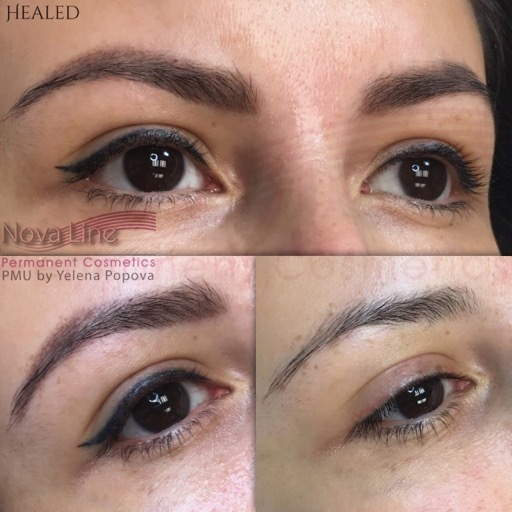 When healed, it looks absolutely beautiful and suits any lady's face. 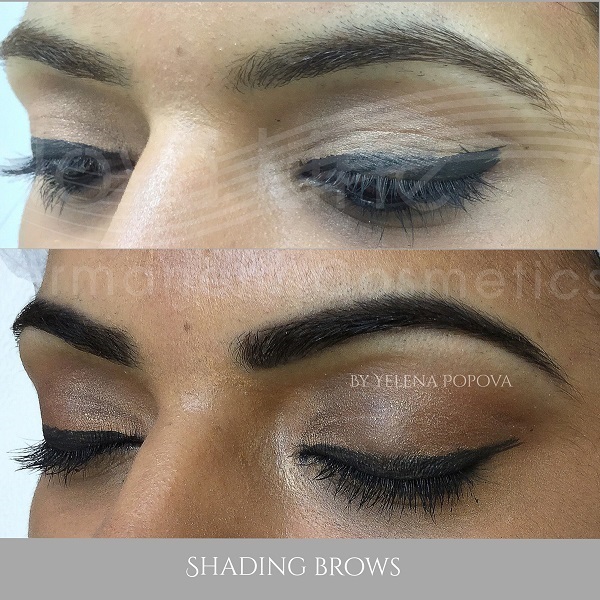 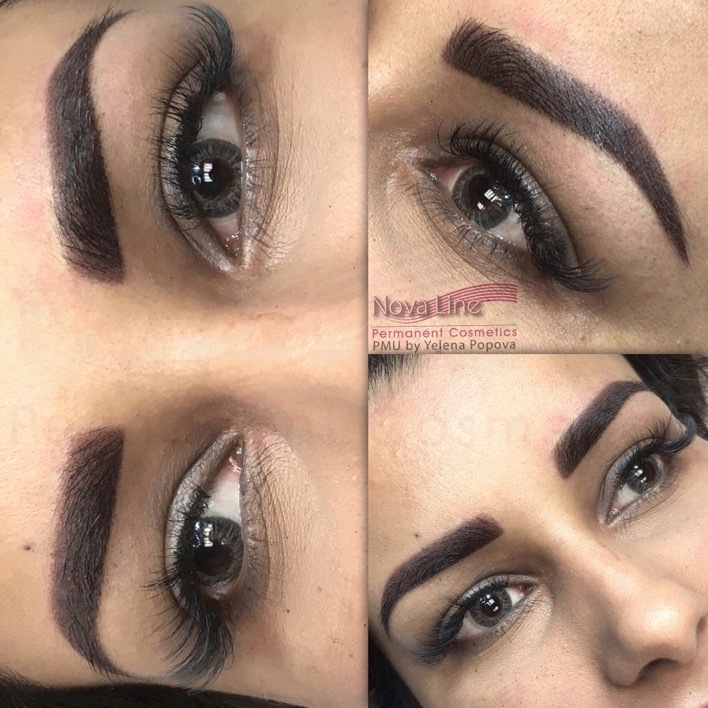 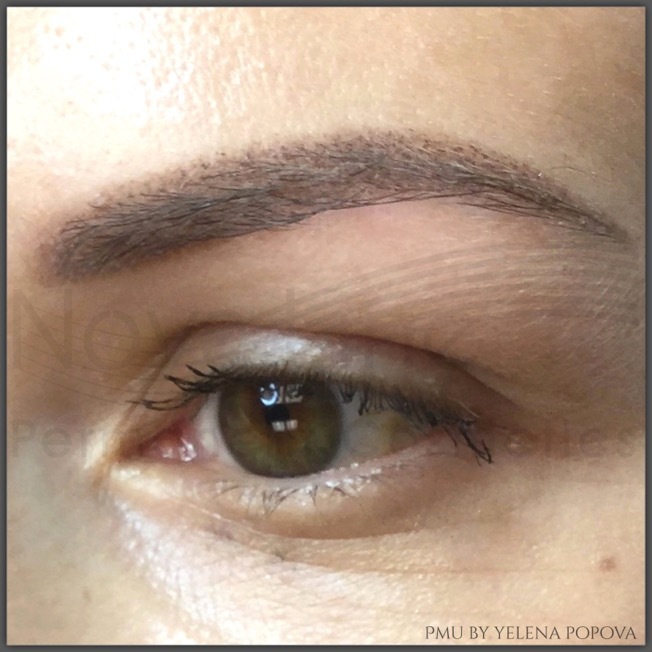 3D eyebrow designs are a combination of 2-3 colours, utilizing powder and hair strokes to give a very full, realistic look. 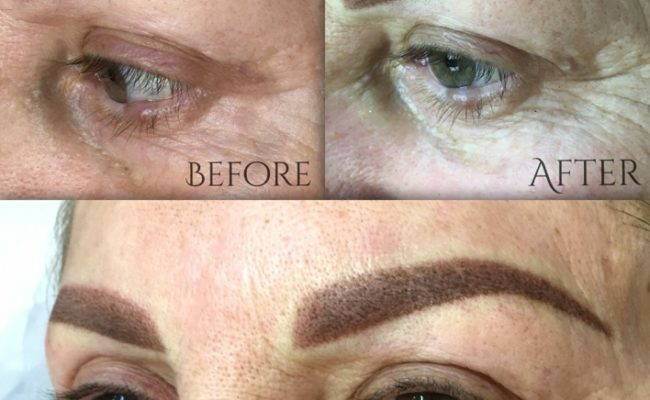 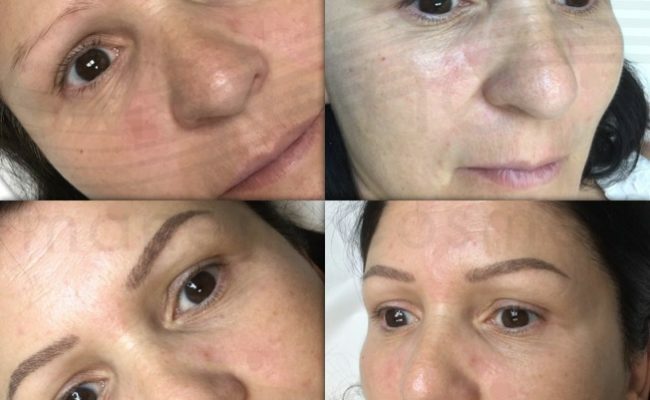 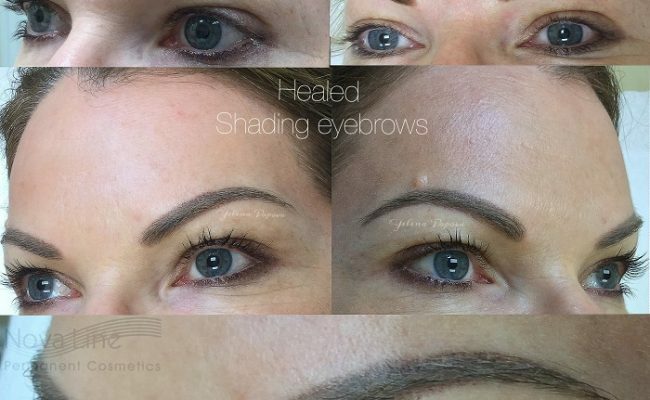 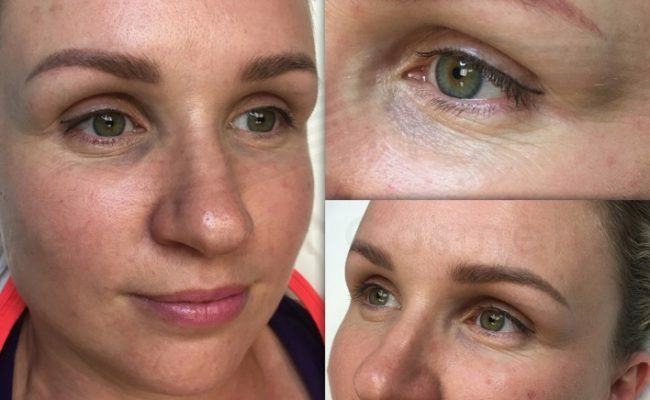 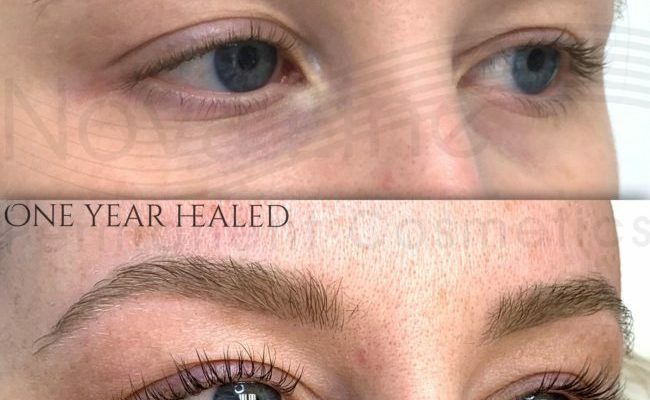 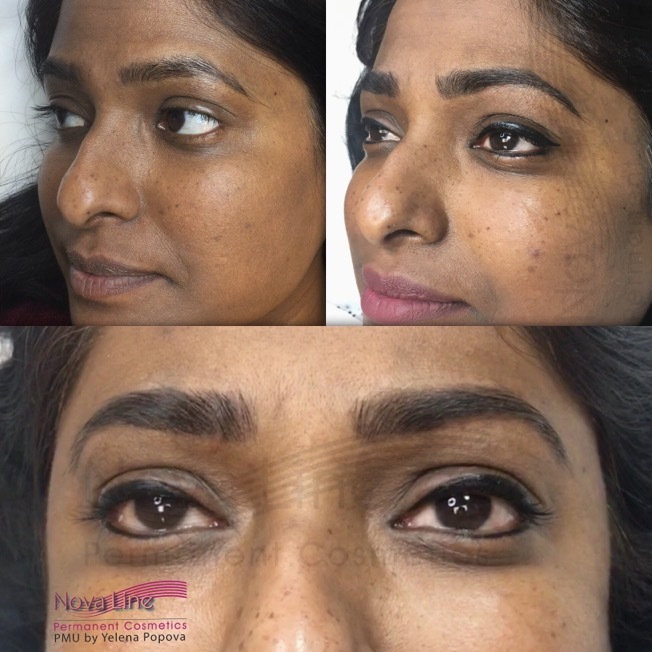 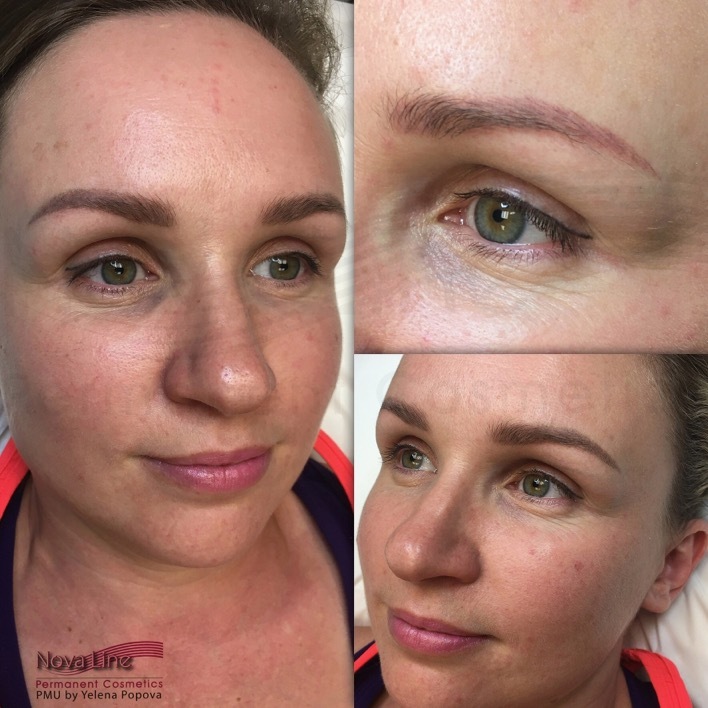 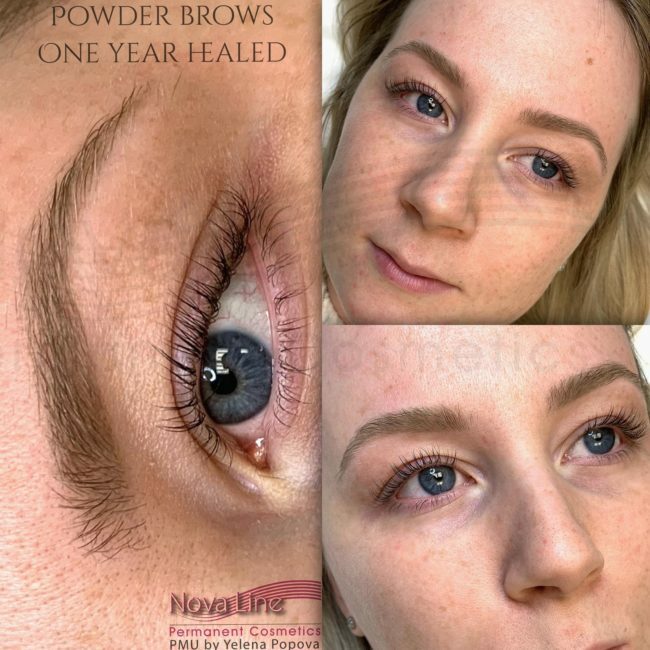 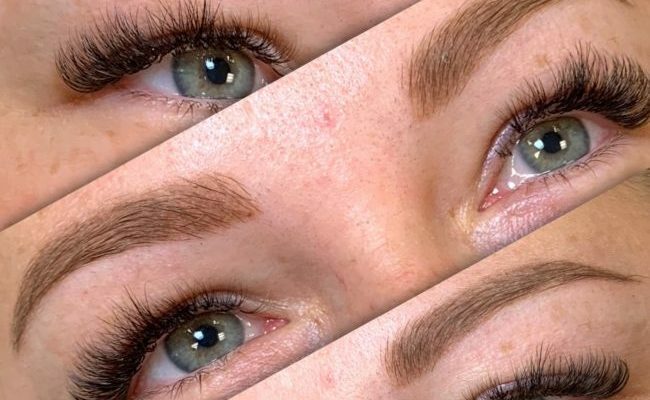 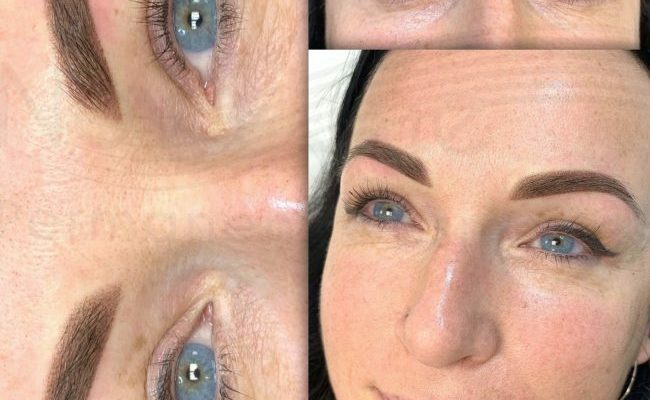 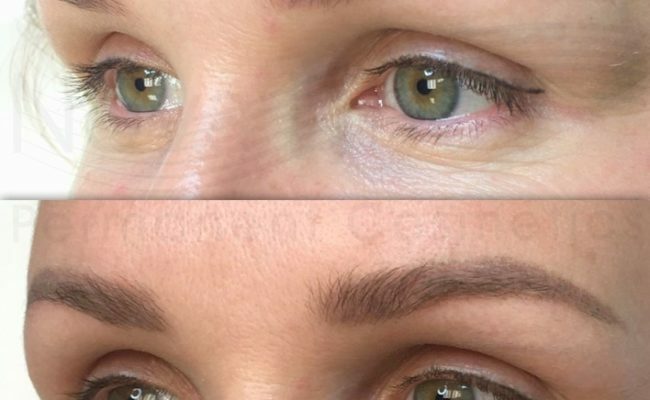 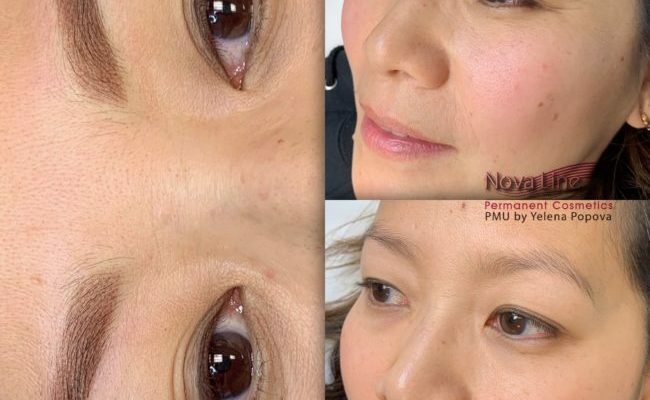 It is great for those seeking more definition, as well as colour correction or eyebrow reconstruction when missing a part or the whole eyebrow. 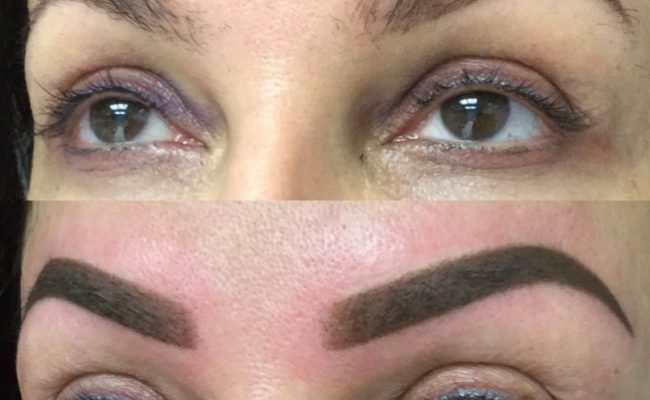 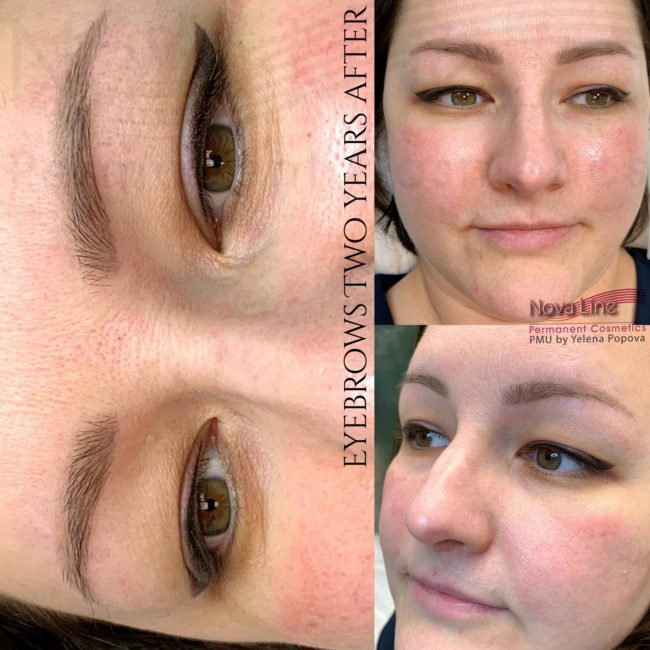 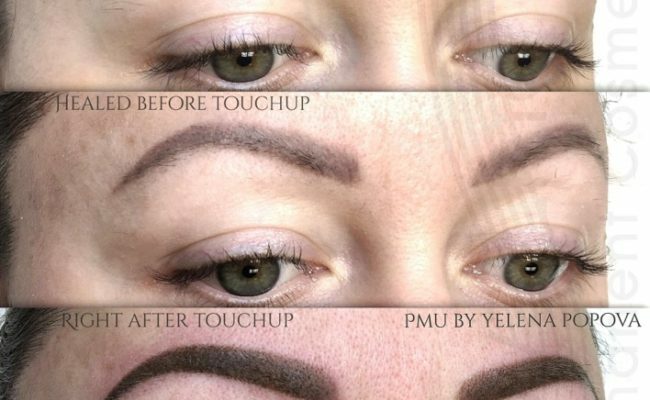 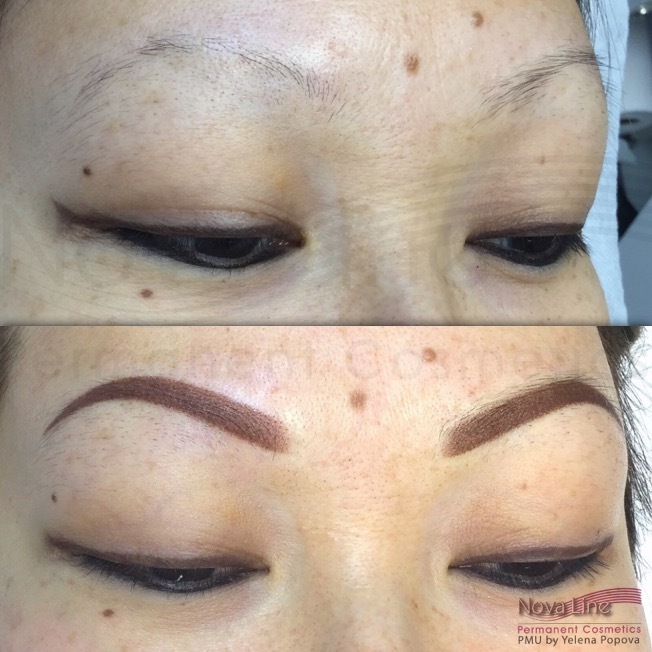 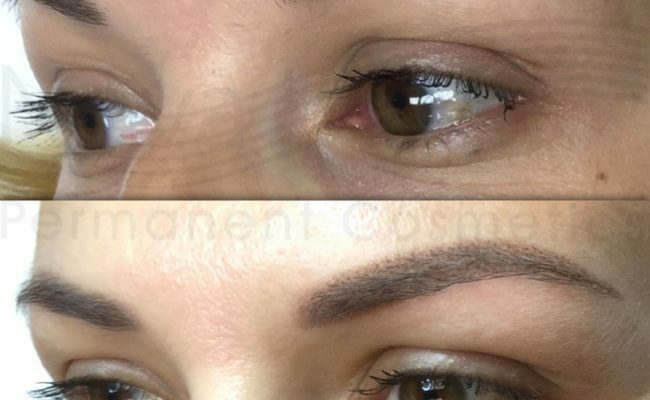 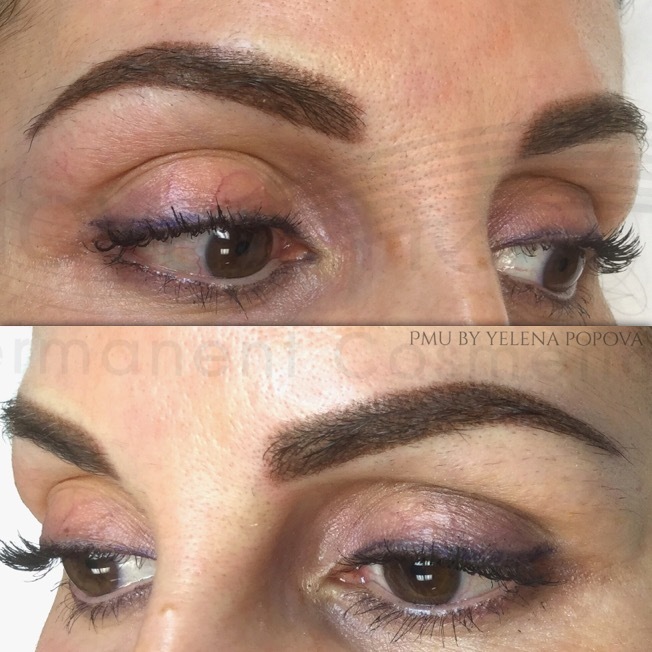 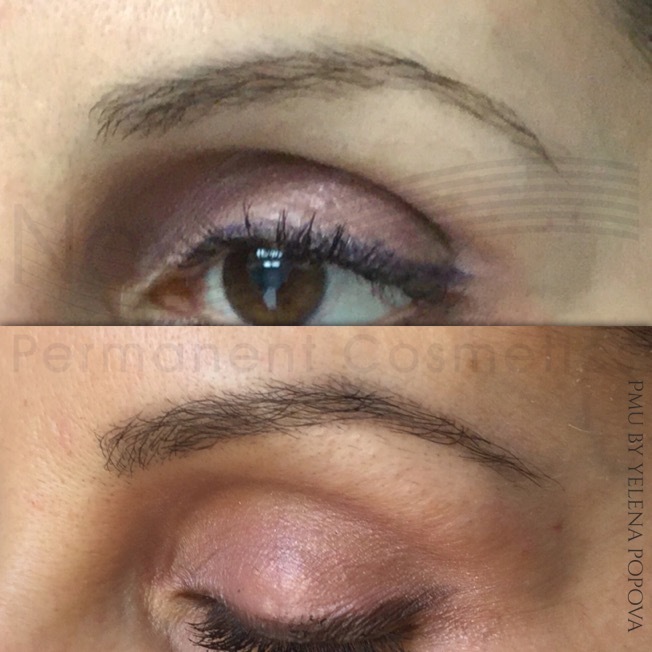 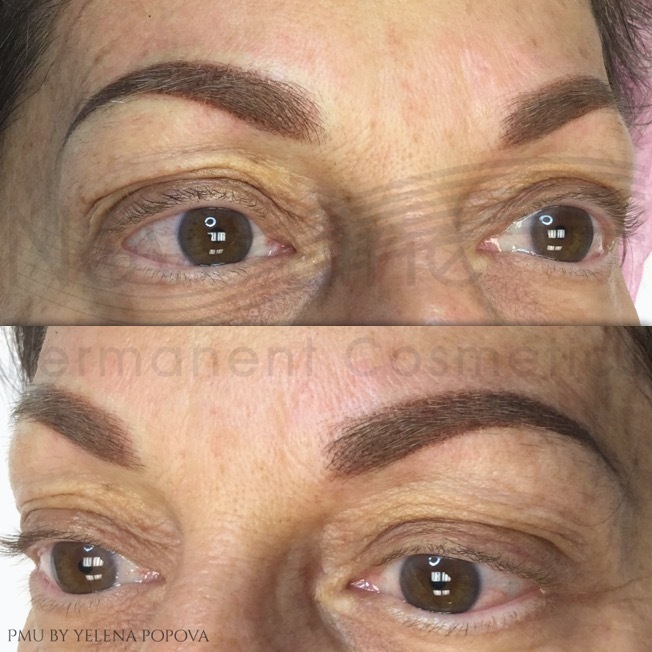 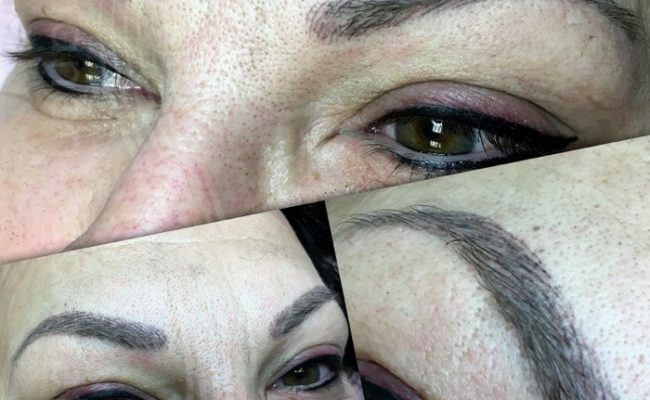 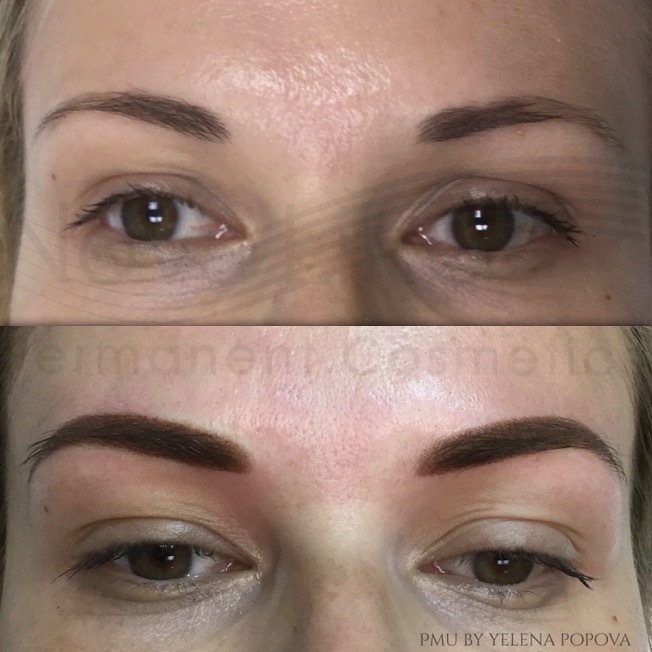 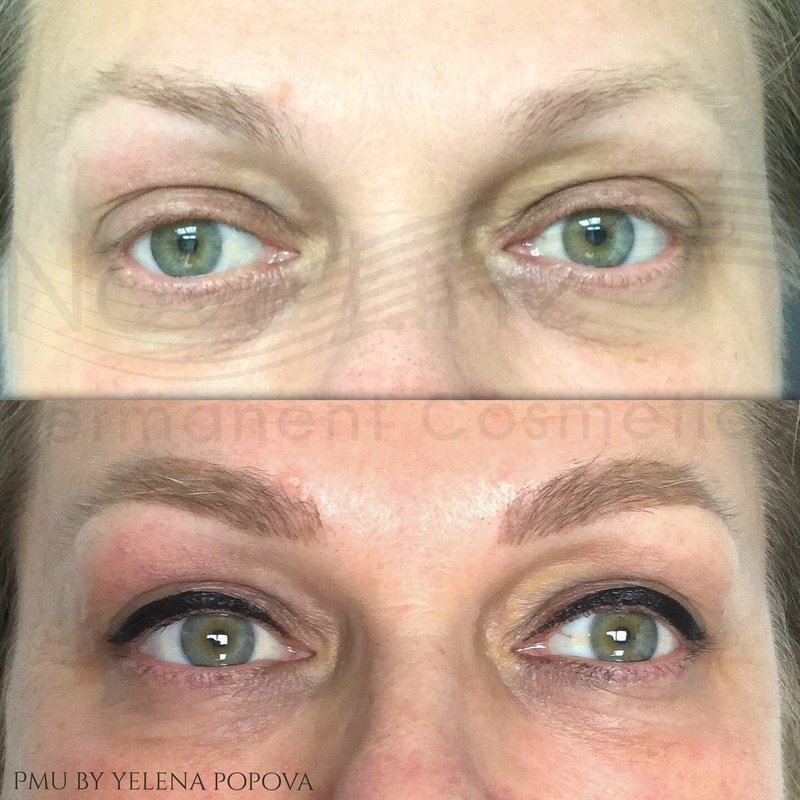 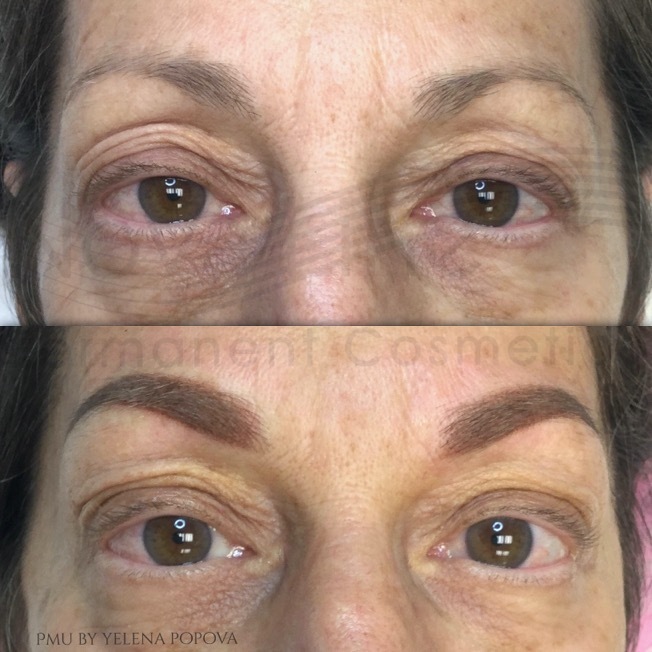 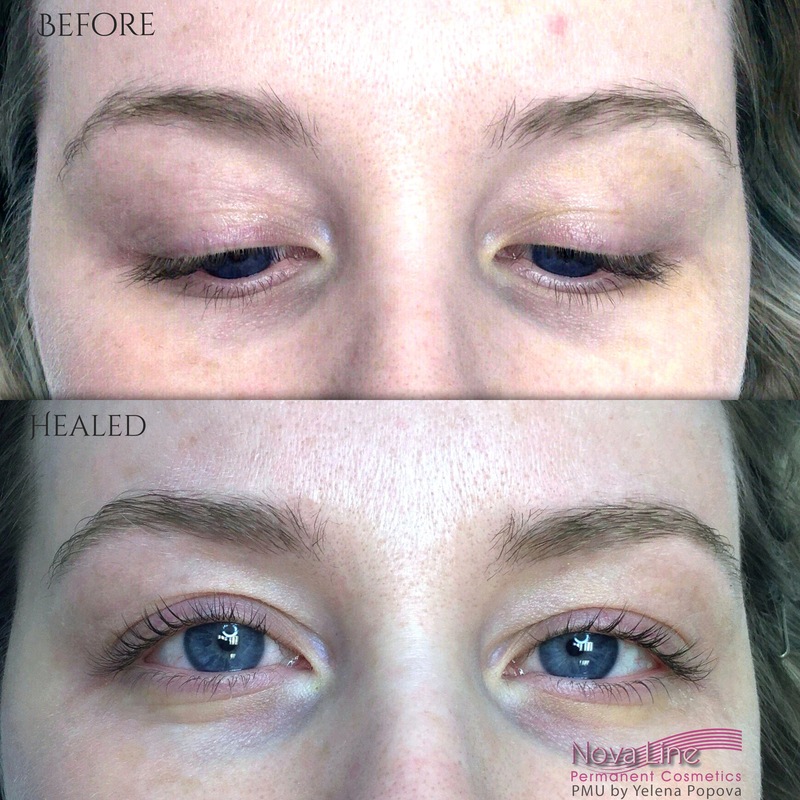 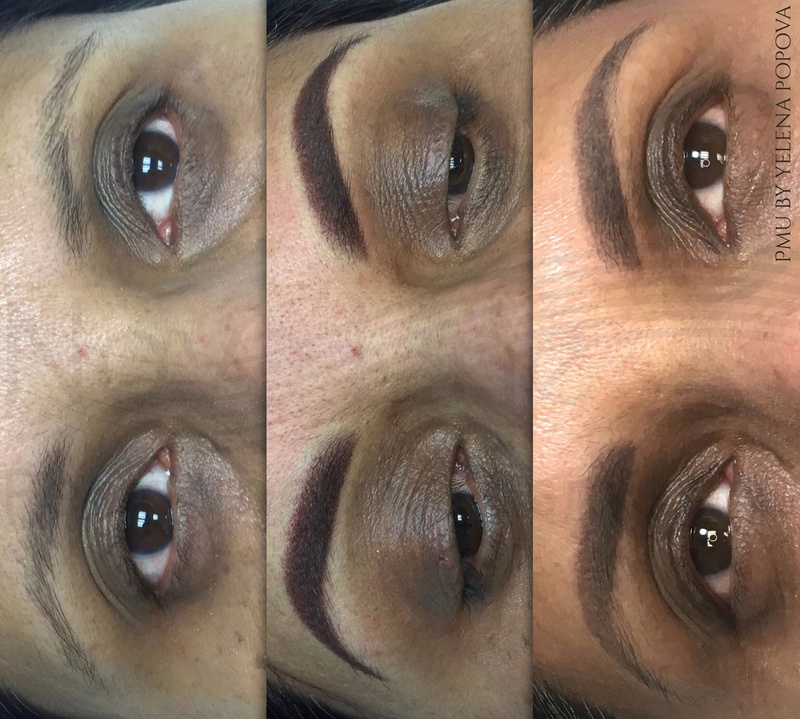 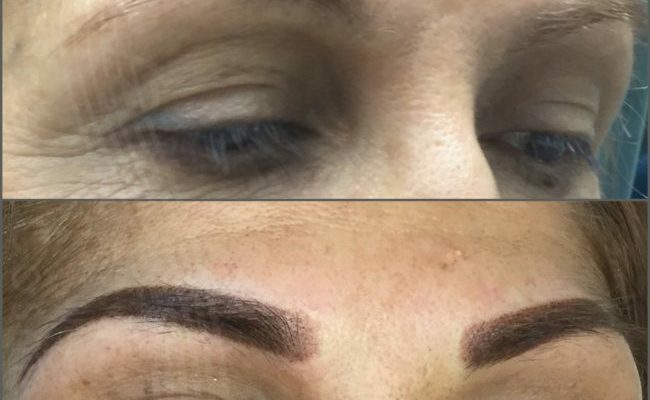 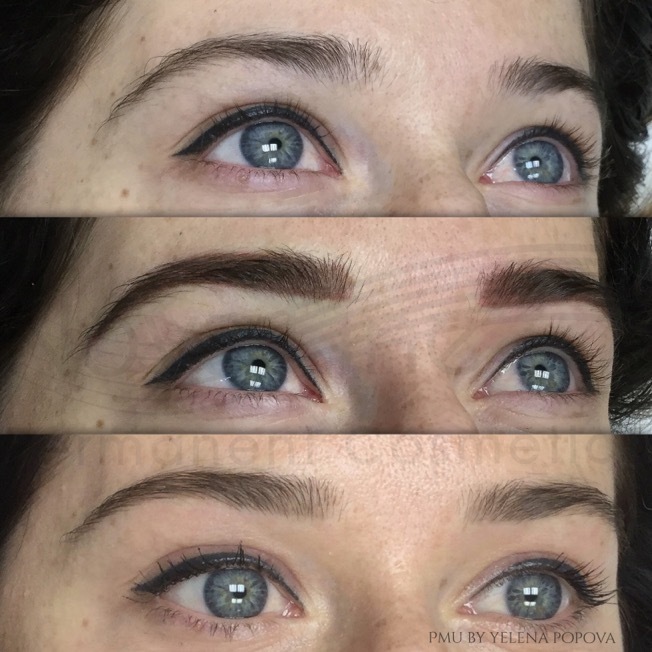 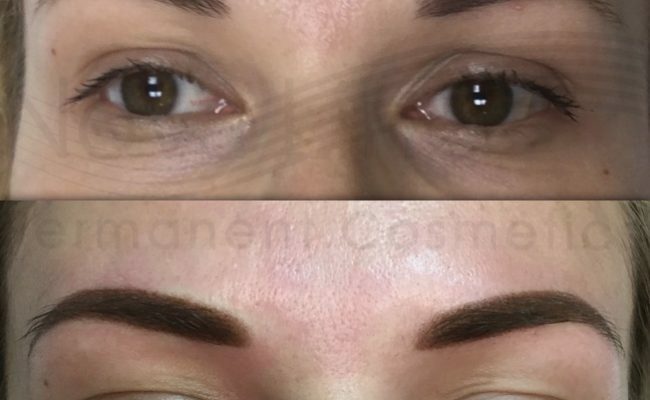 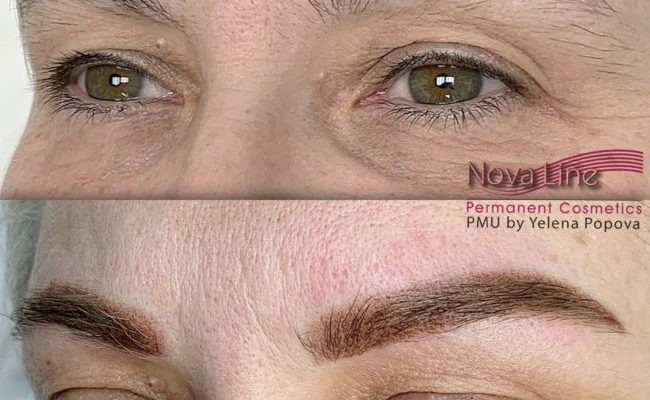 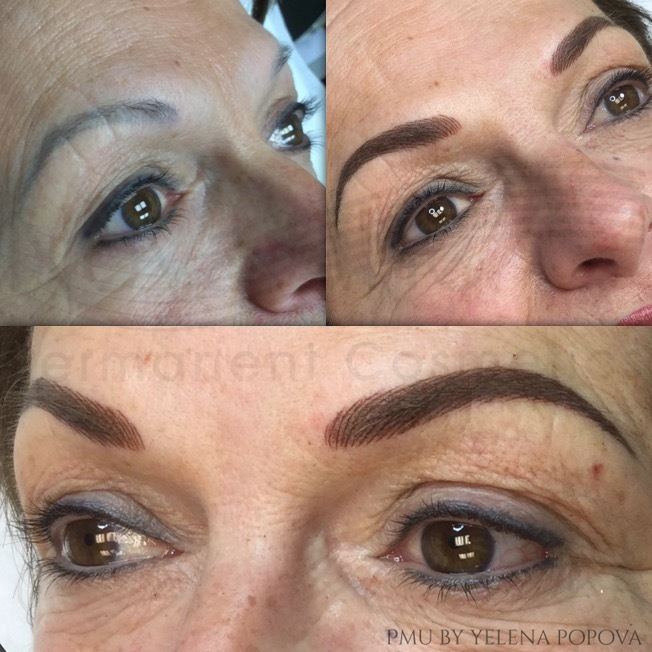 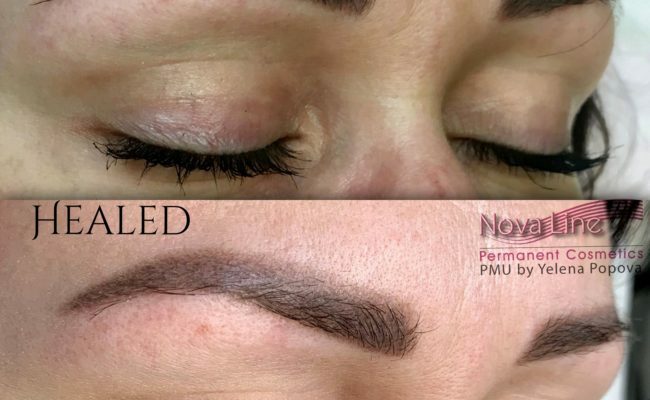 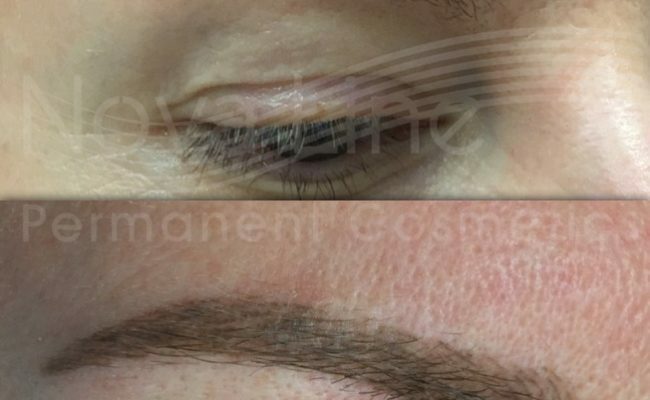 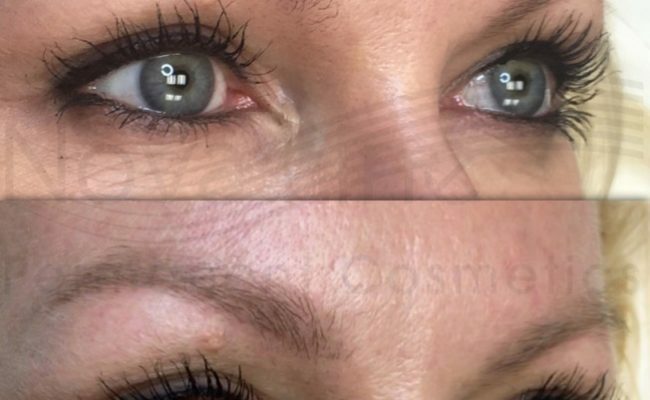 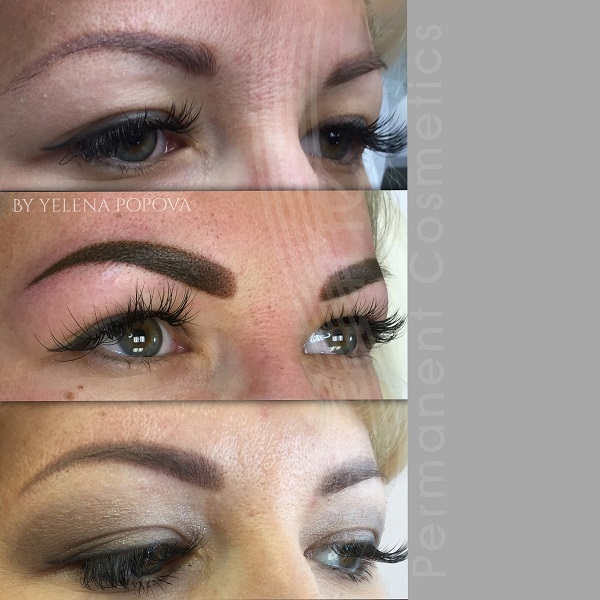 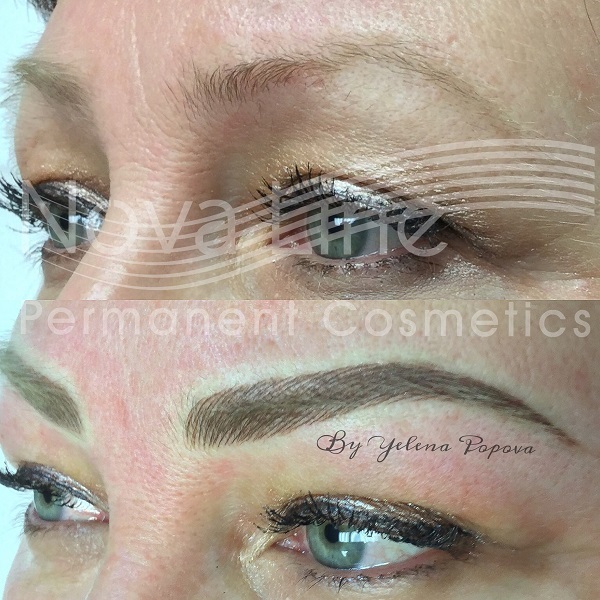 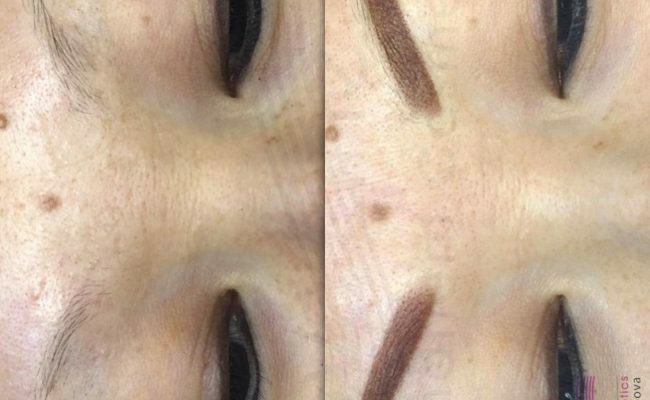 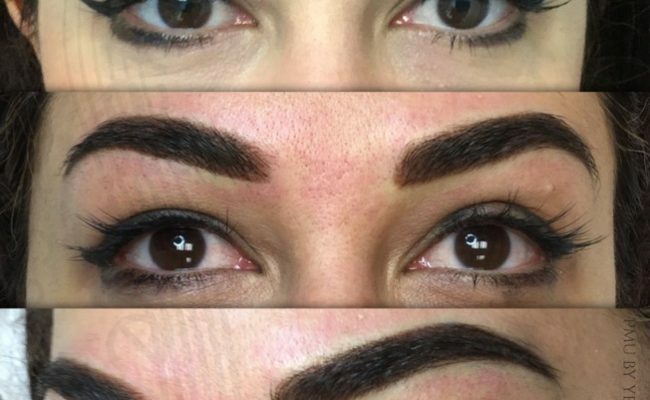 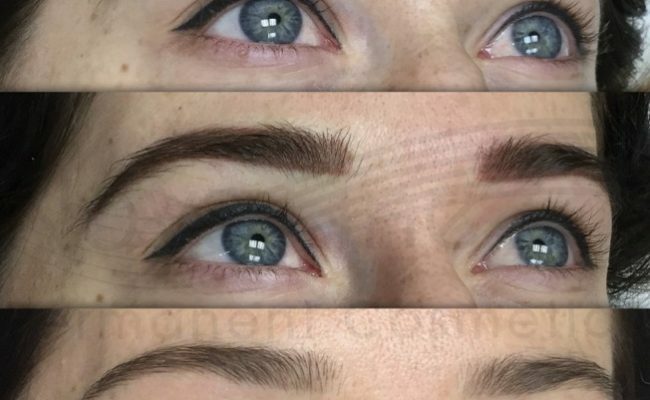 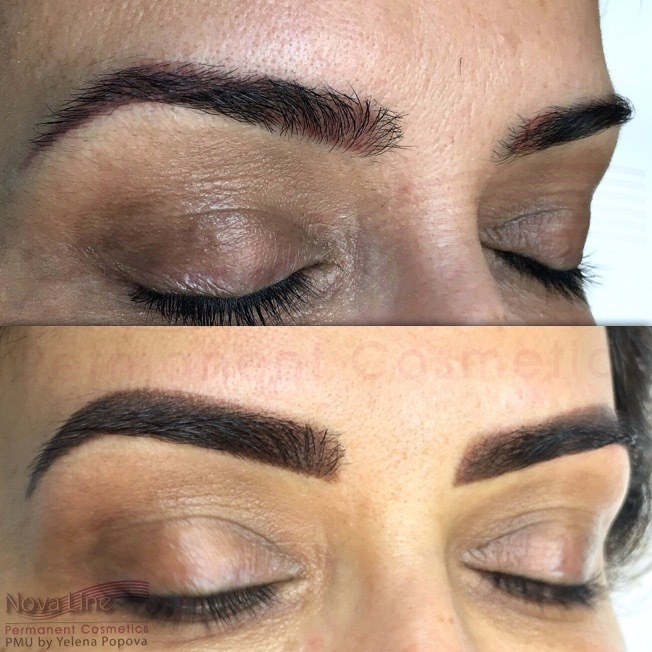 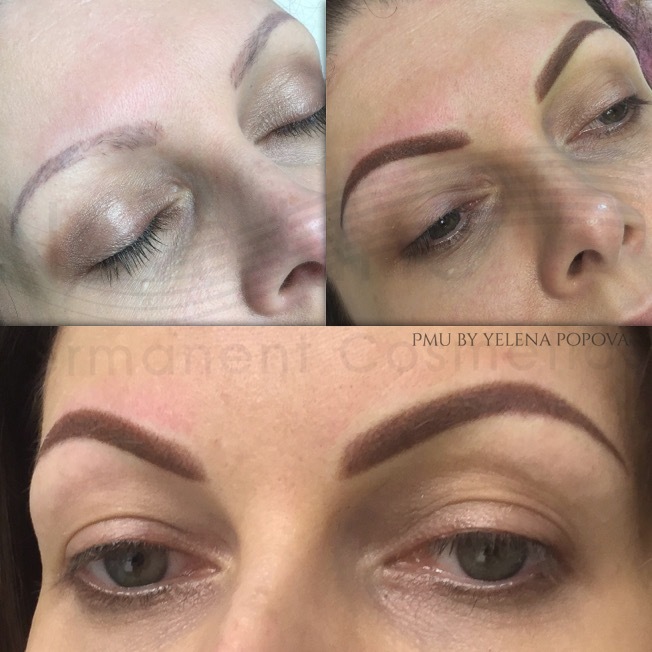 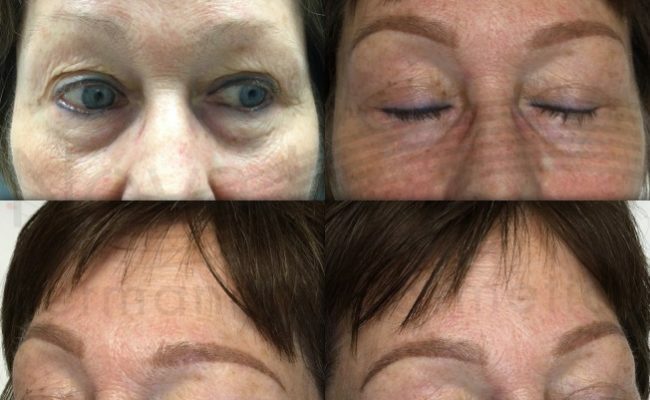 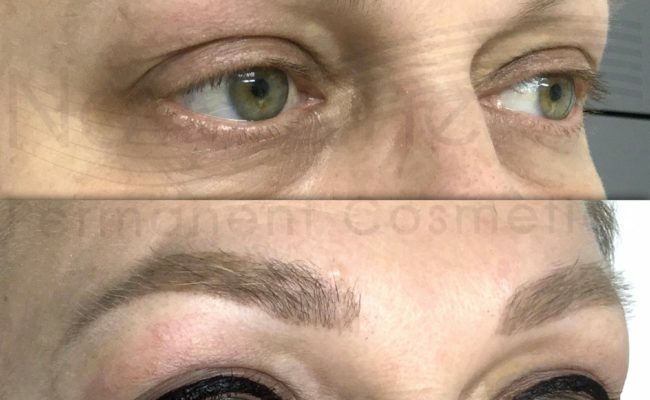 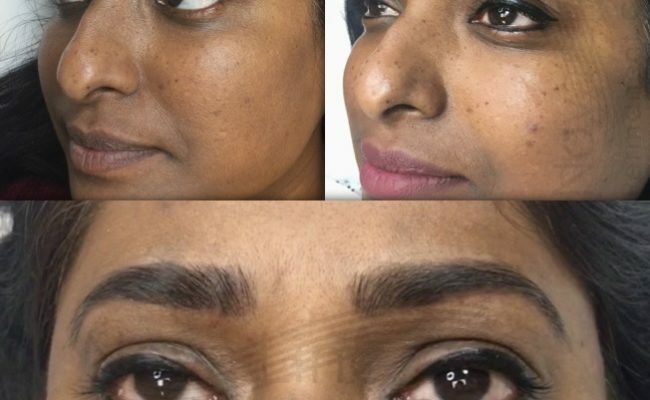 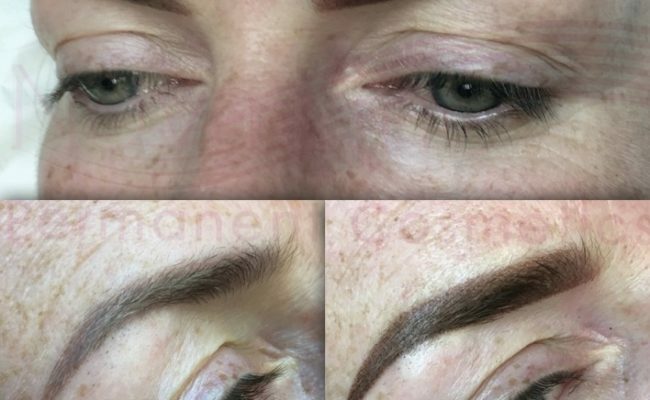 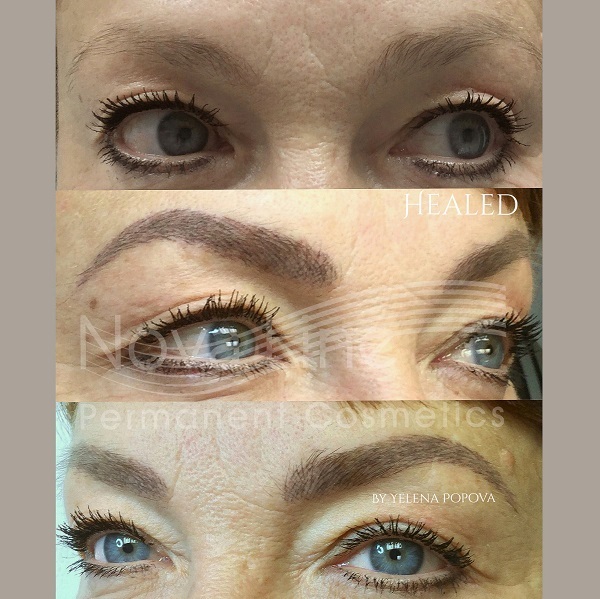 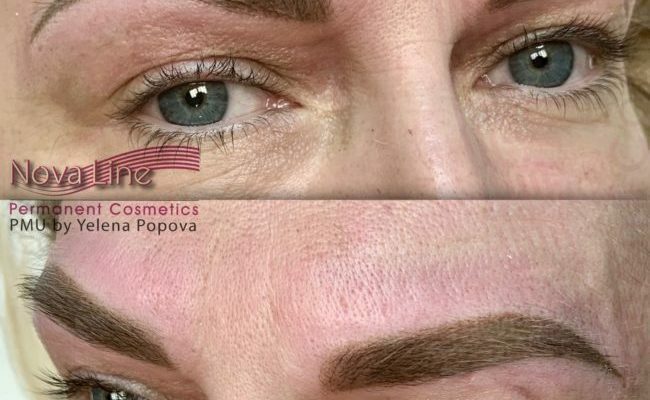 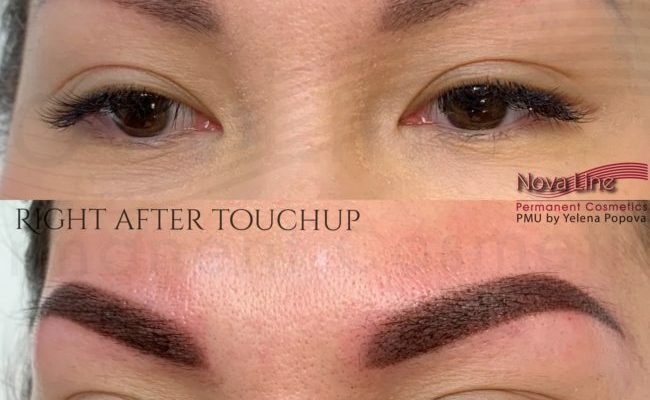 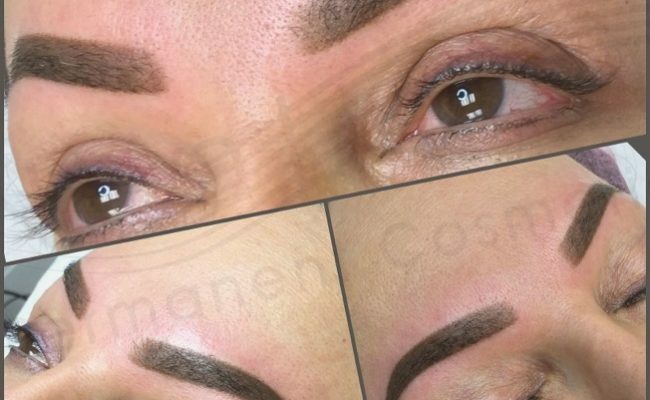 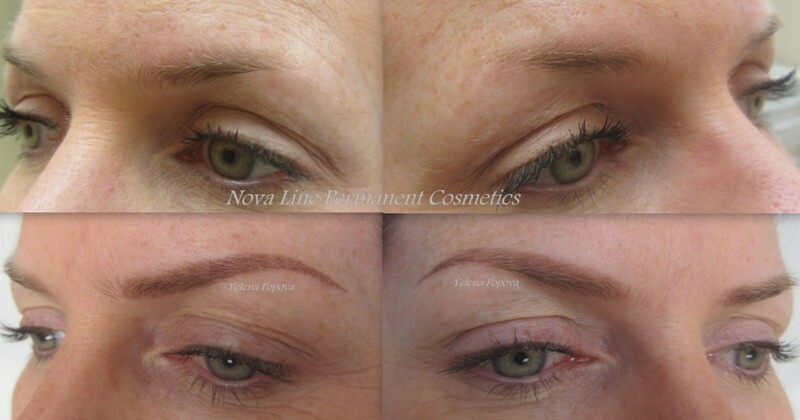 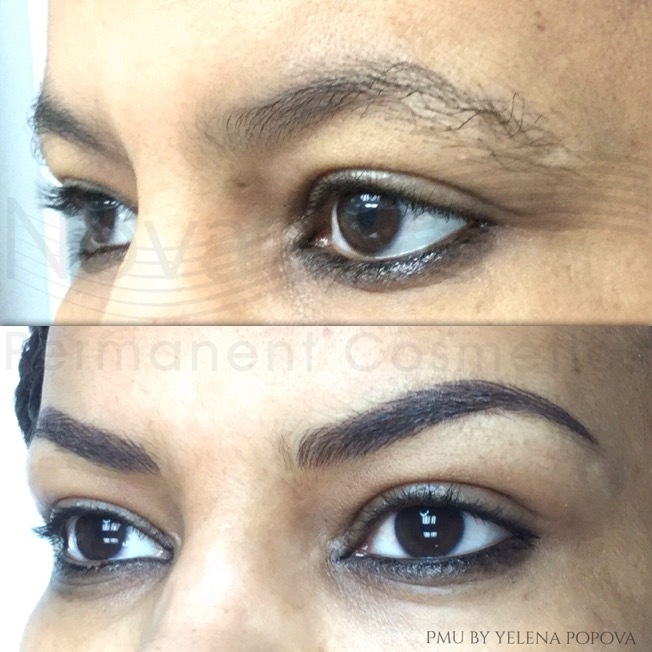 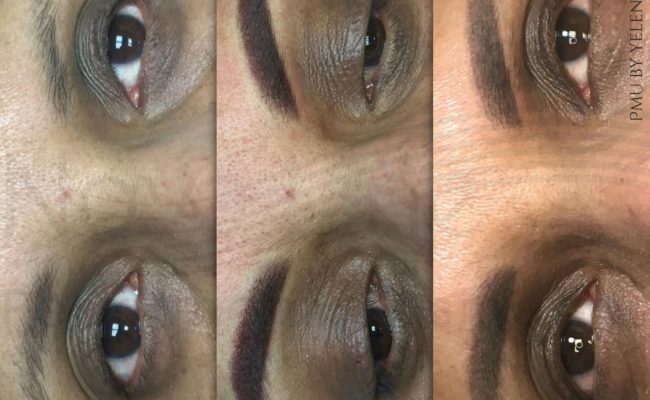 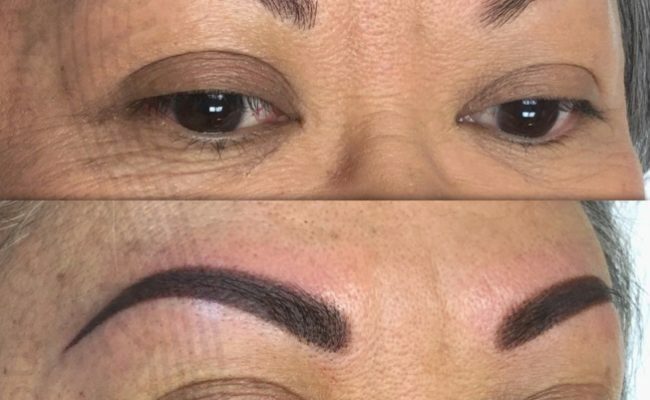 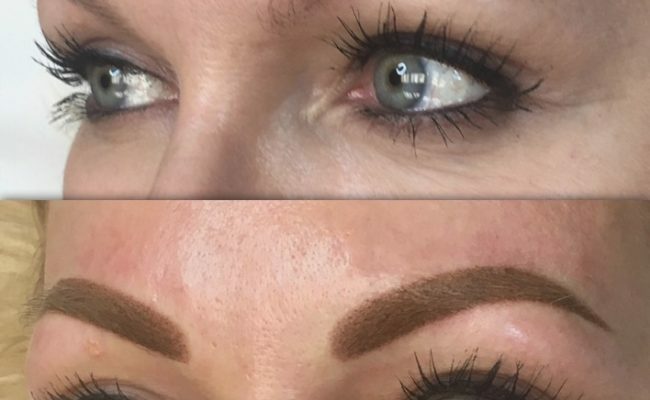 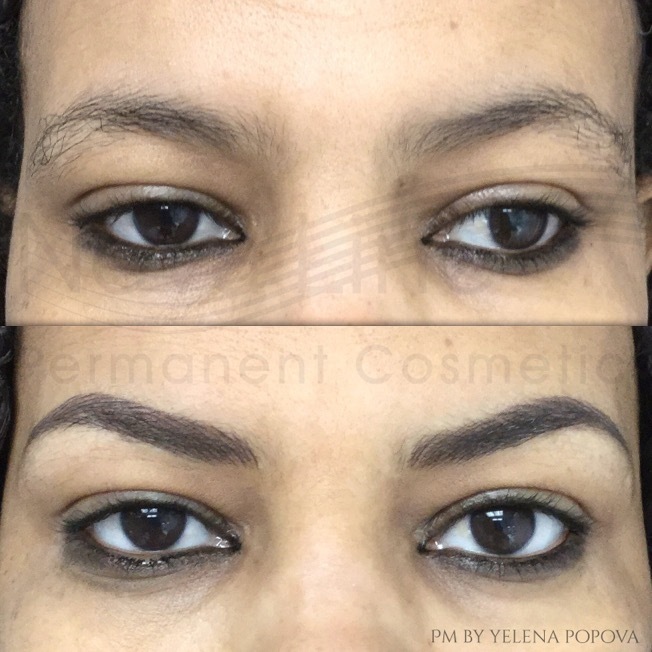 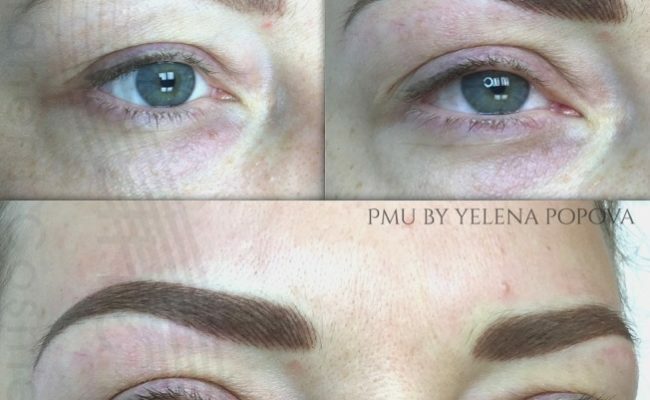 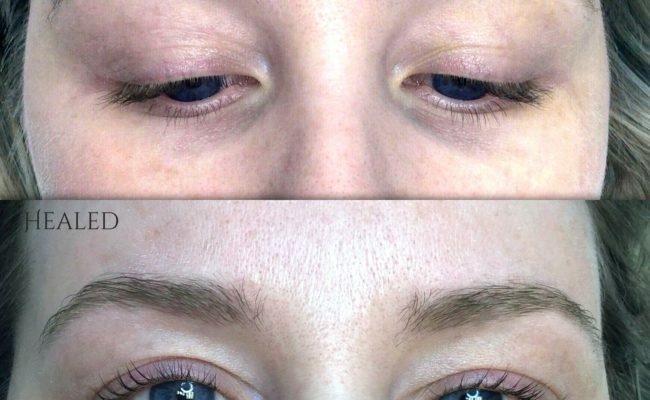 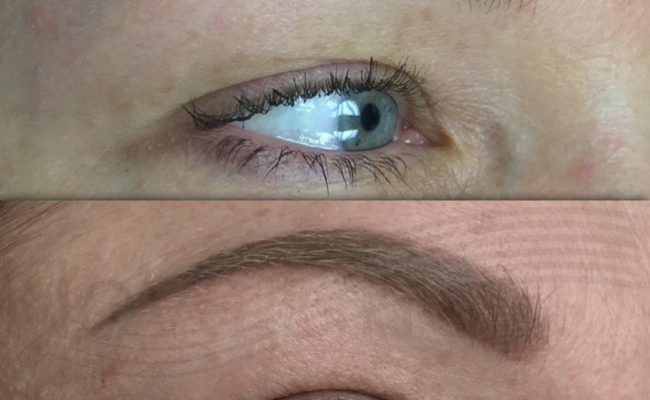 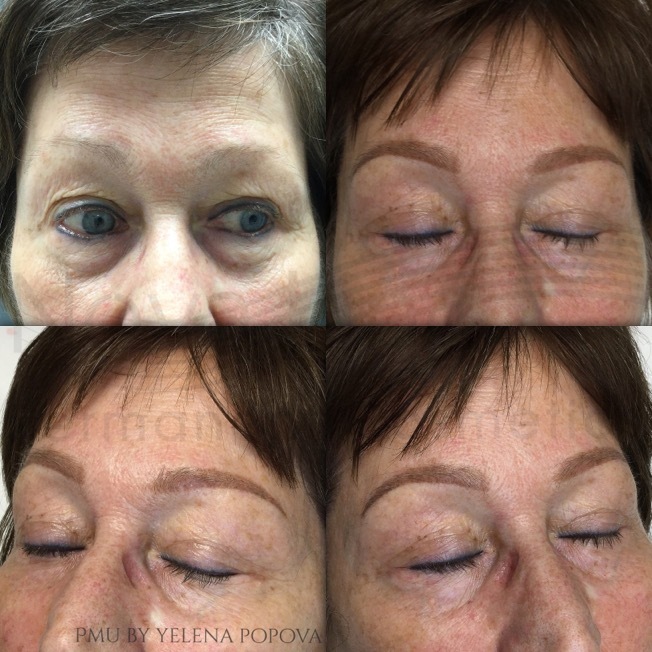 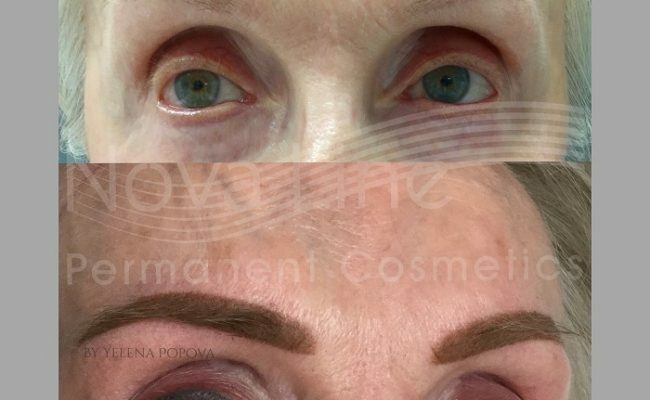 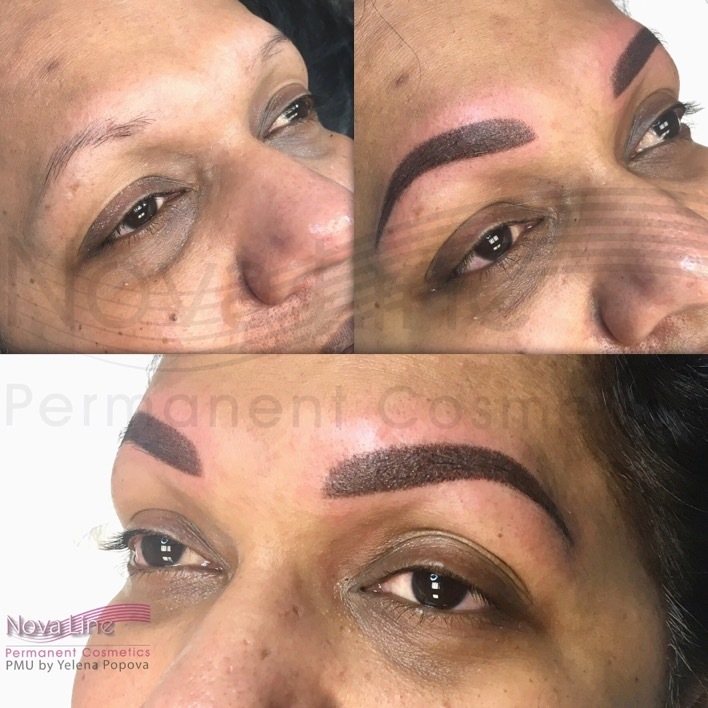 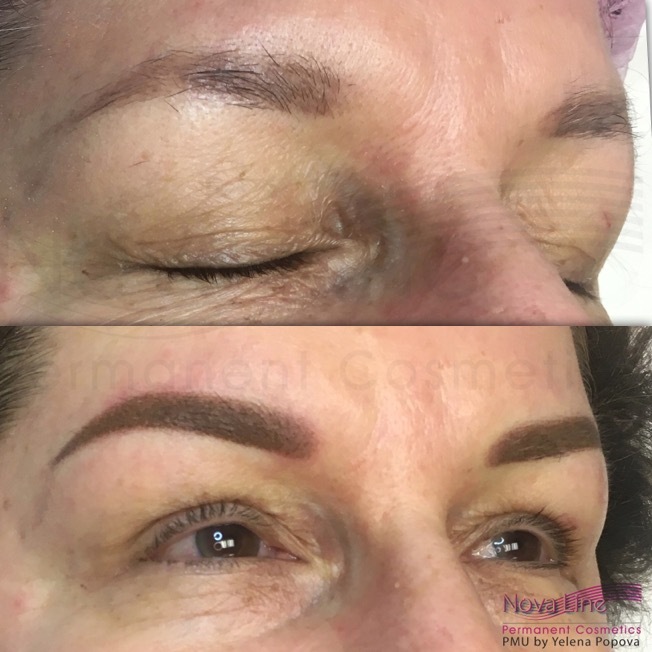 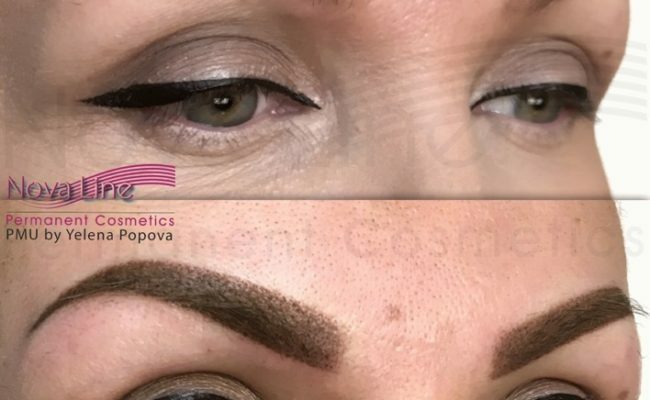 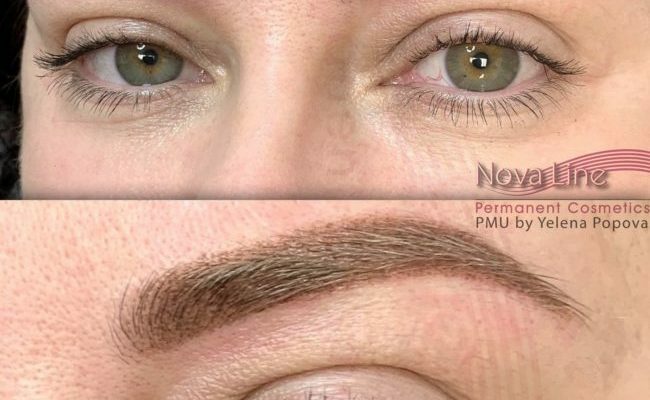 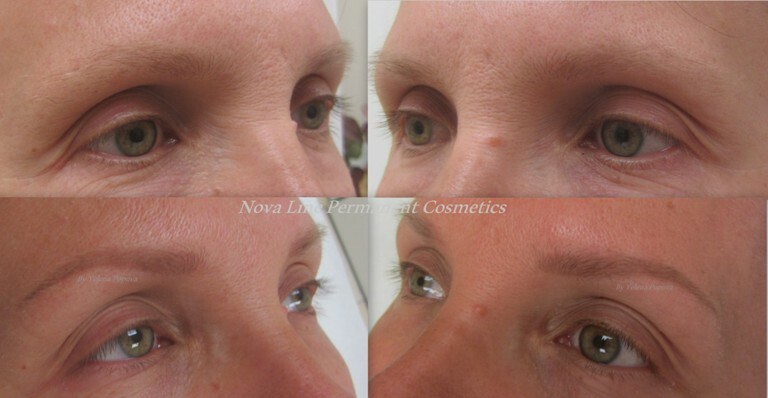 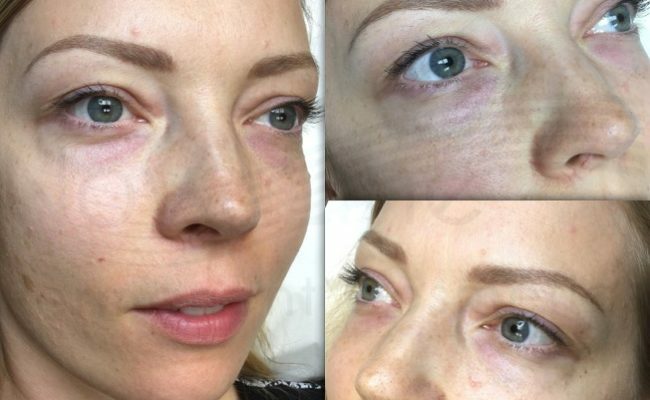 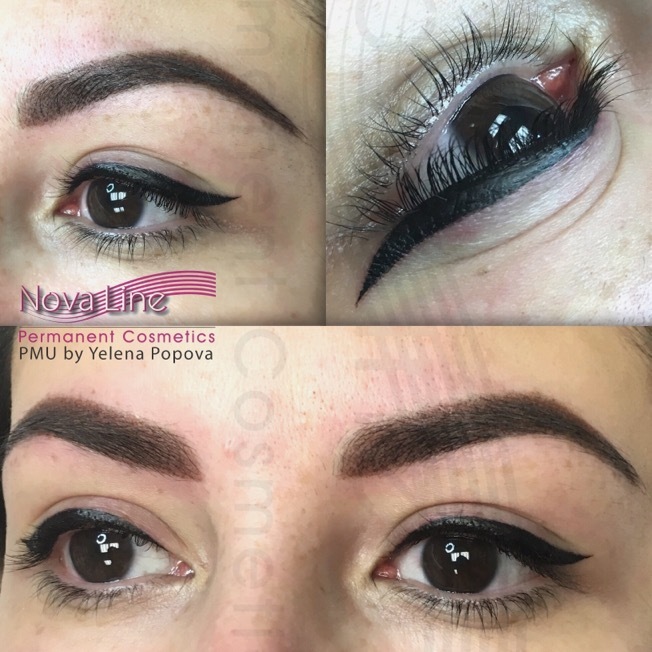 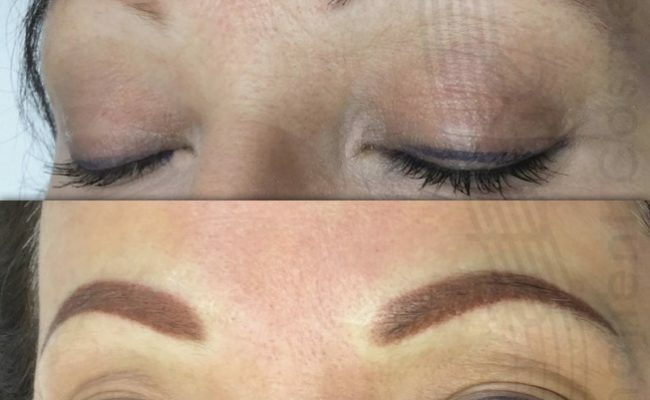 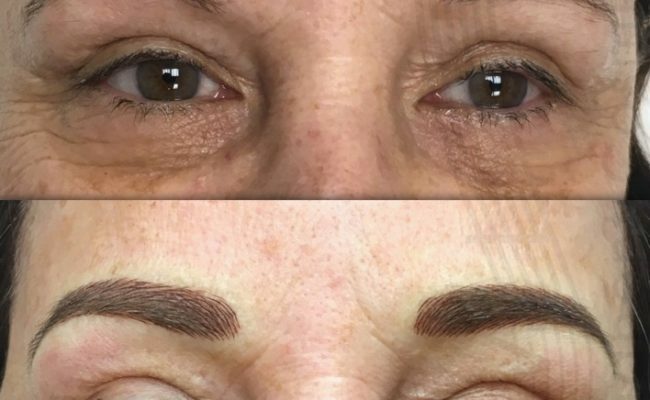 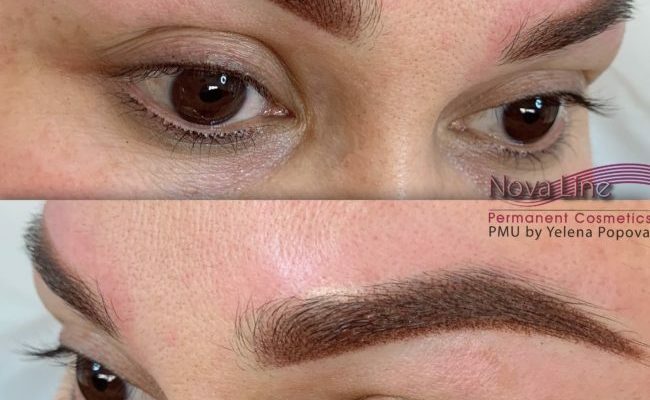 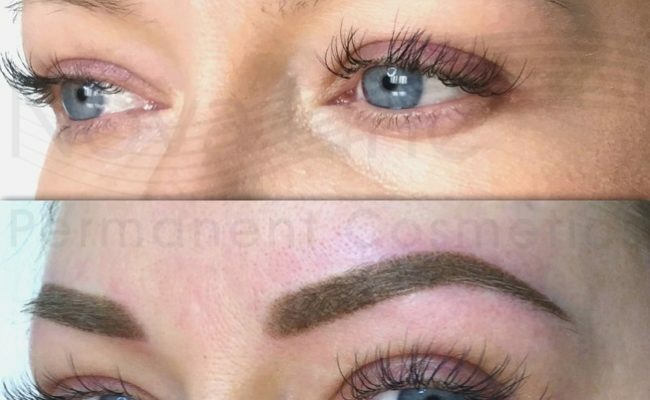 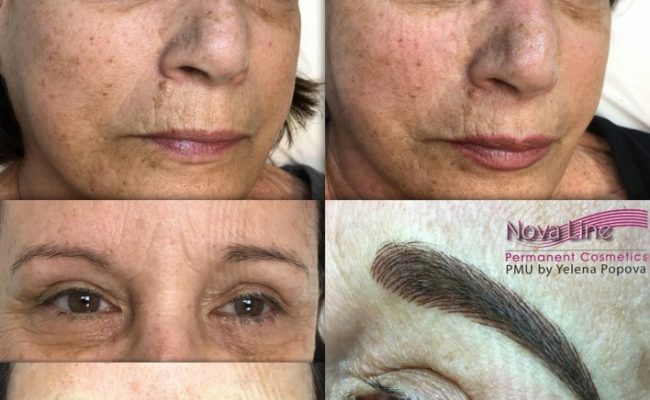 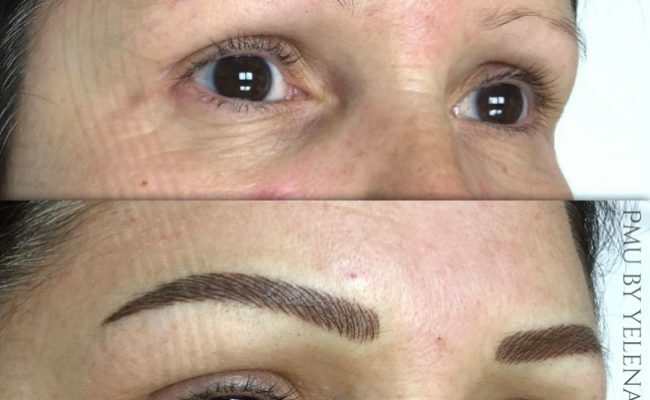 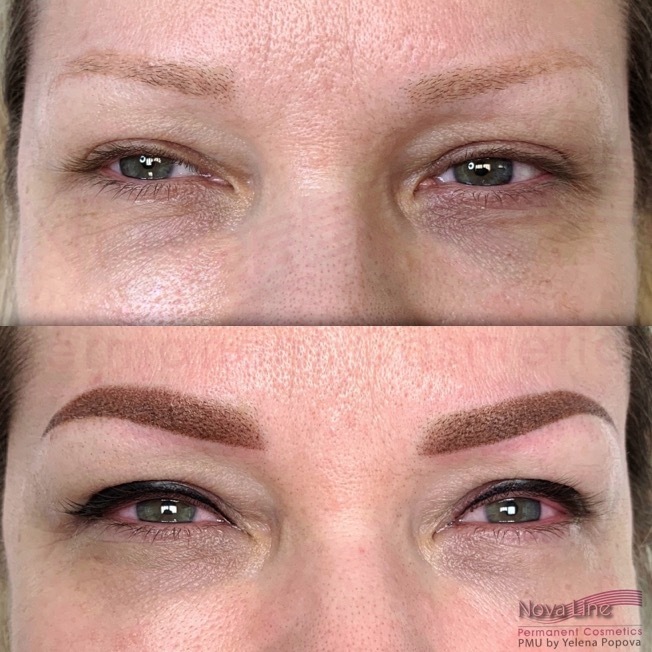 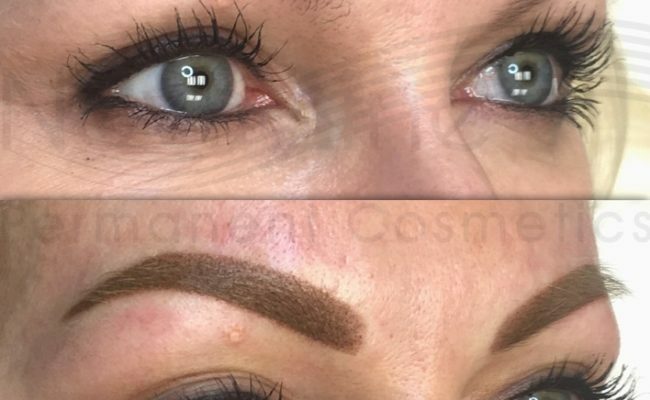 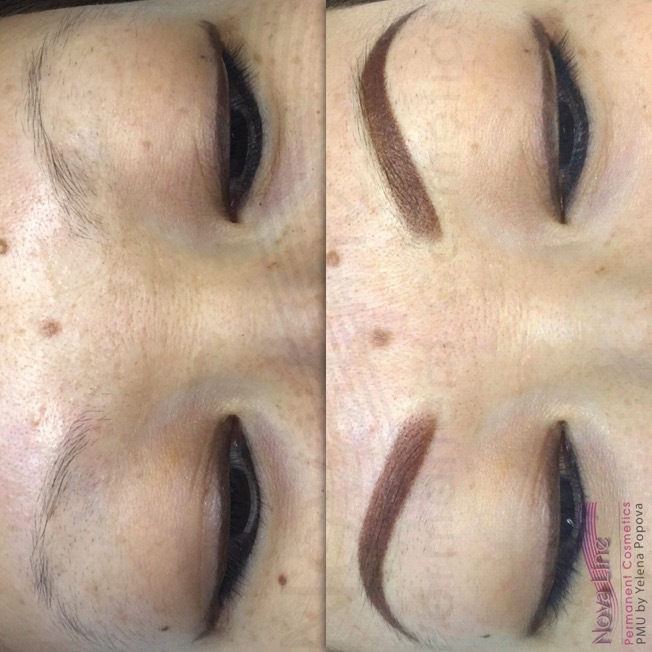 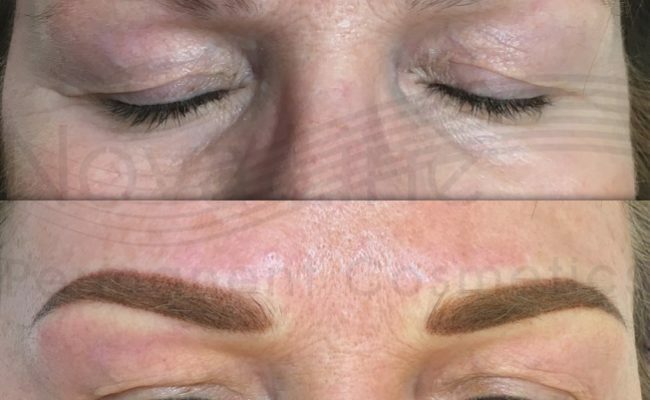 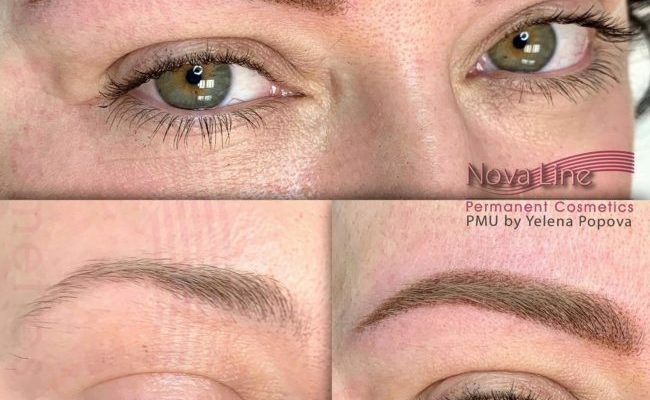 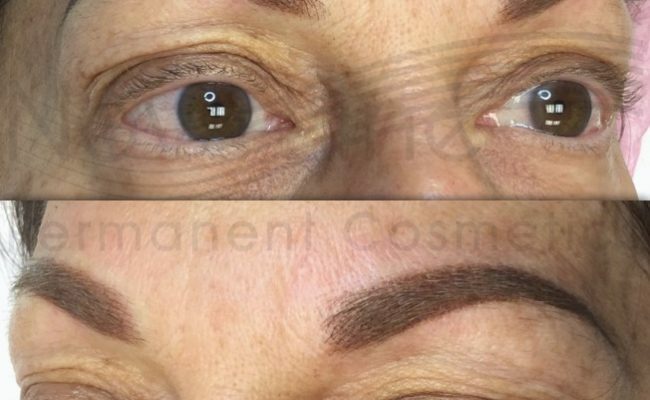 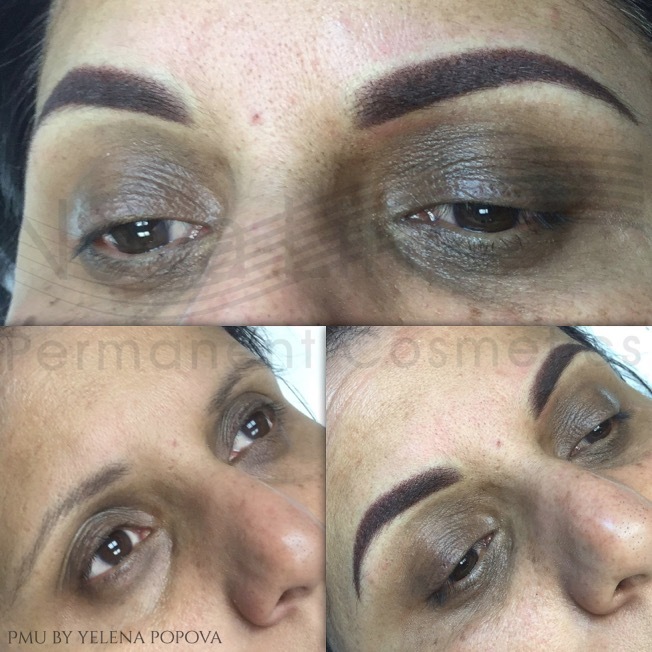 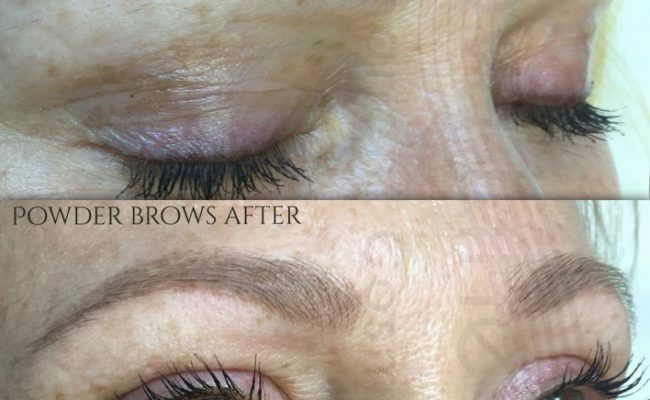 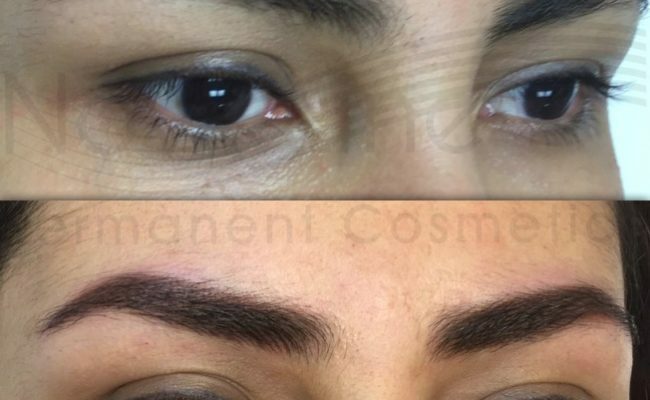 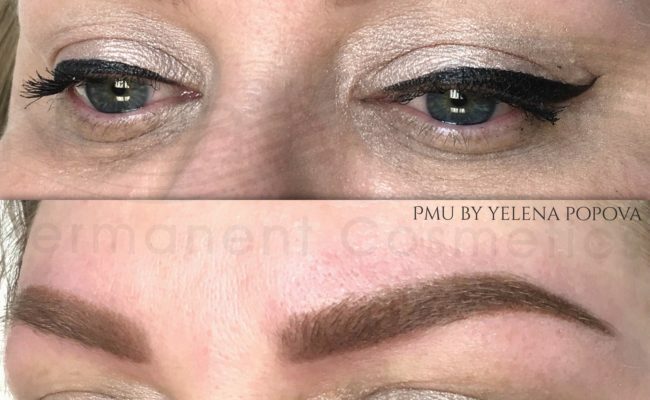 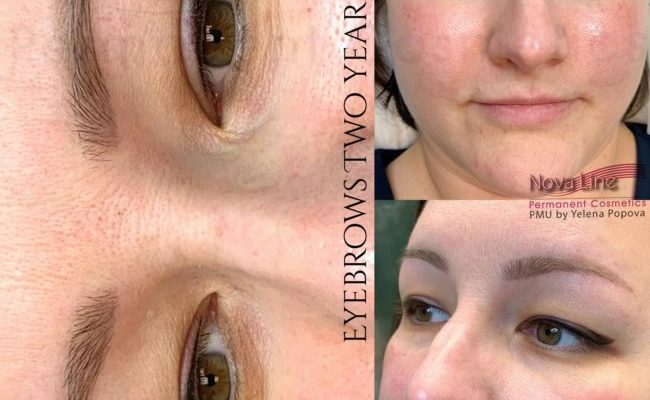 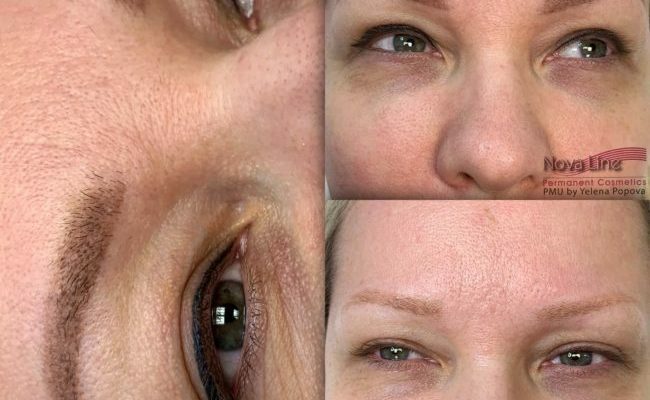 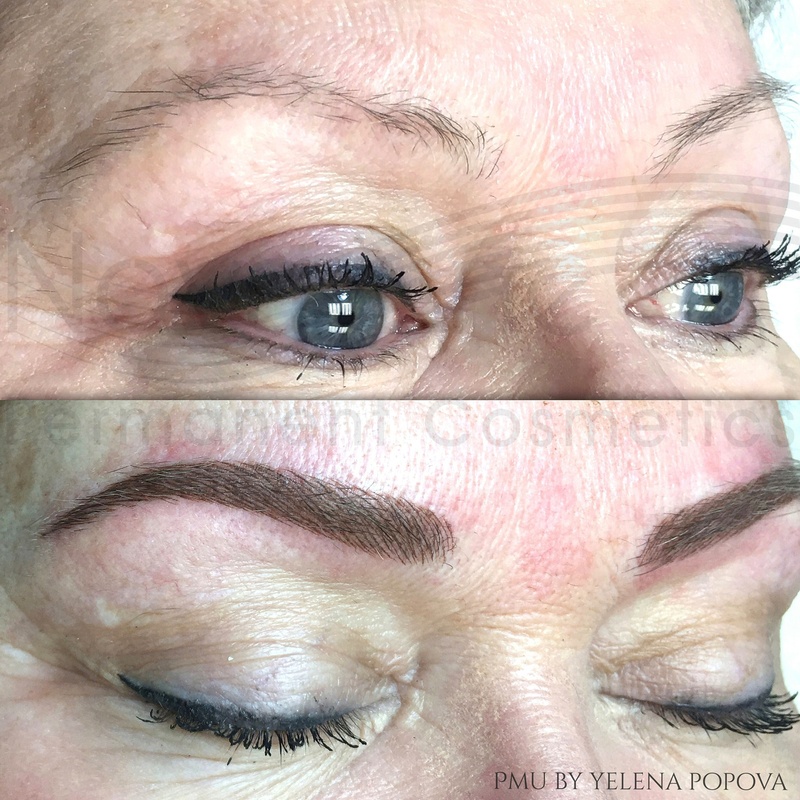 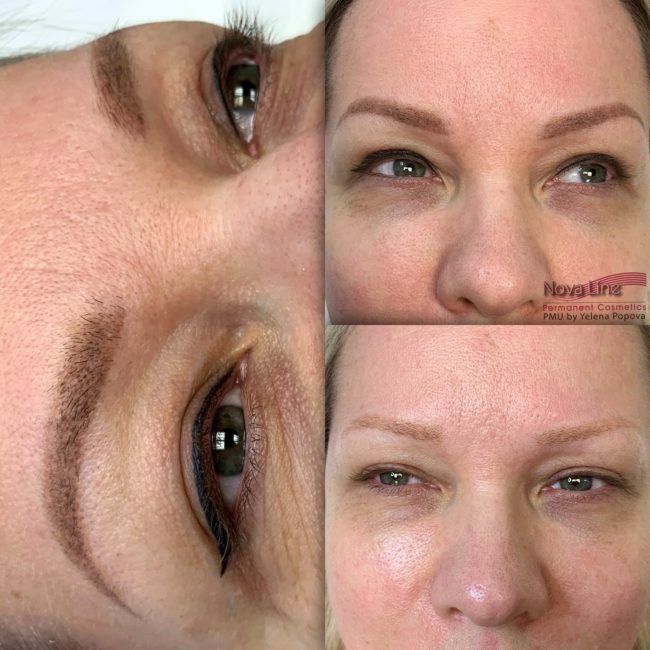 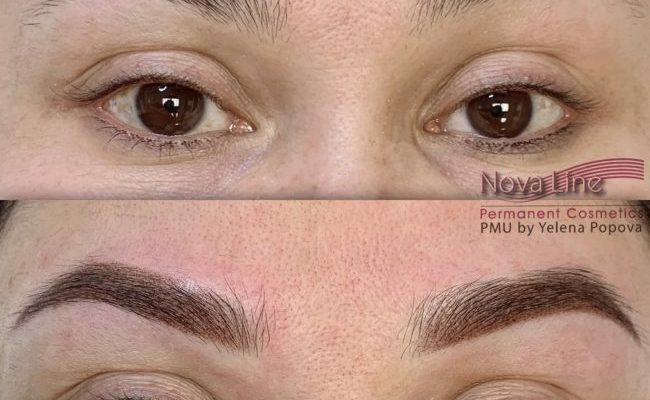 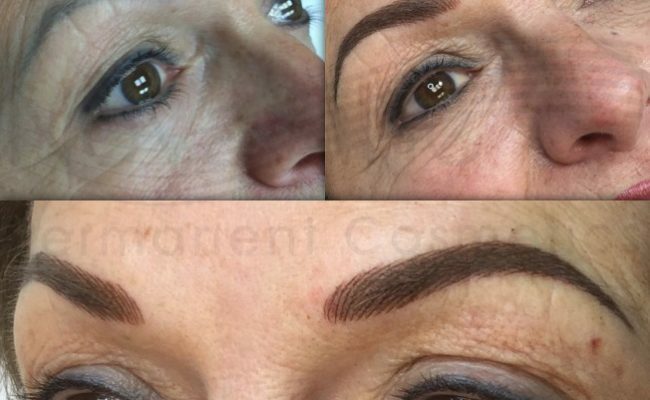 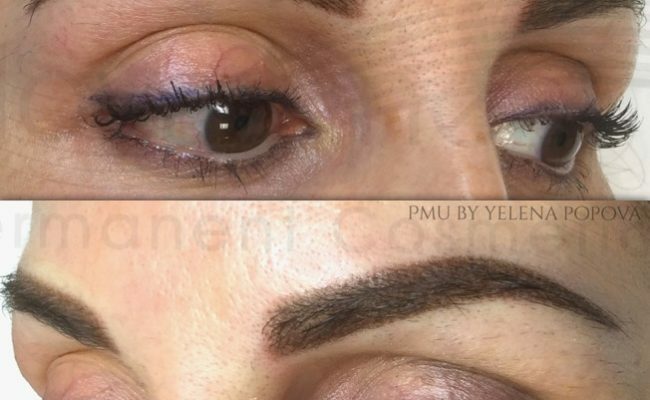 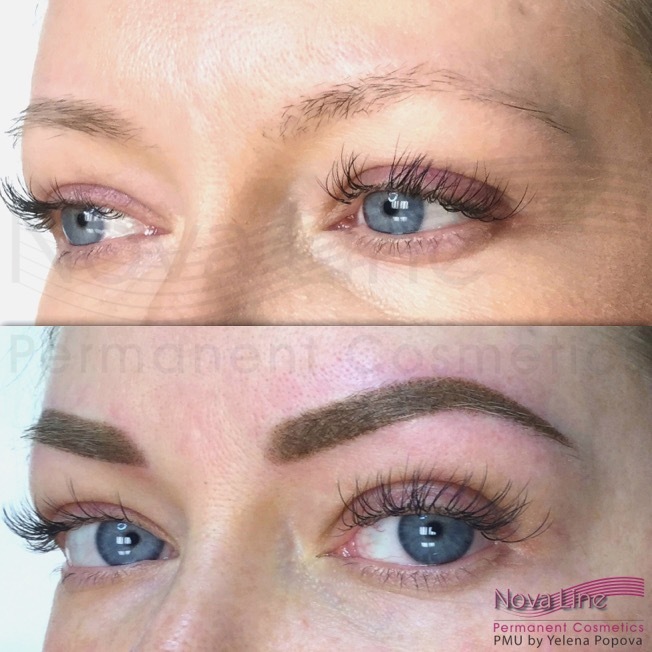 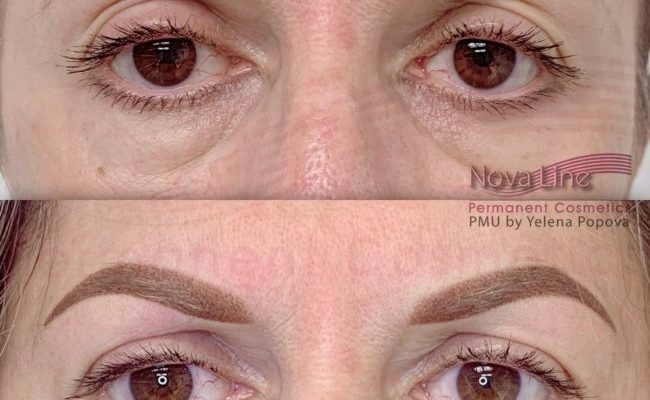 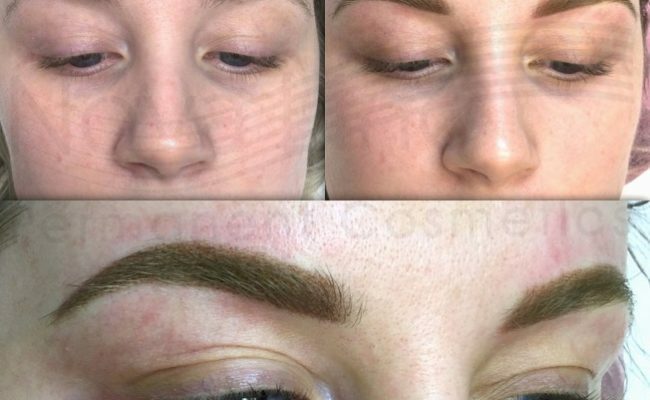 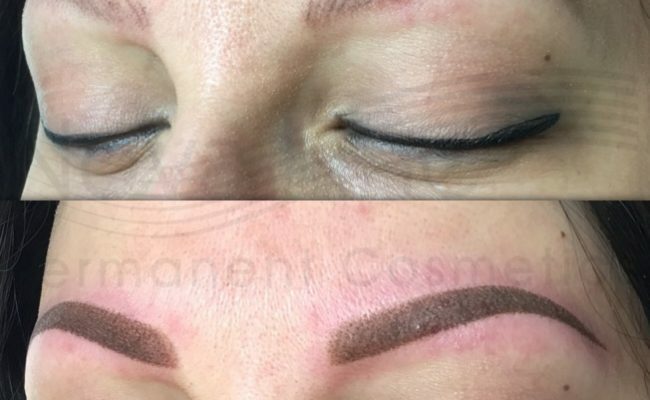 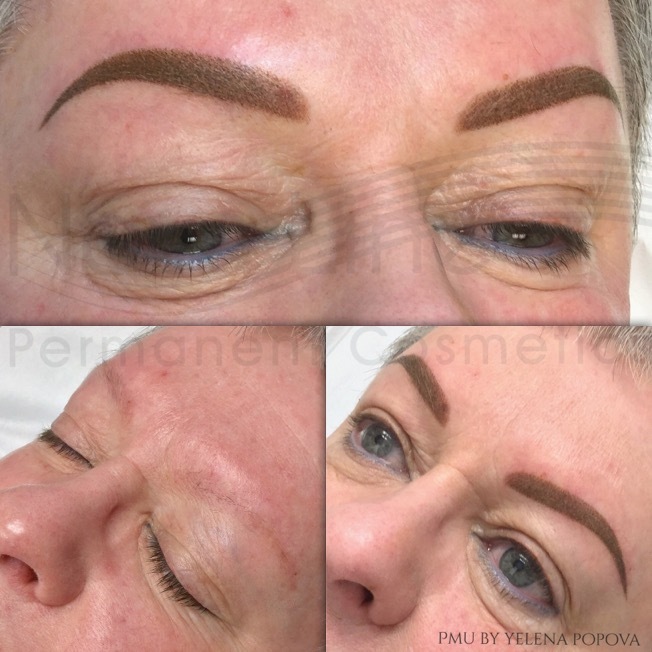 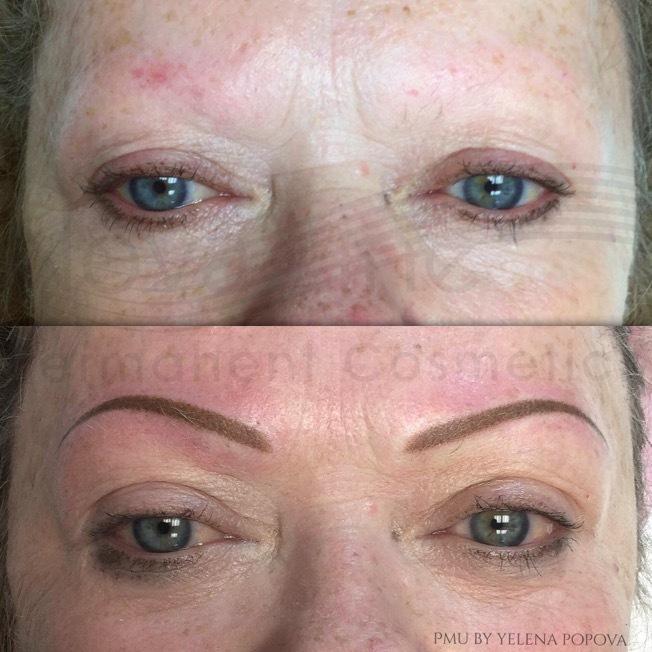 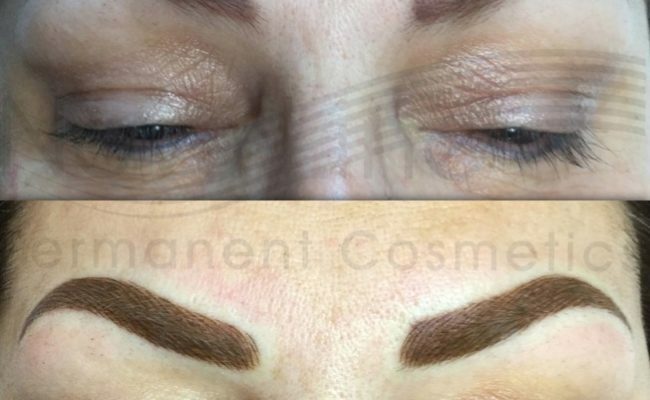 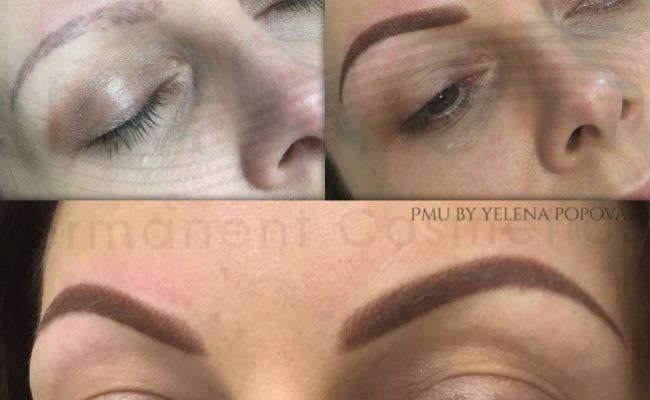 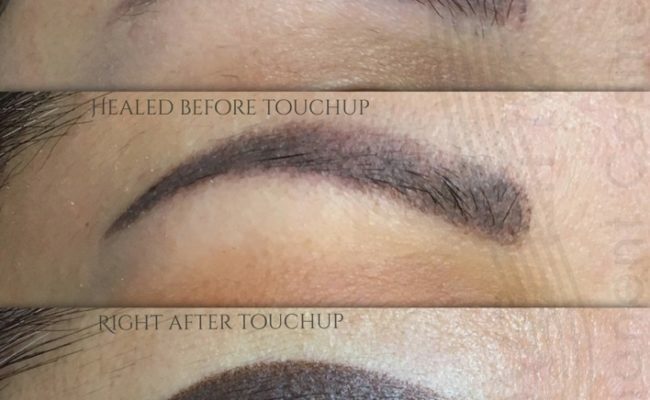 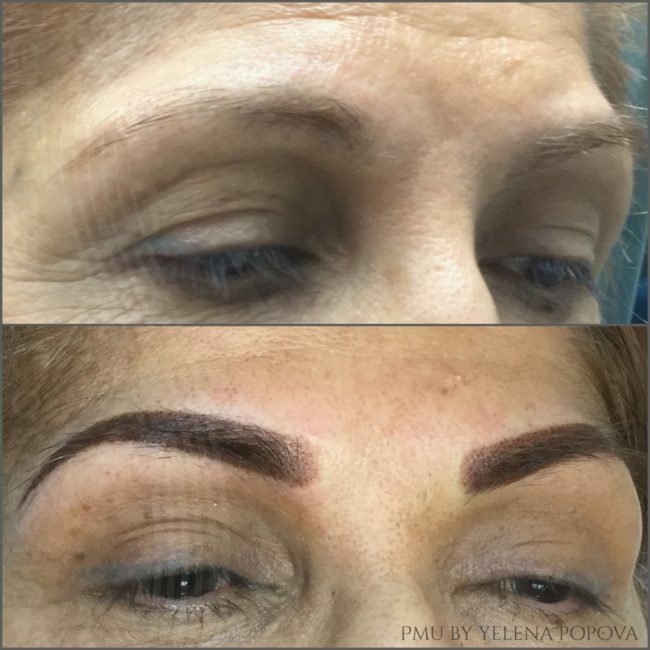 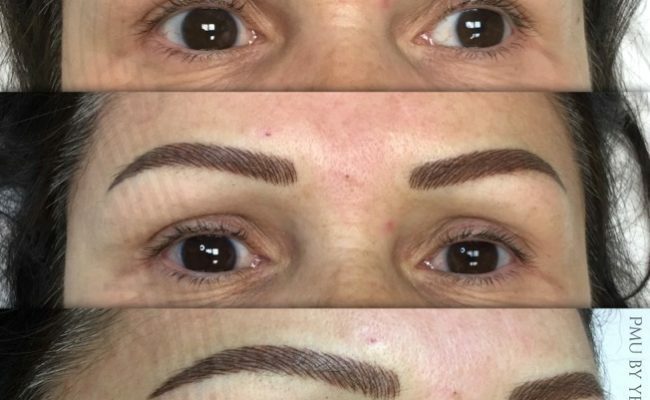 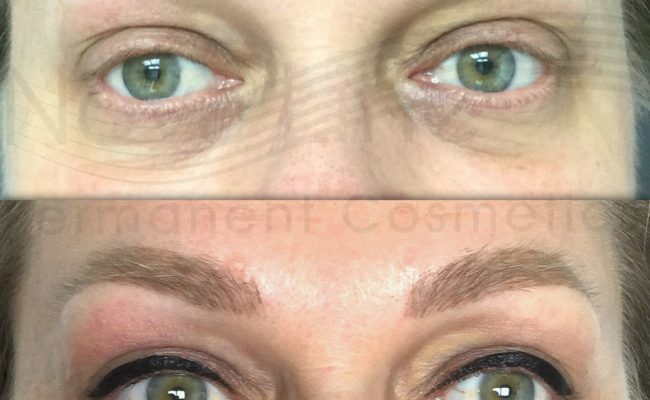 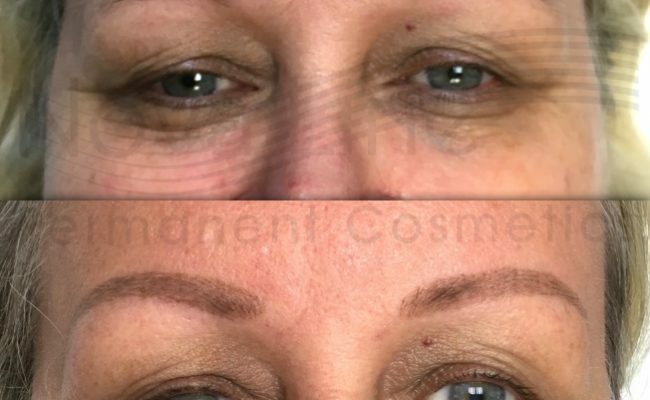 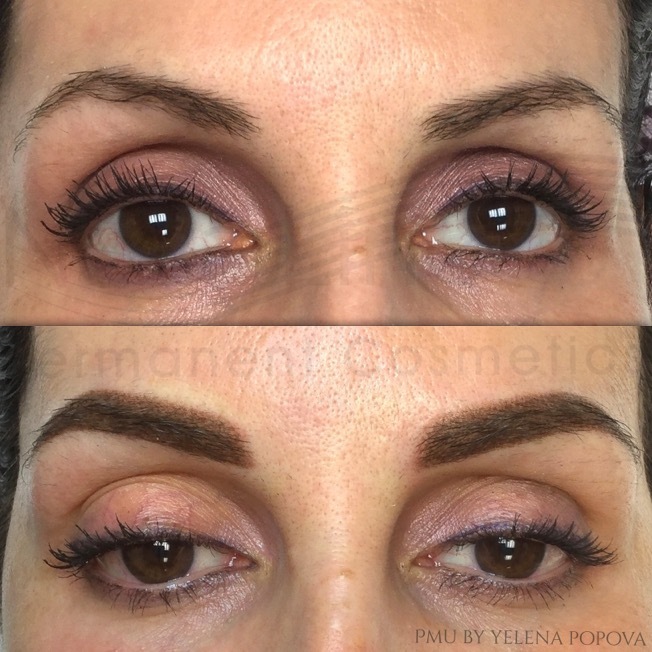 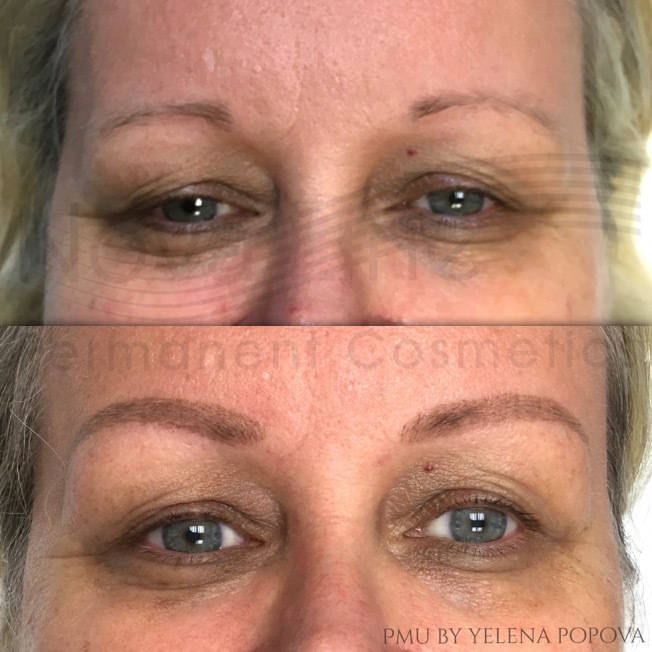 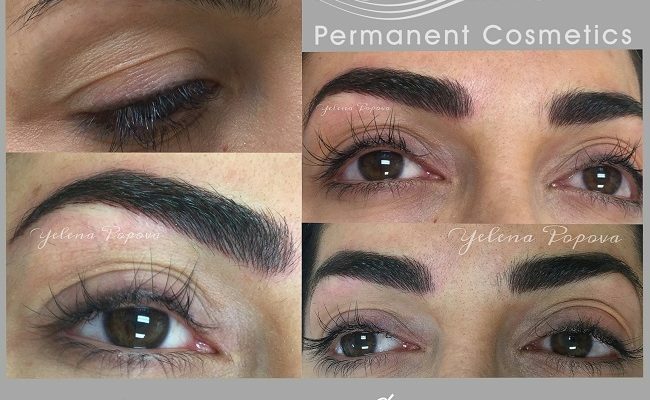 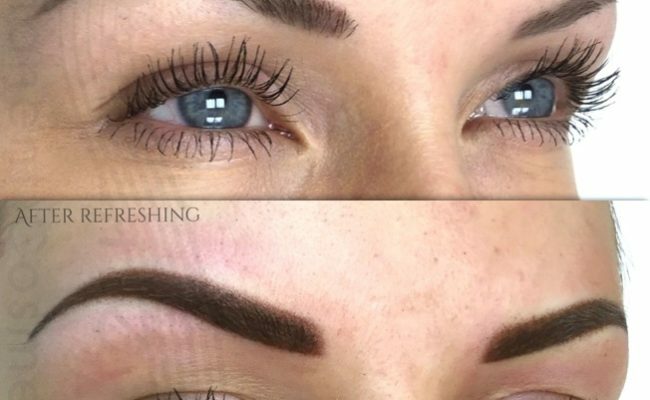 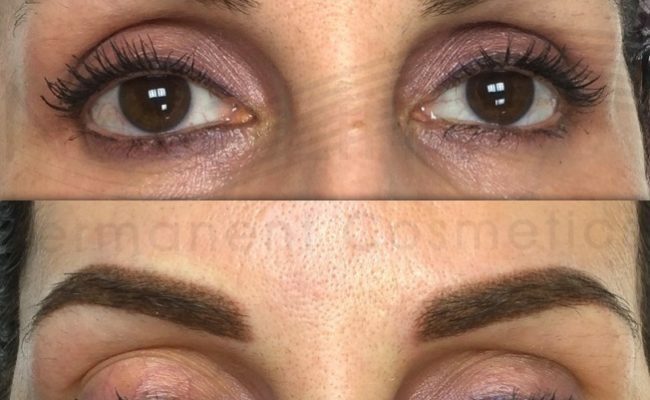 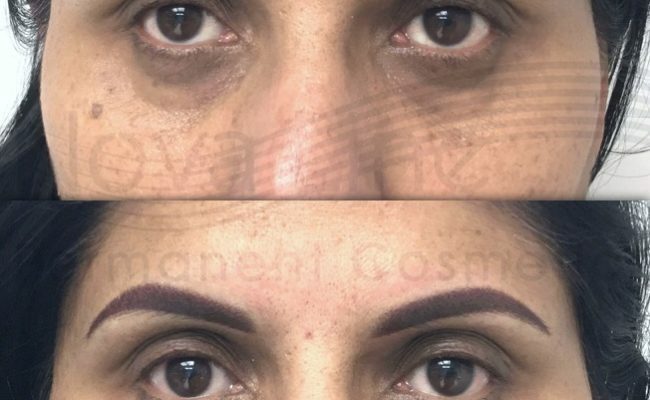 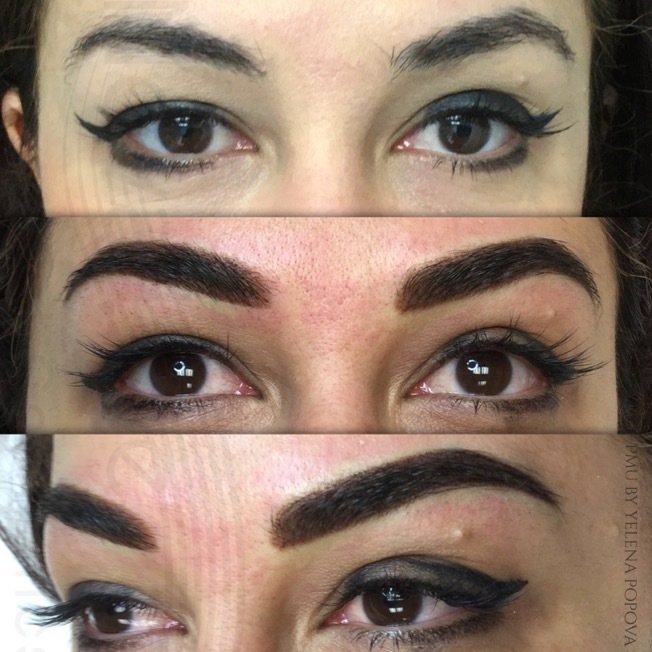 All the techniques above allow for beautiful, natural-looking permanent makeup eyebrows with no damage to the skin when done by a skilled professional. 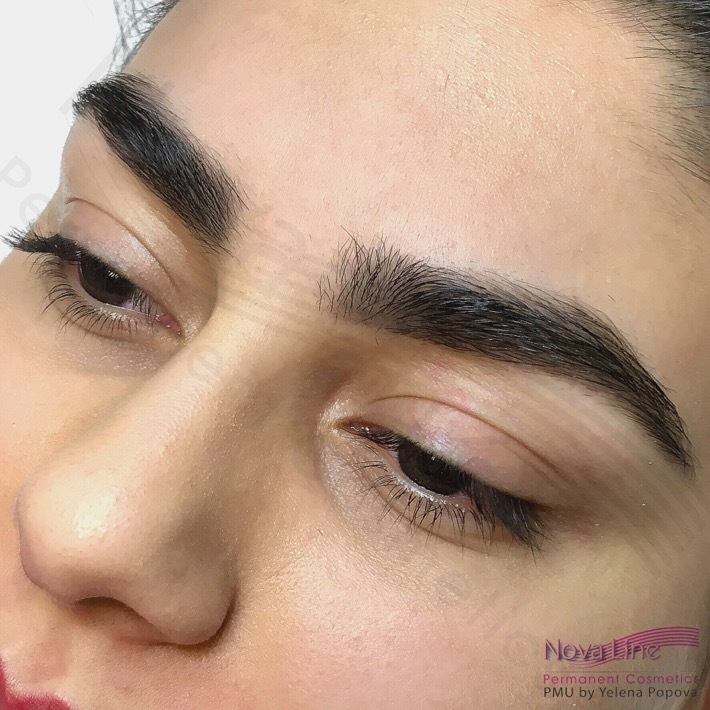 Our expert will help you to decide which type of eyebrow technique, shape and color to choose from according to your skin type and conditions during the consultation appointment. 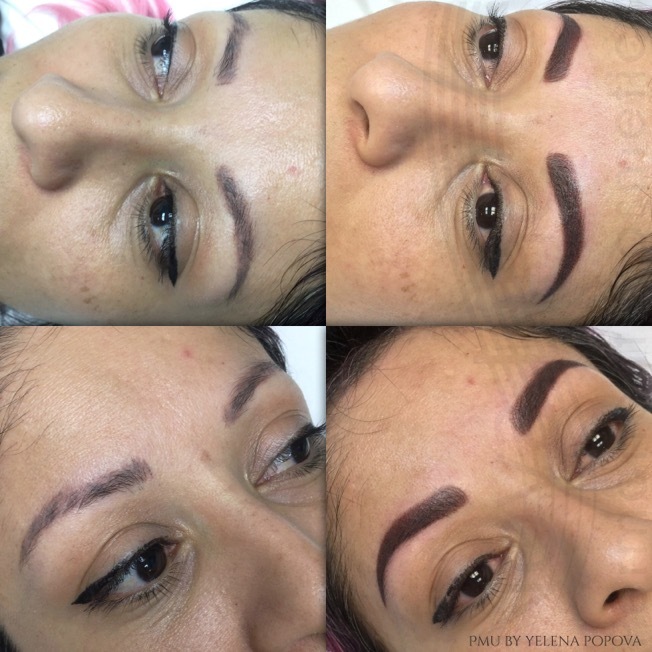 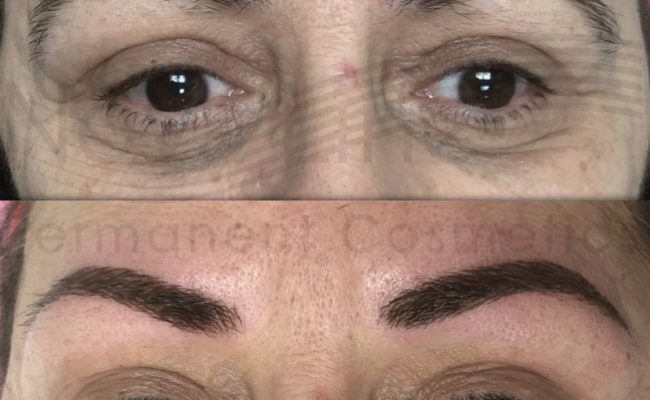 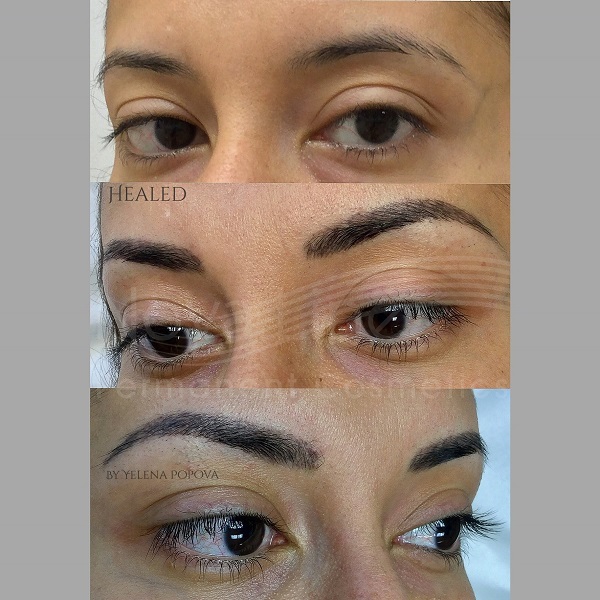 During this time, you will also discuss any previously done eyebrow tattoos so they can perform your procedure with the optimal results. 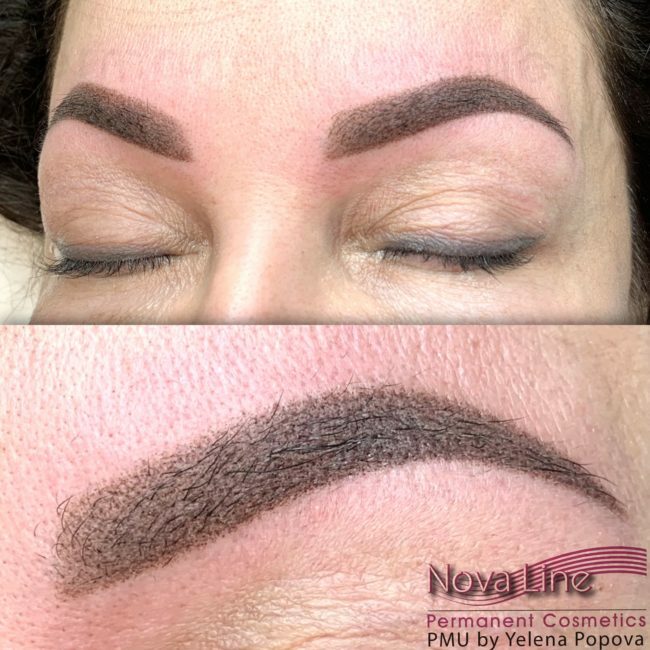 After all decisions are made, your artist will do a precise drawing of the eyebrow shape so you can see exactly what they will look like before they begin. 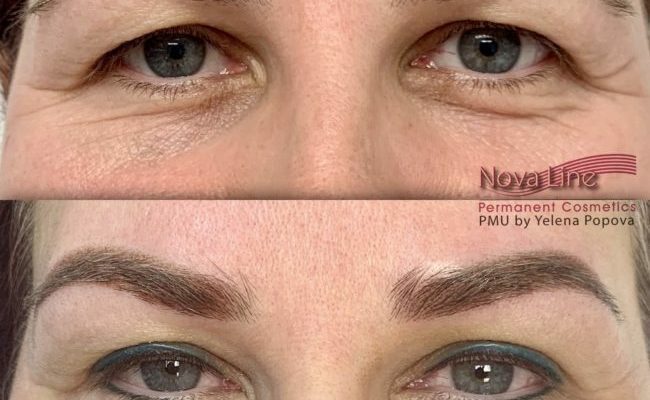 Be sure to choose the right professional who has years of experience and the specialized, "secret" knowledge of each procedure to ensure you get the best results! 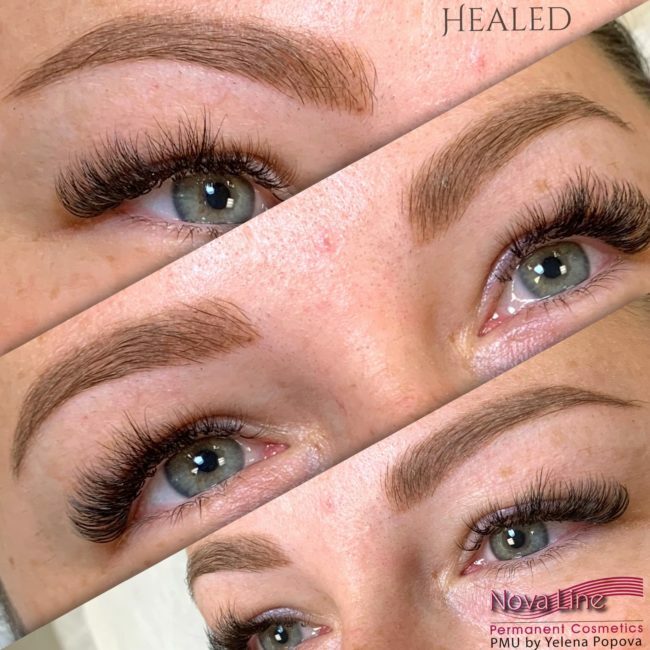 We welcome you to give us a call to schedule a consultation at (647) 883-6251. 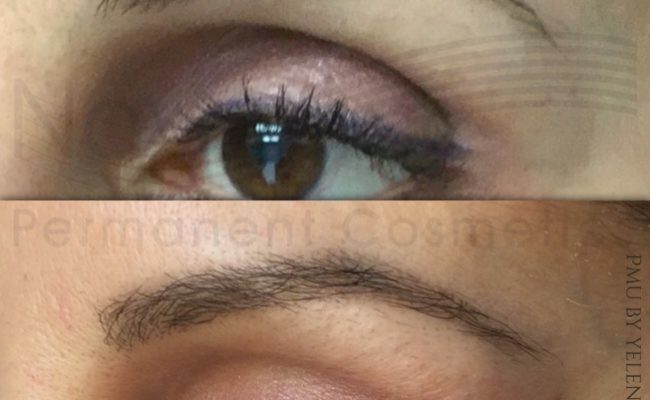 I have very very thin light eyebrows, hardly anything left on the edges. 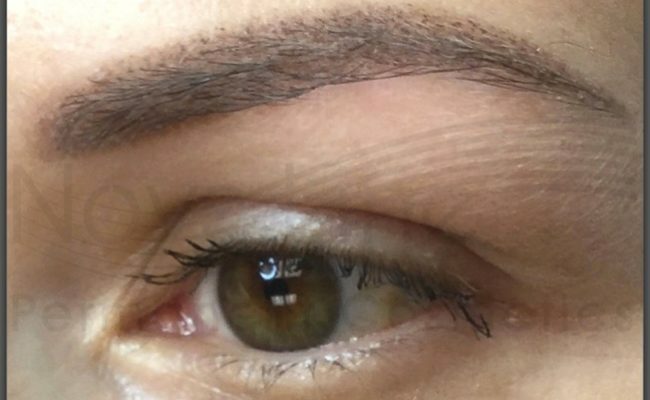 What is involved in dealing with this and how much does it cost. 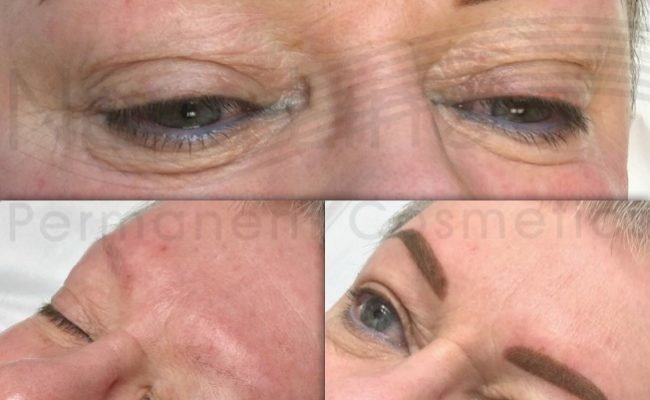 Hello, Yes, I use the best on the market professional topical anaesthetics to make you feel comfortable. 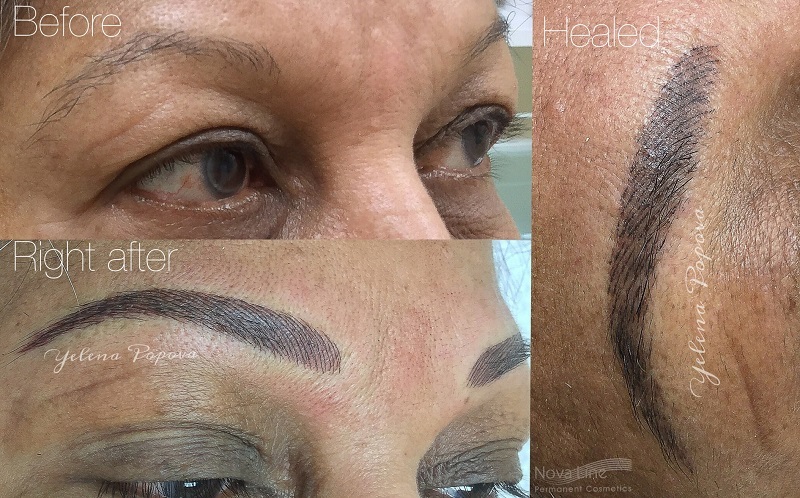 How long does the eyebrow tattoos last ? 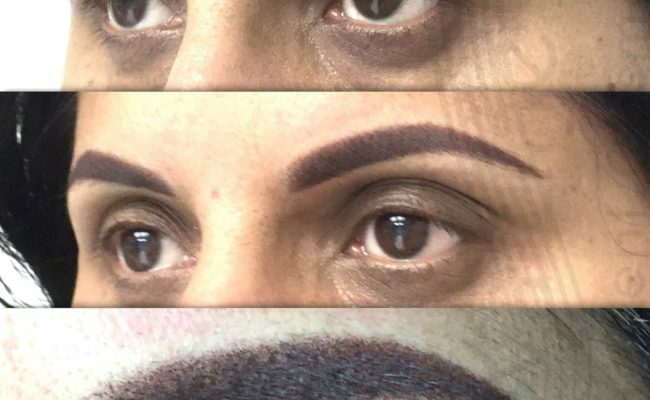 How much is the full & touch up prices ? 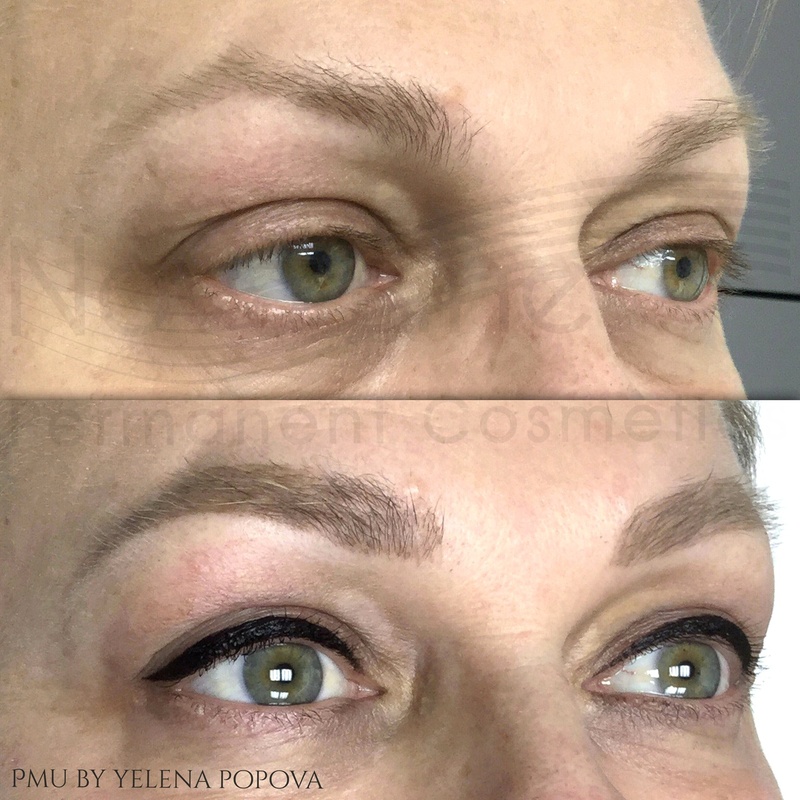 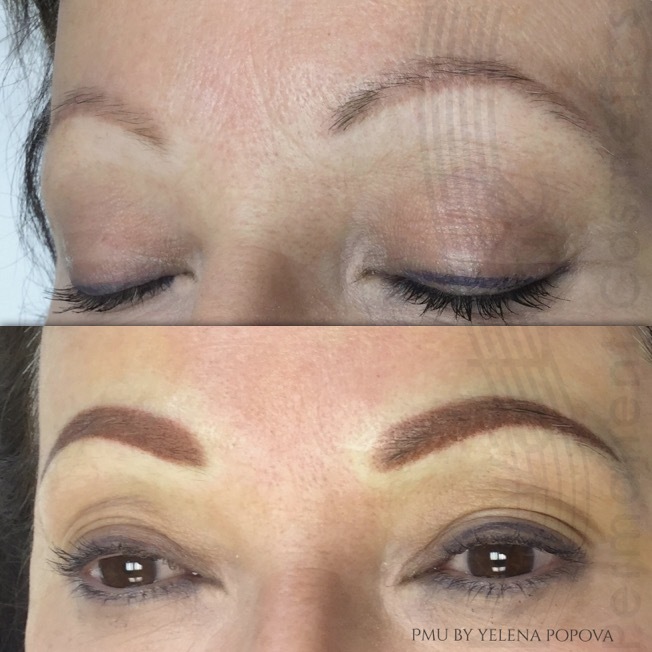 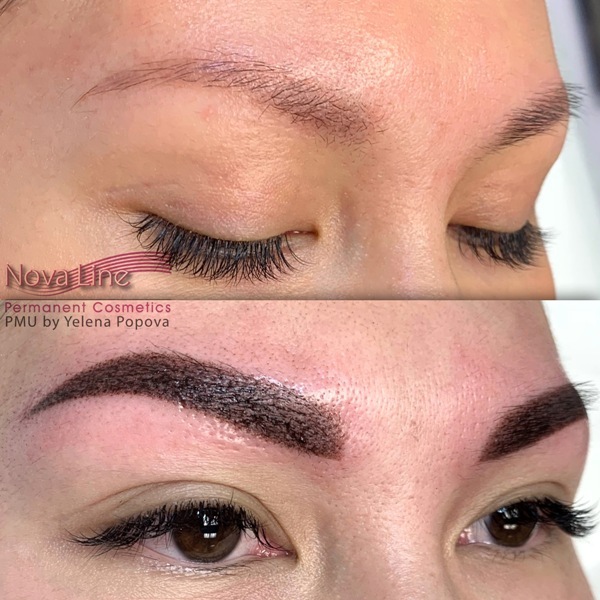 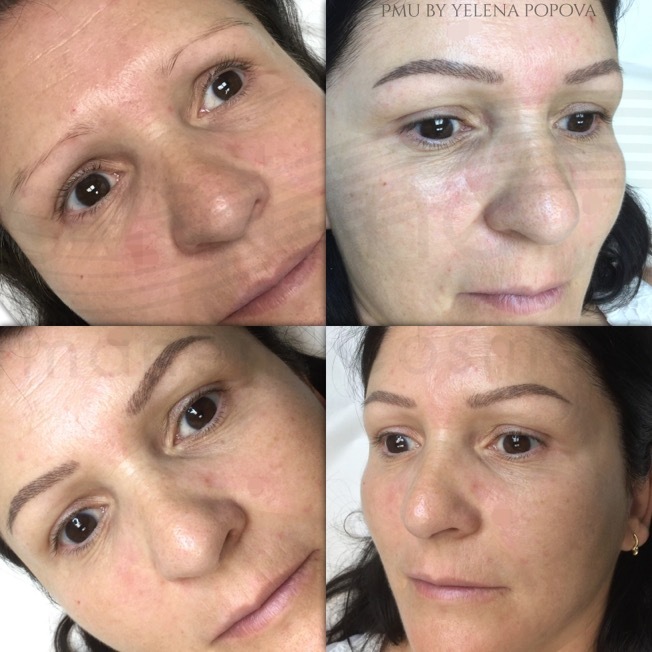 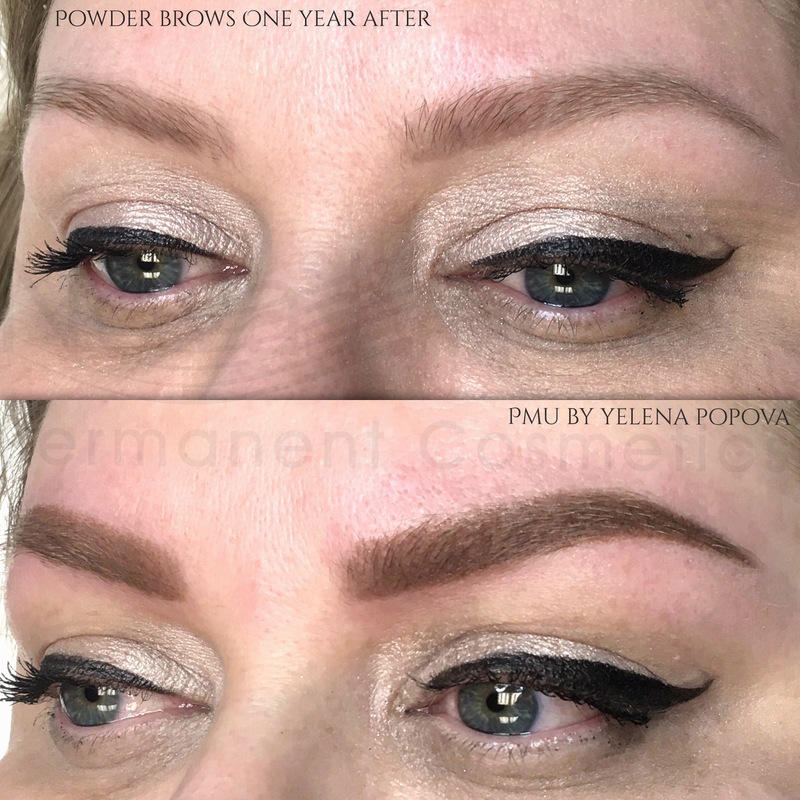 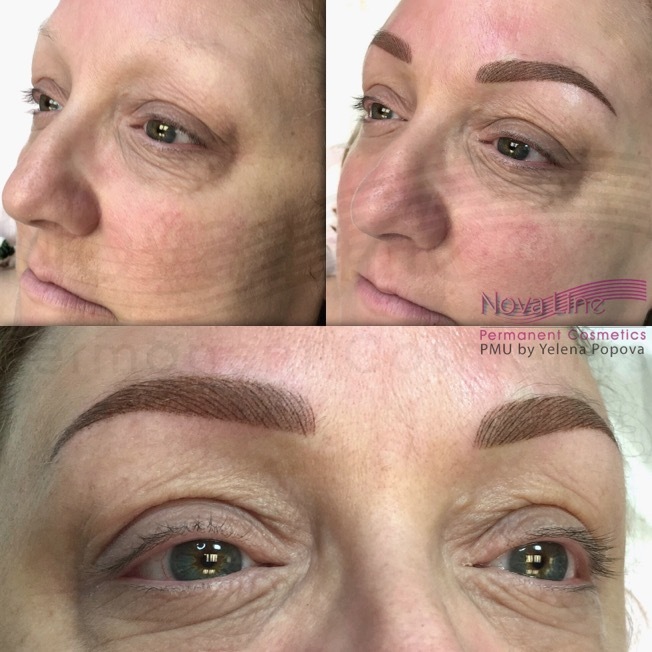 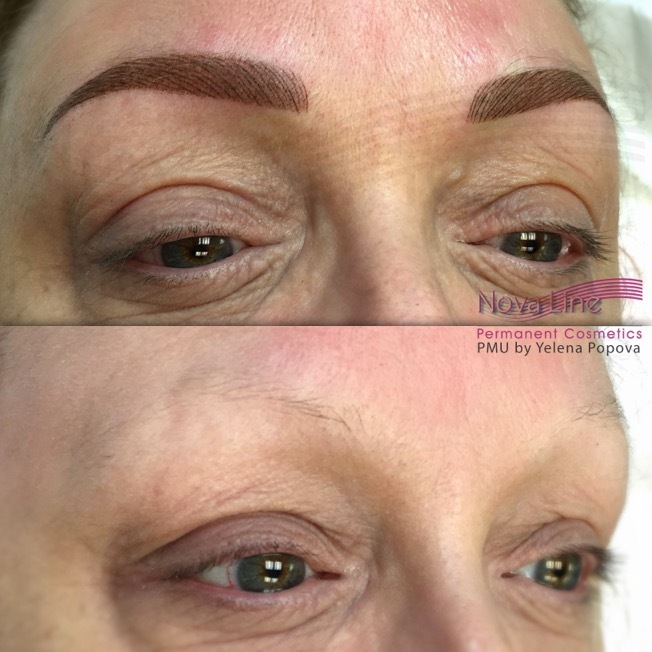 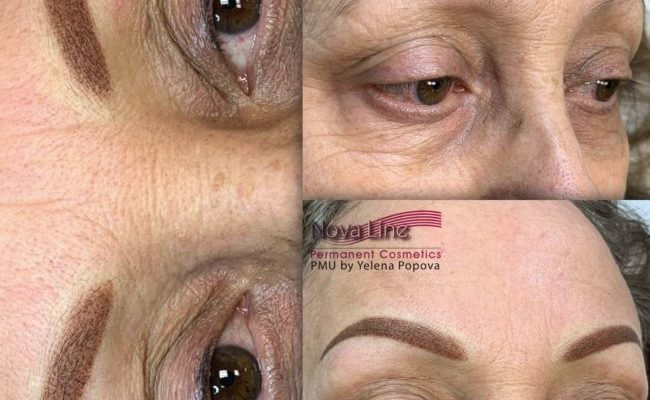 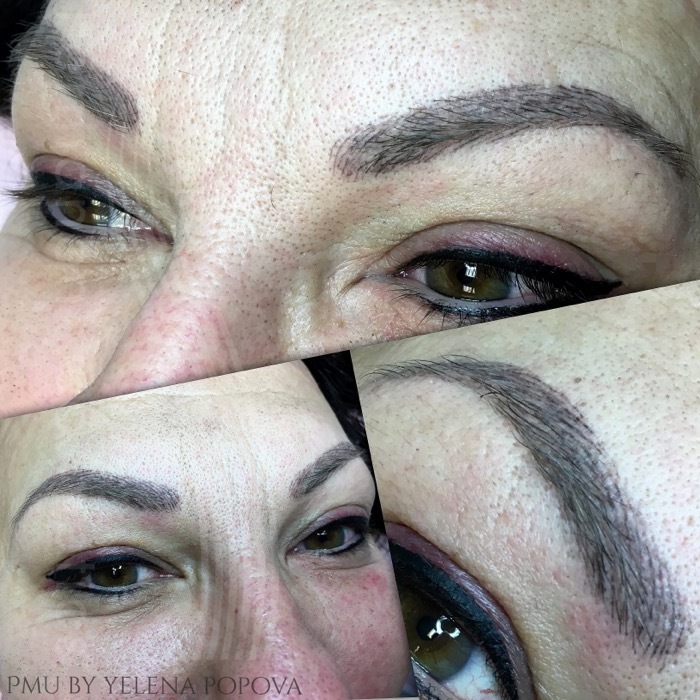 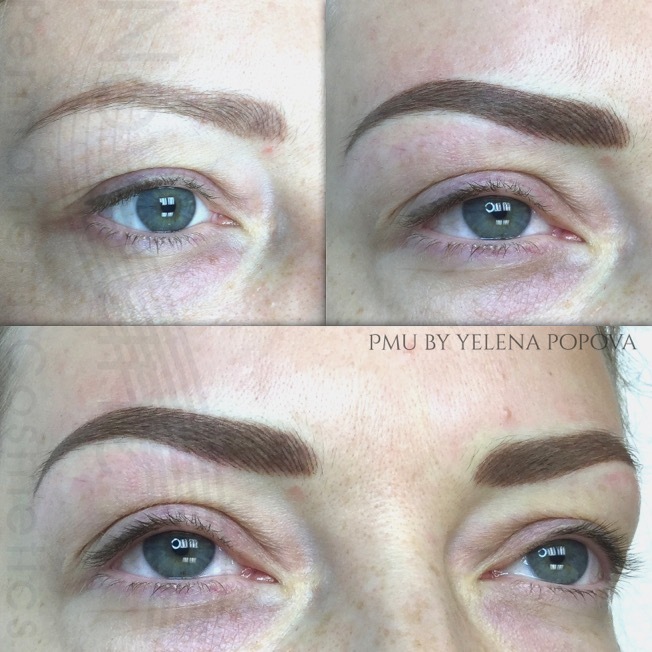 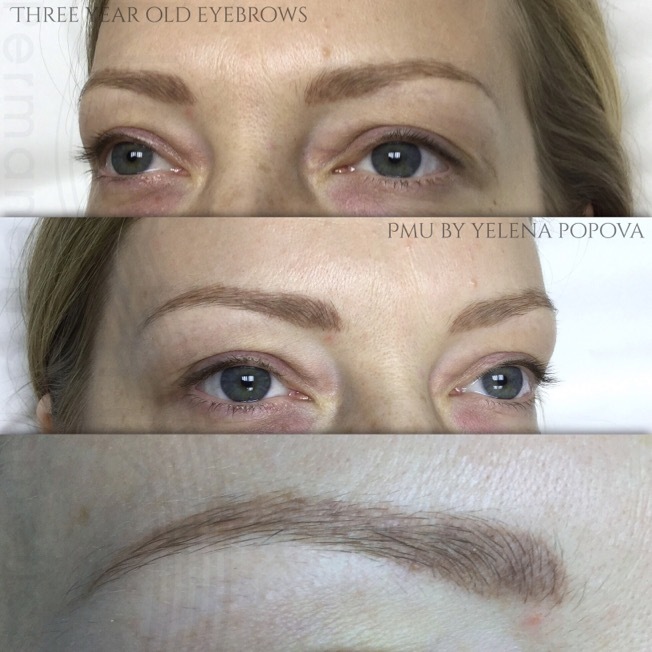 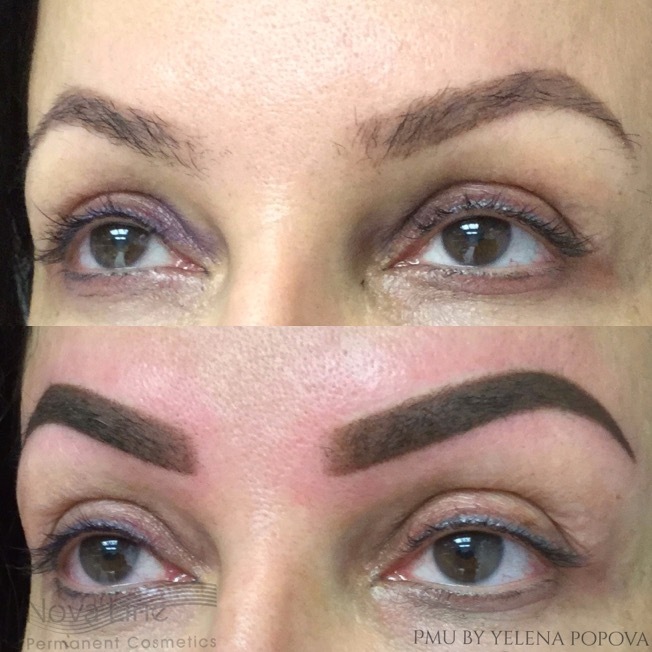 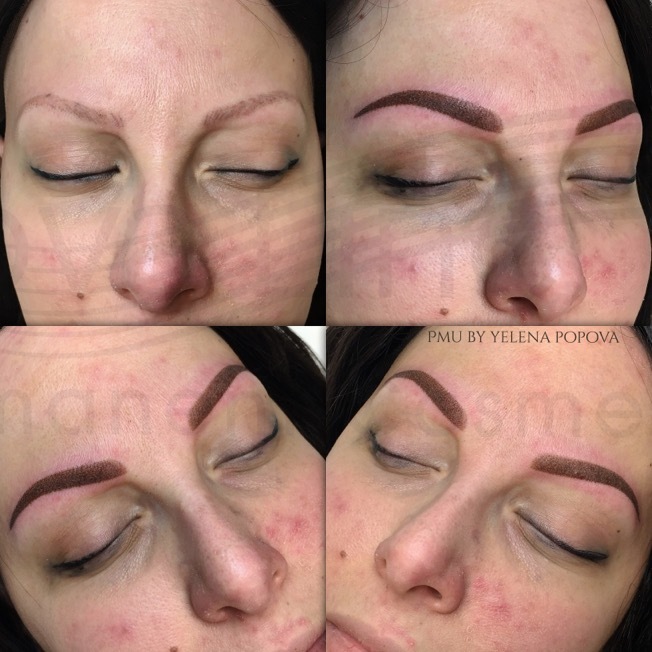 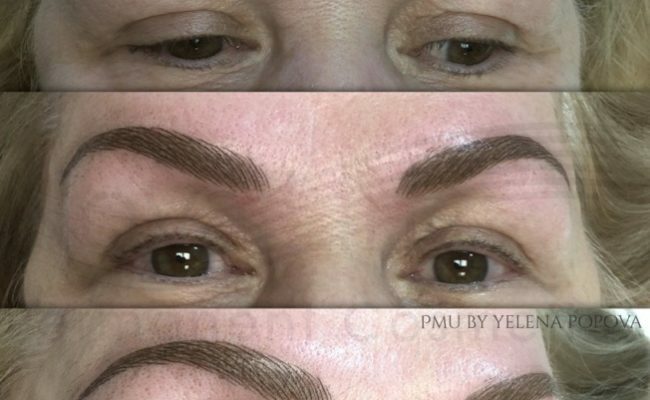 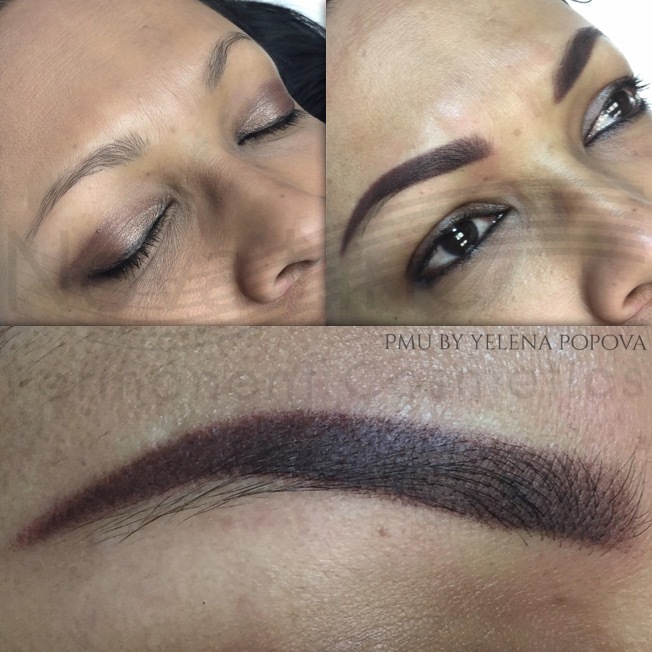 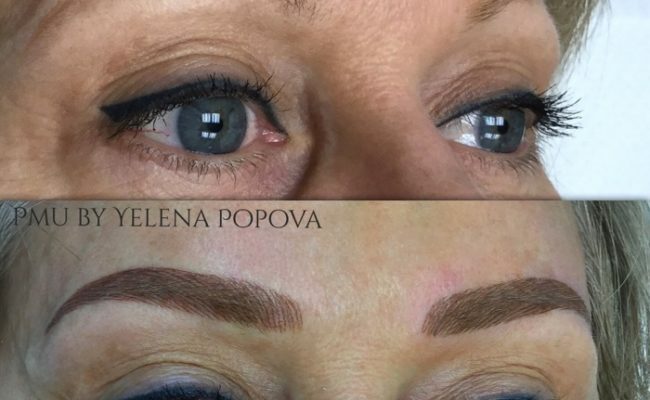 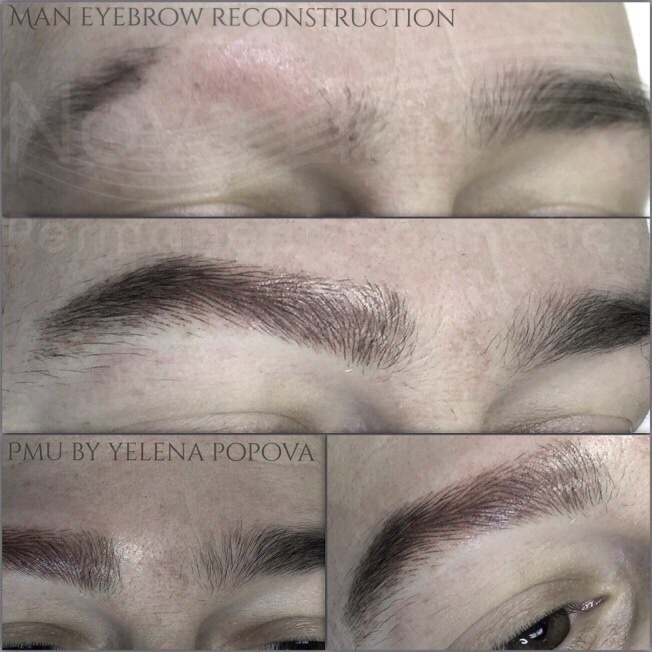 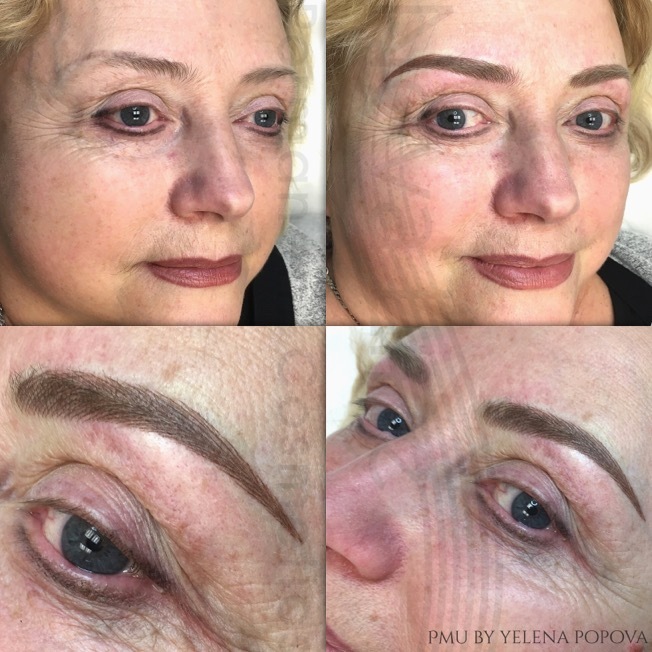 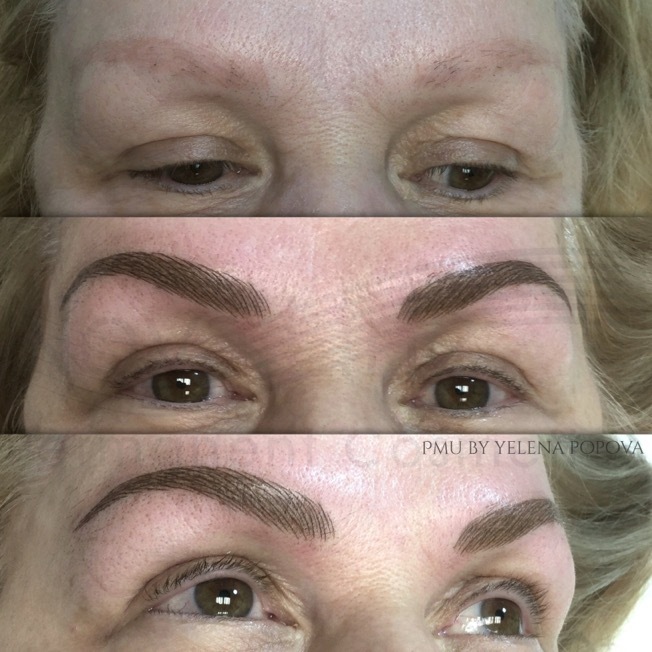 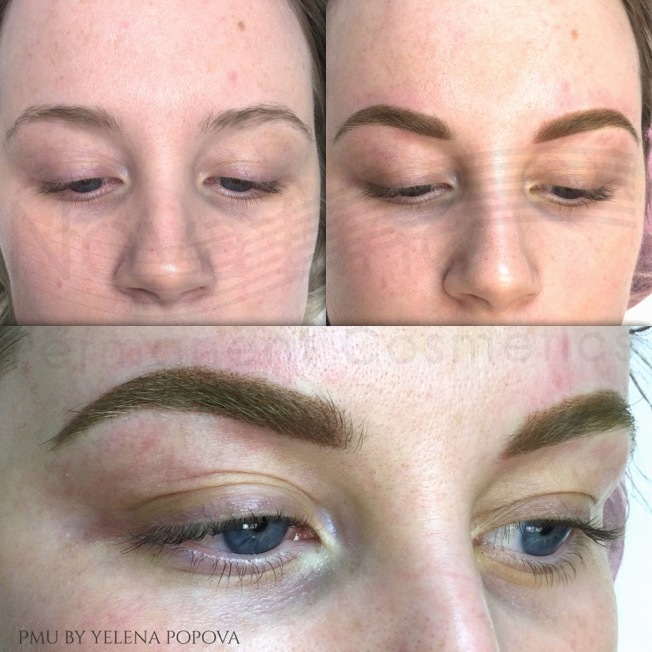 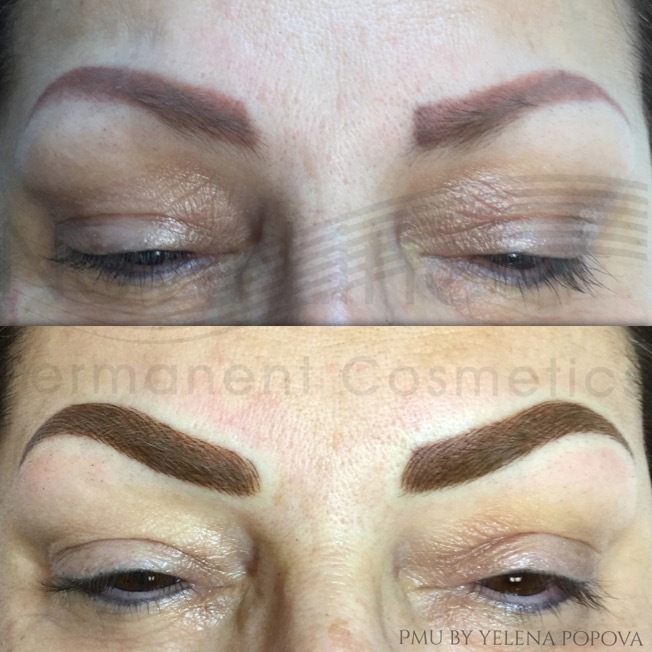 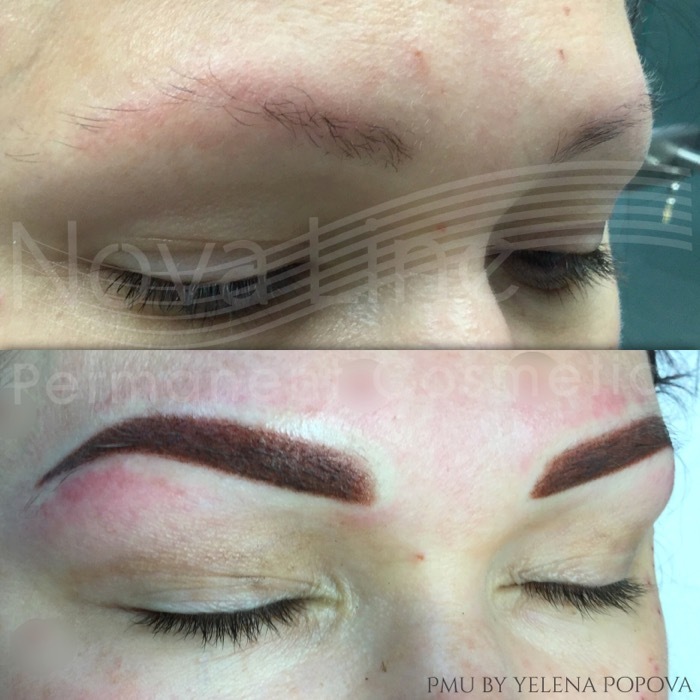 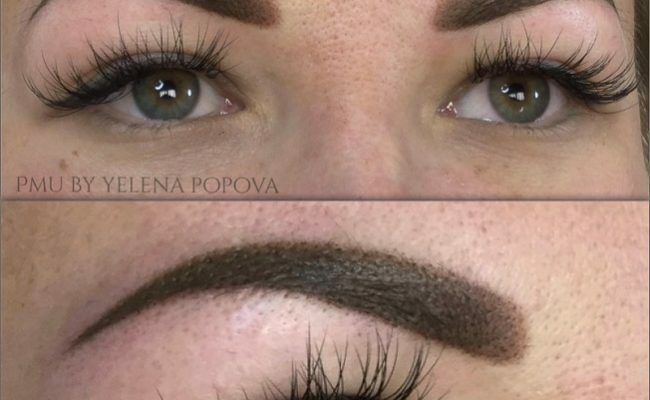 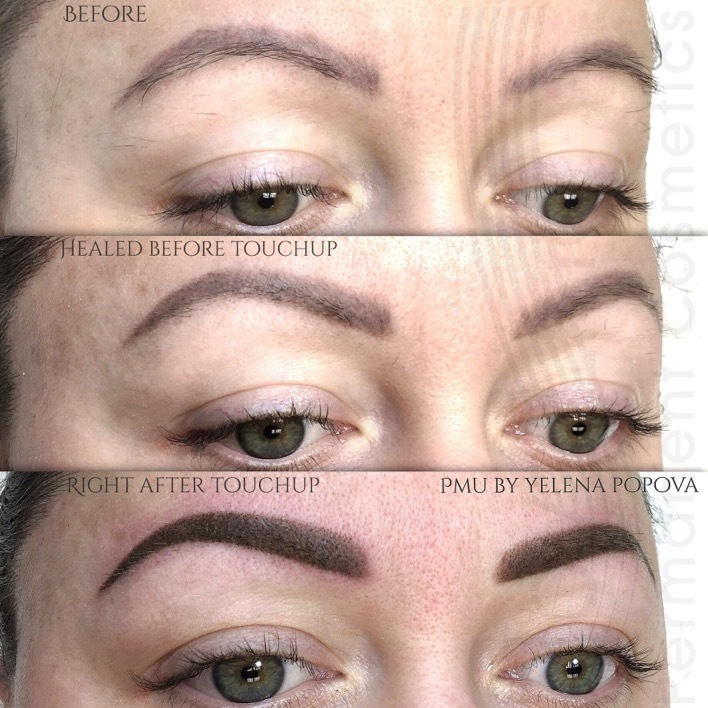 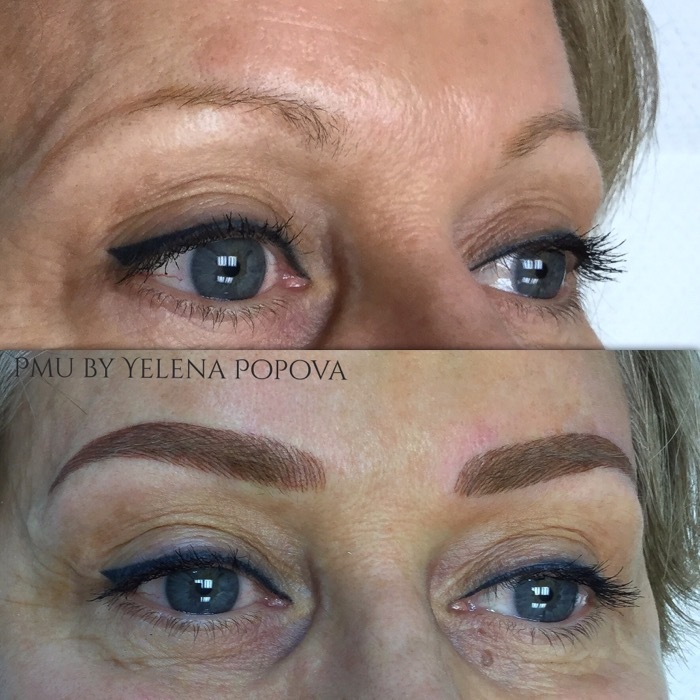 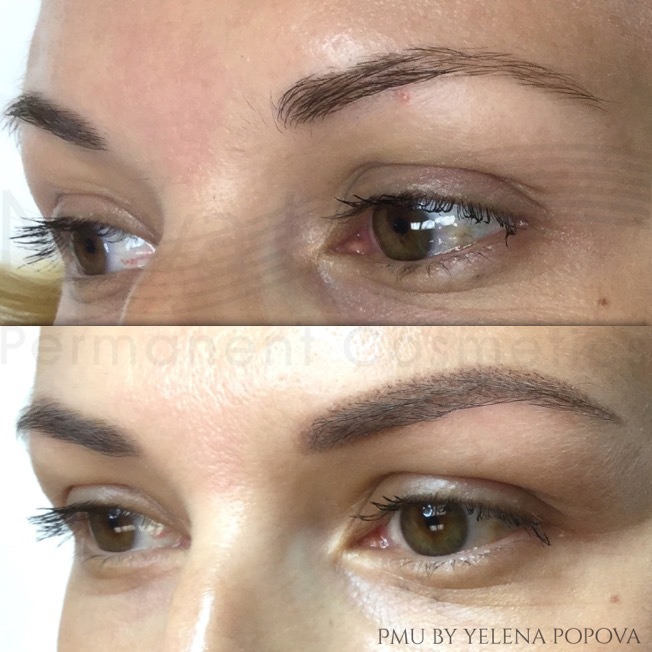 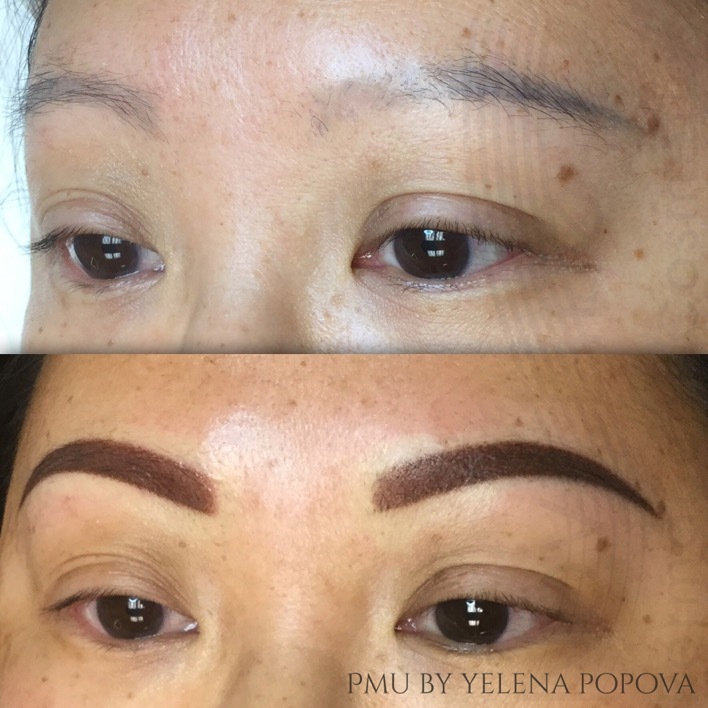 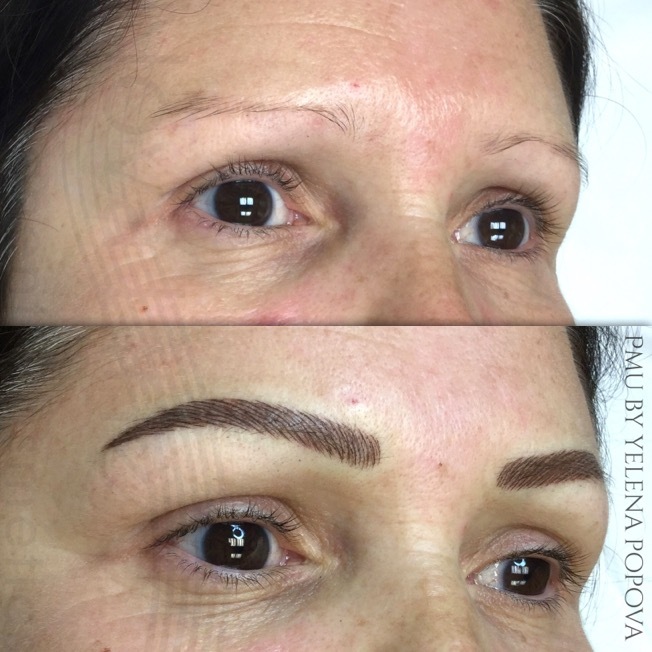 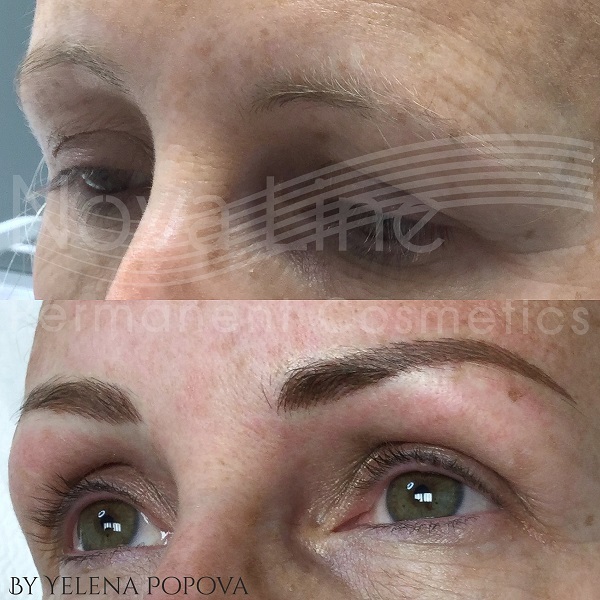 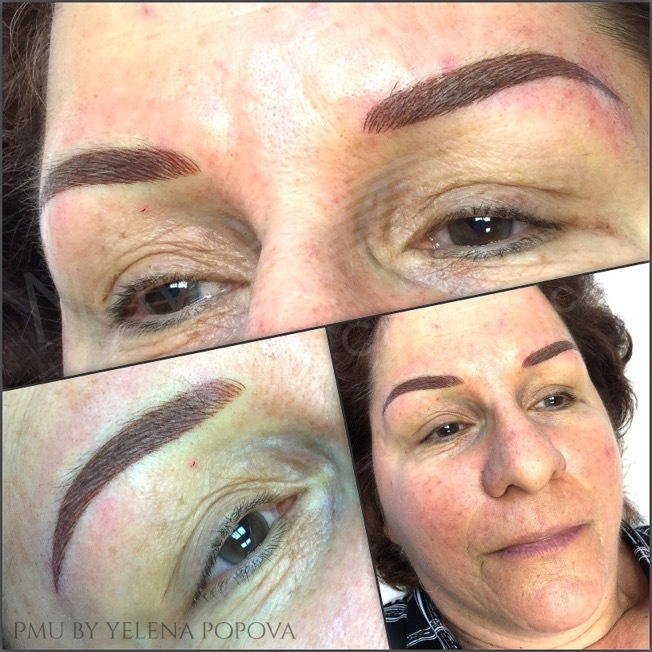 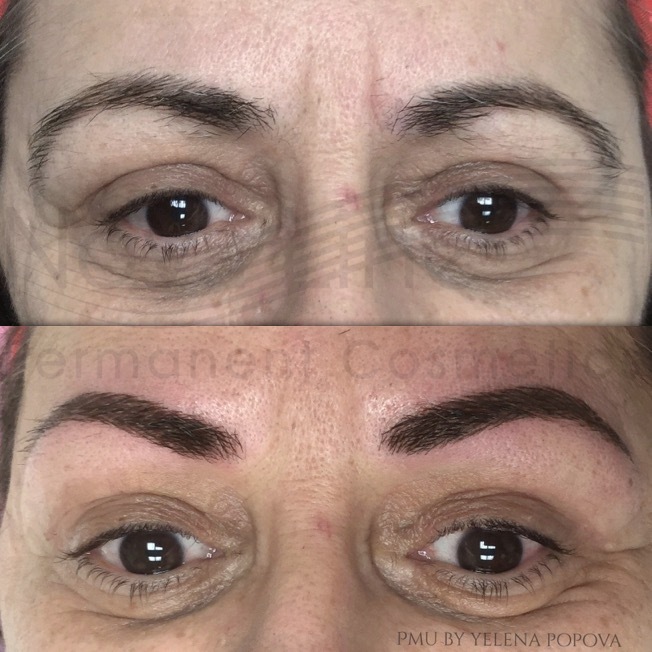 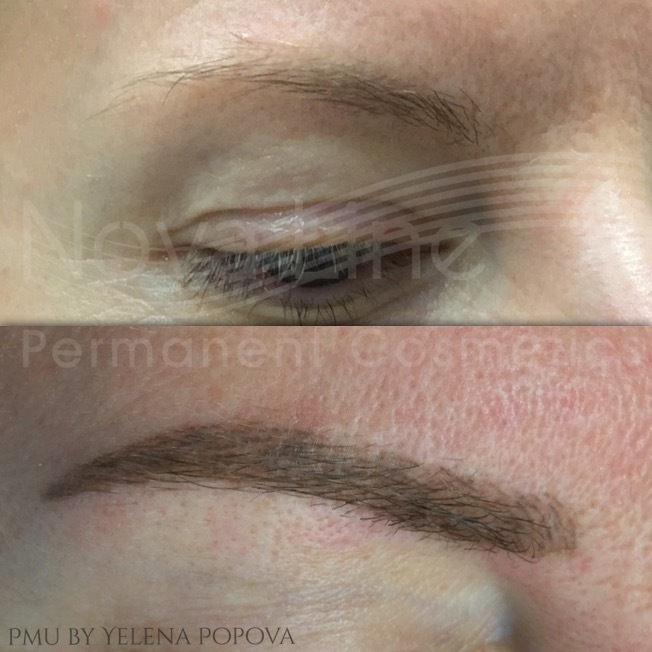 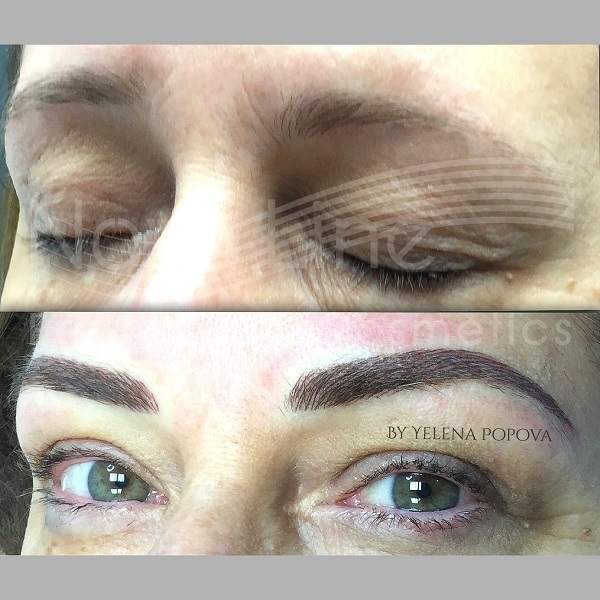 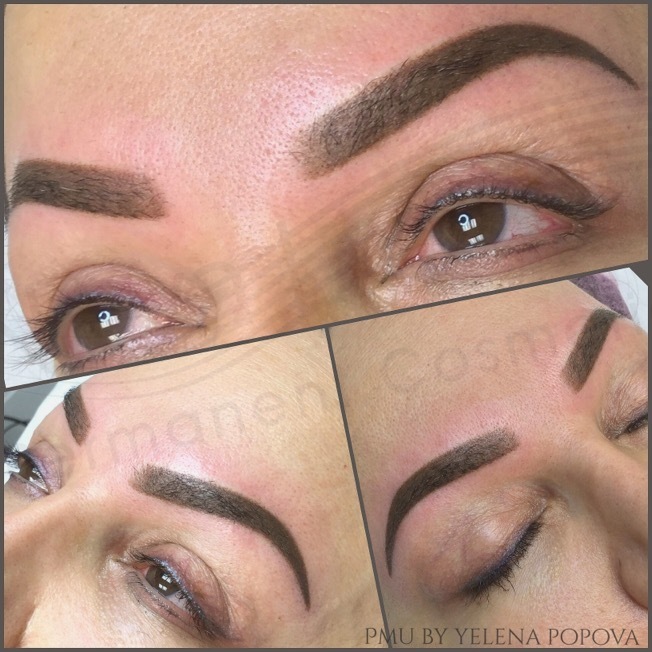 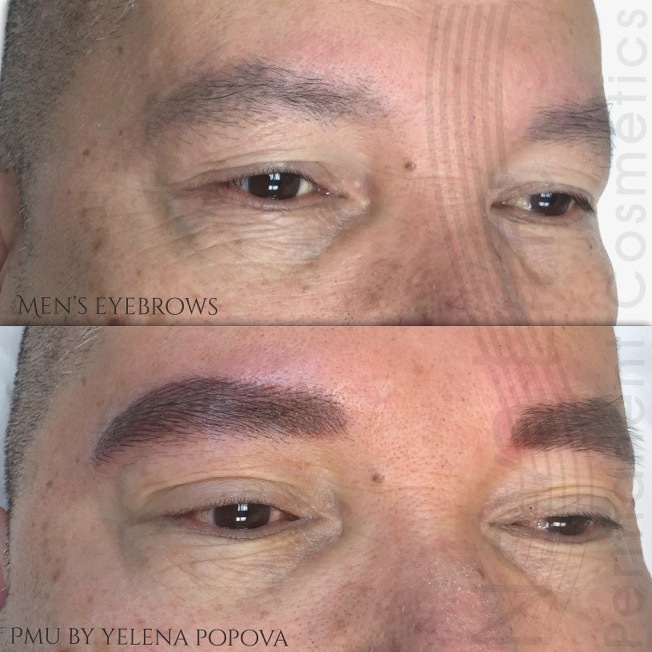 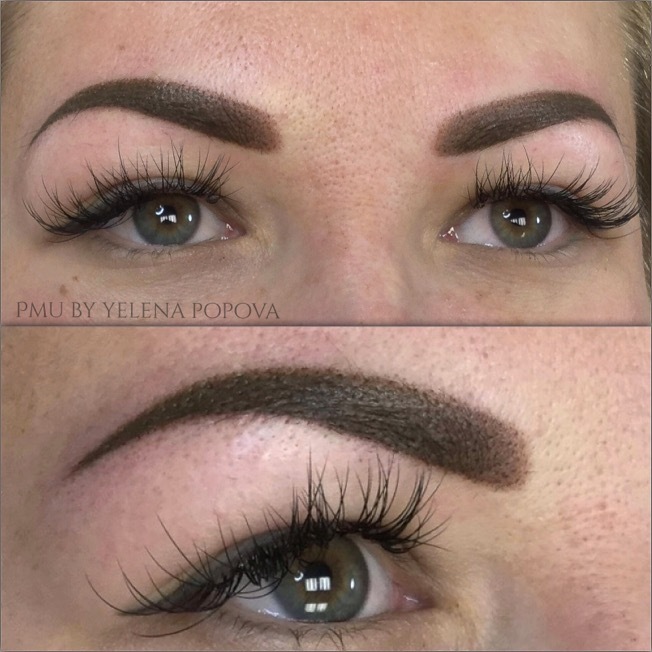 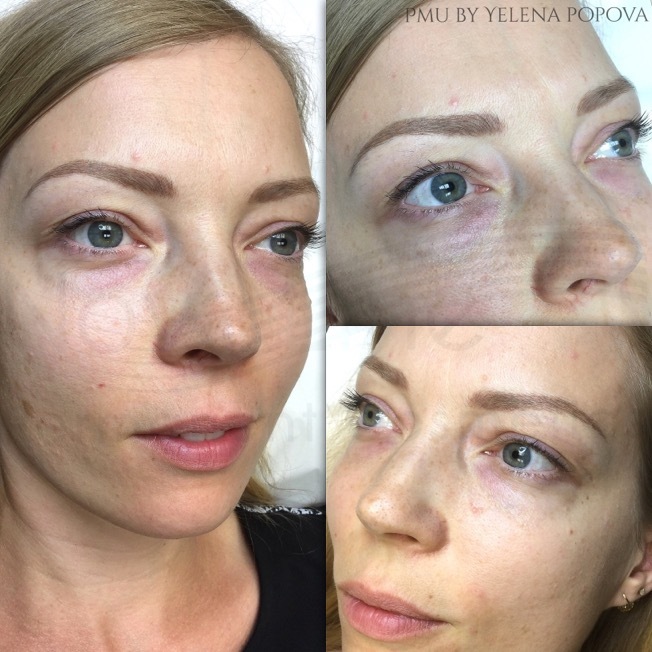 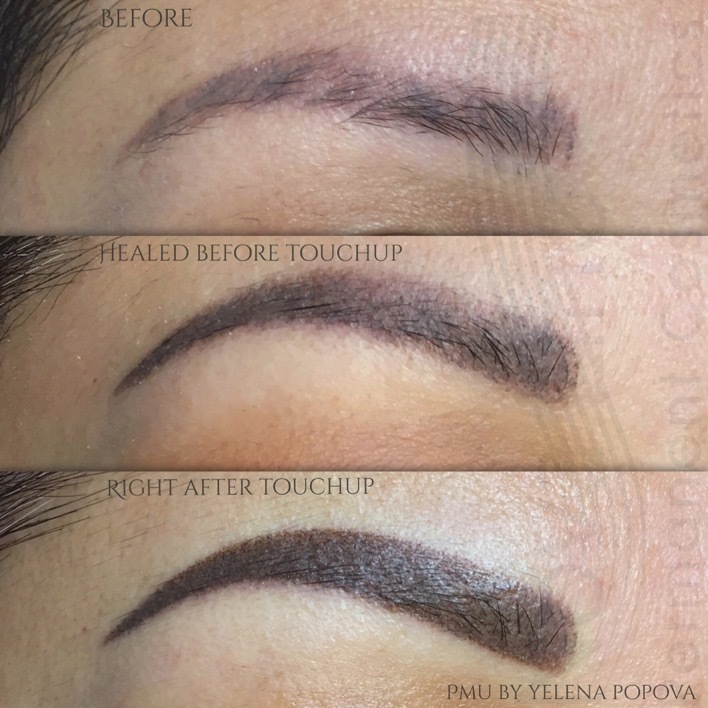 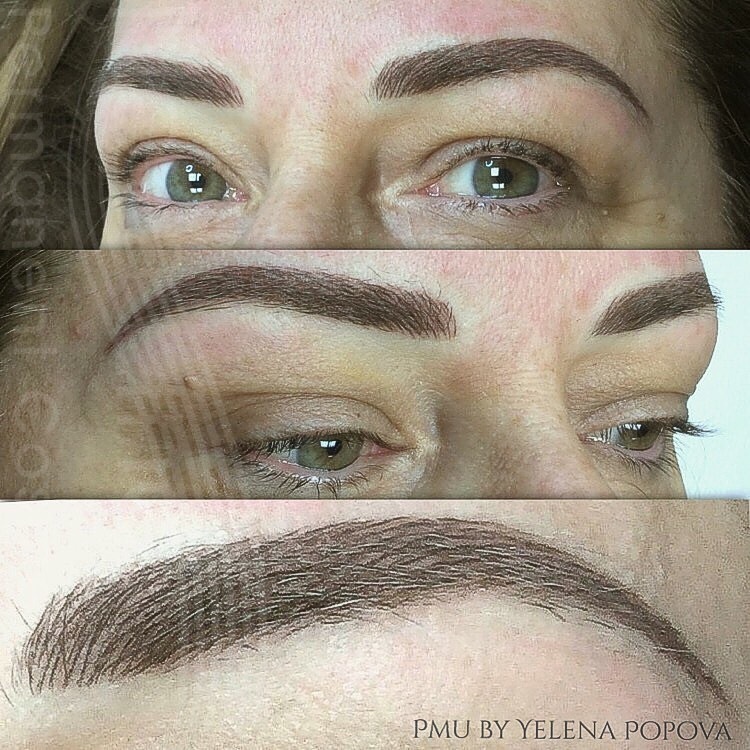 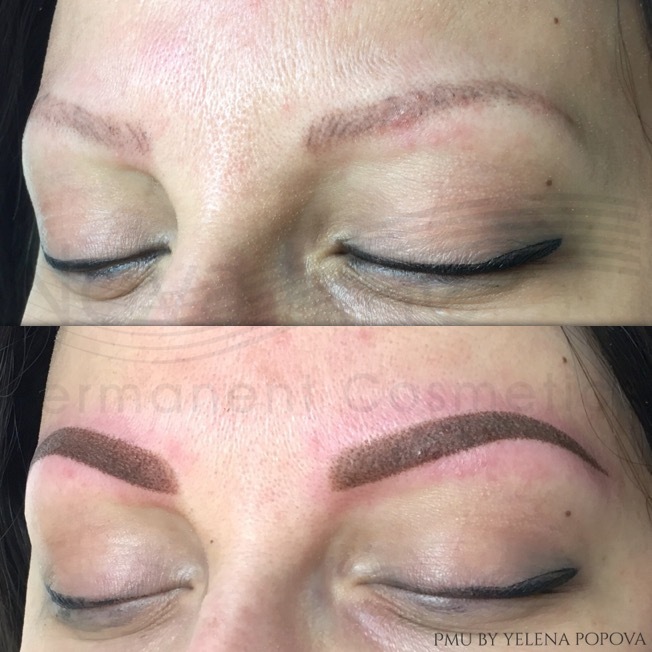 Hi Yelena,I had the feathering technique done on my eyebrows many years ago and the colour is almost gone. 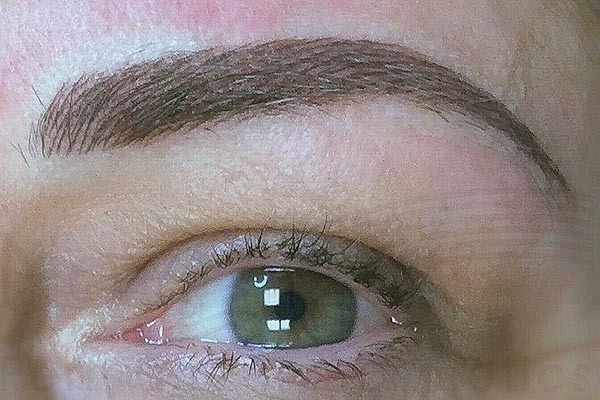 I am interested in having it done again. 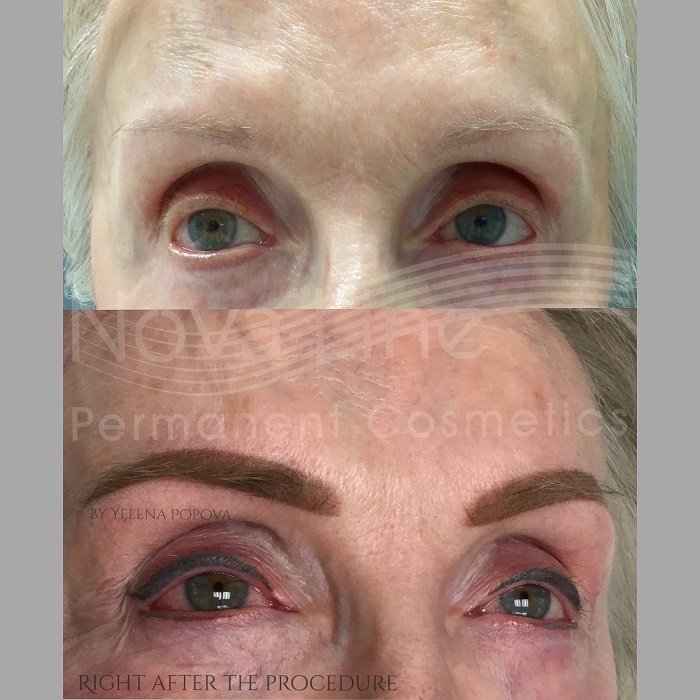 I am going out of the country for 3 months, so I should probably wait until I get back in March to do the procedure. 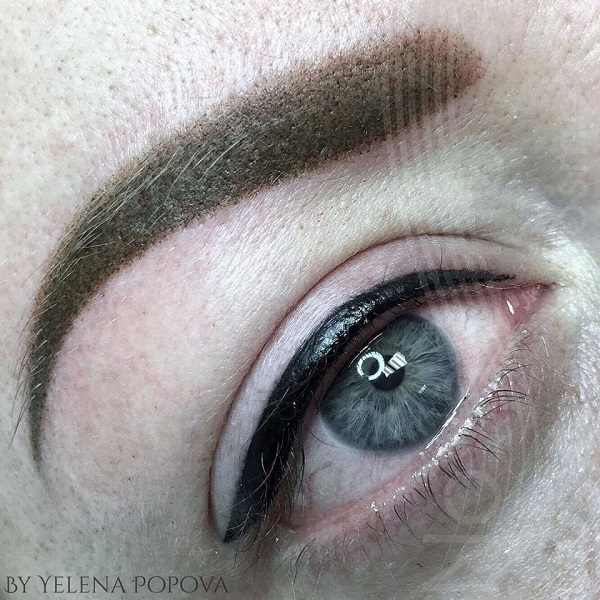 I also want to find out about the smokey eyeliner. 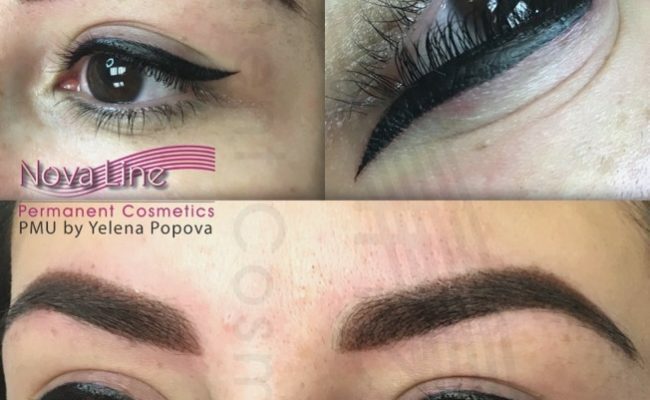 Will the pricing change in March, or could I book it now and get the present pricing? 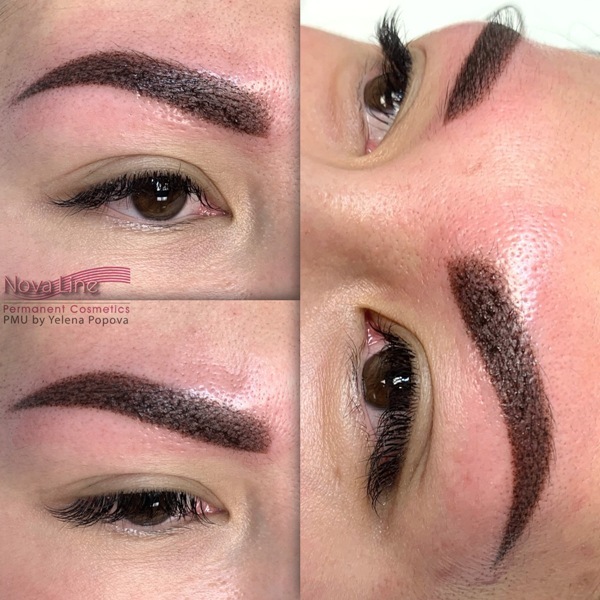 Hello, Yes price is still $450 incl taxes till March 15th. 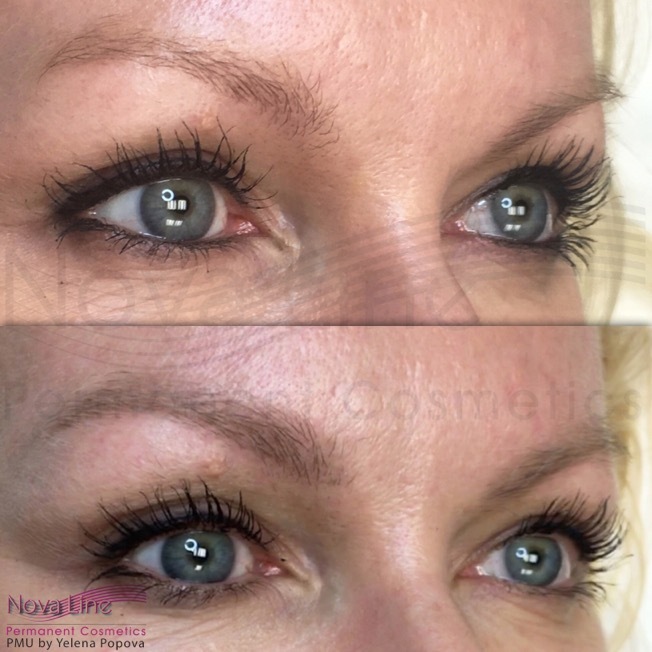 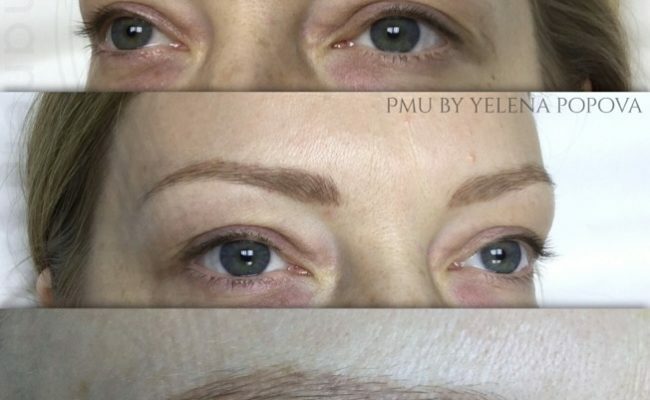 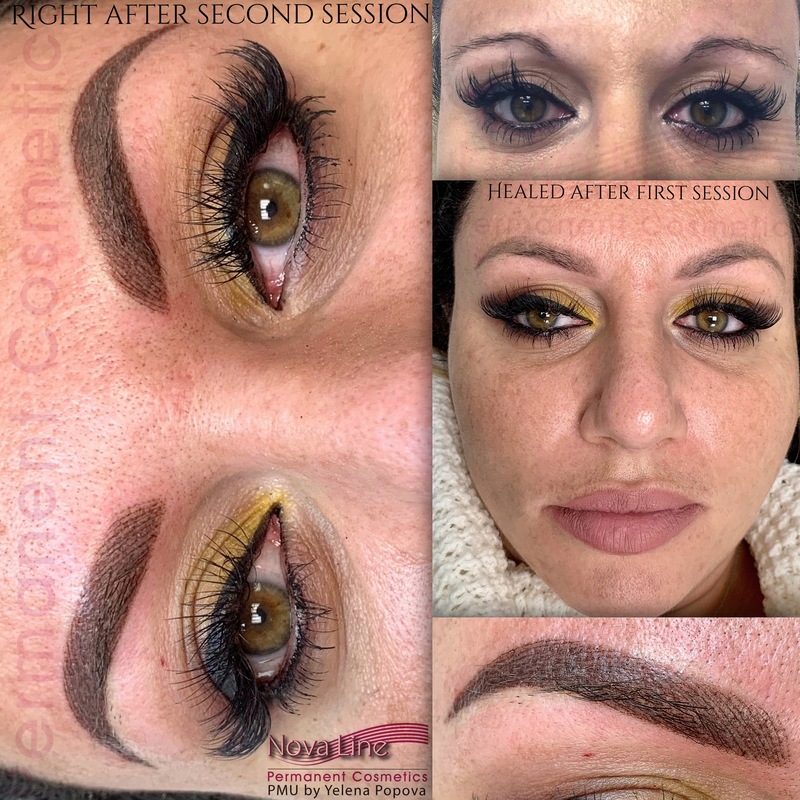 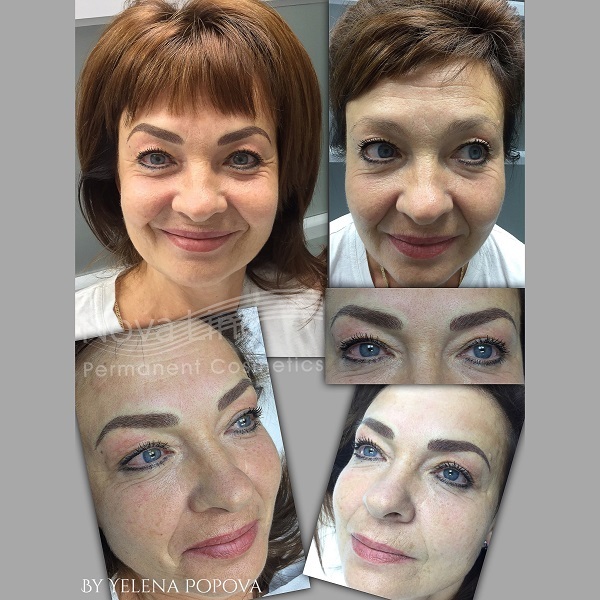 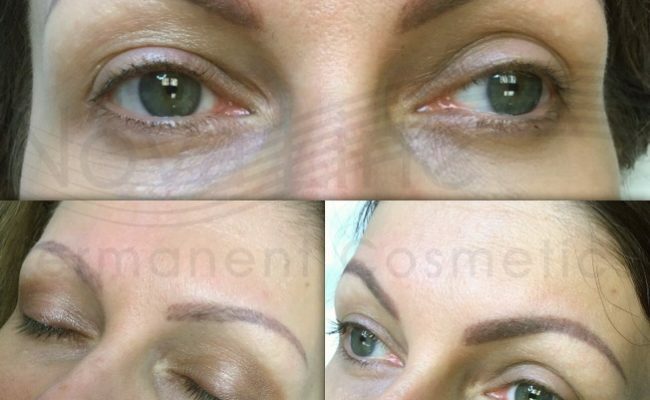 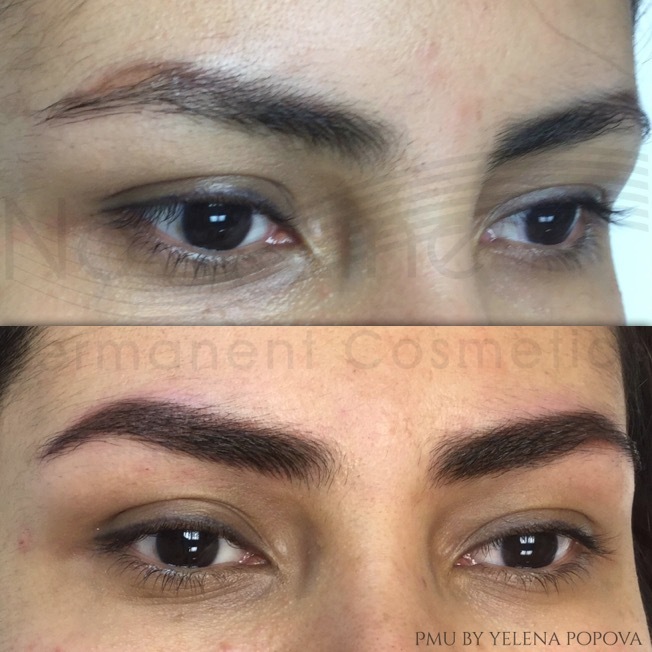 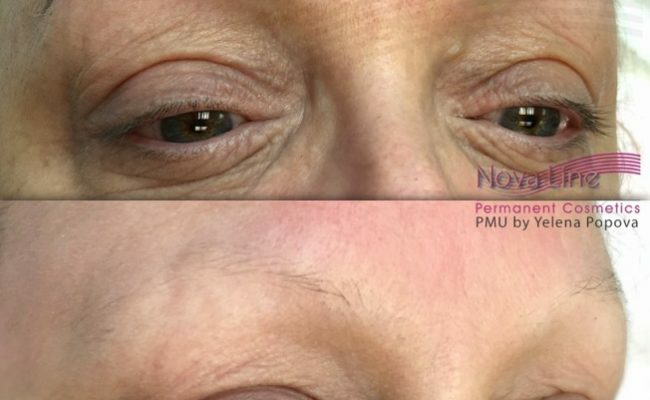 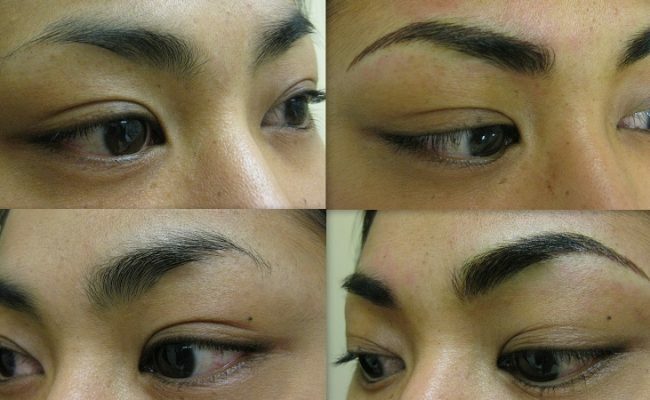 Hello, permanent makeup lasts years, just lightens with the time. 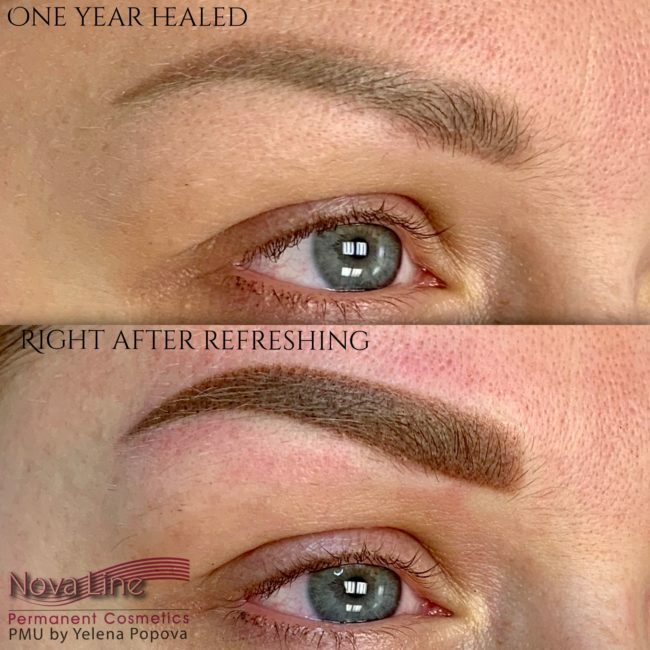 Colour boost recommended every 2 years. 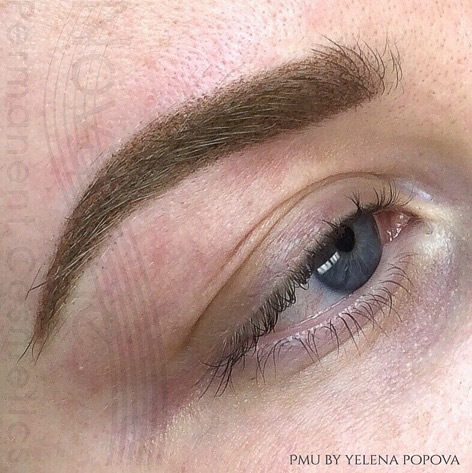 Hi, I 'm interested to have my eyebrows done . 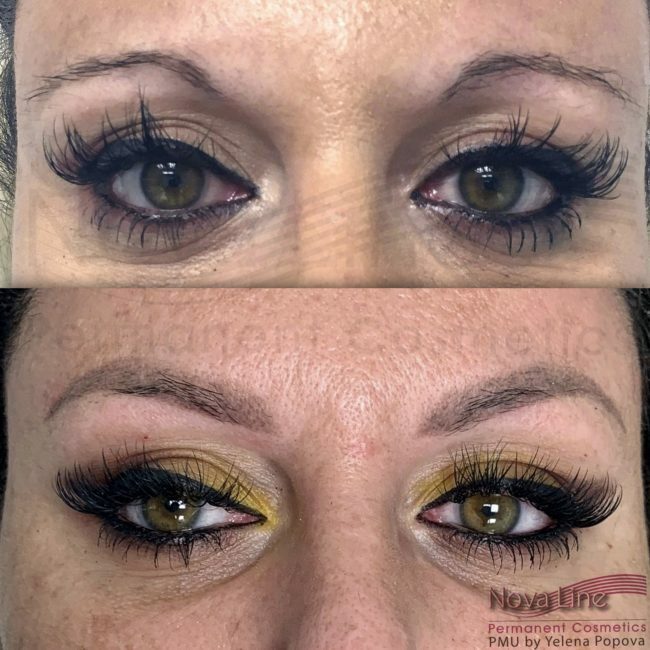 Is the price still $450 including tax? 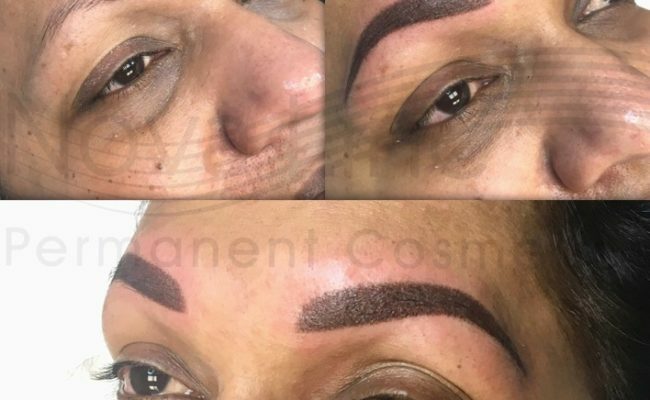 If so, when can I come for consultation?